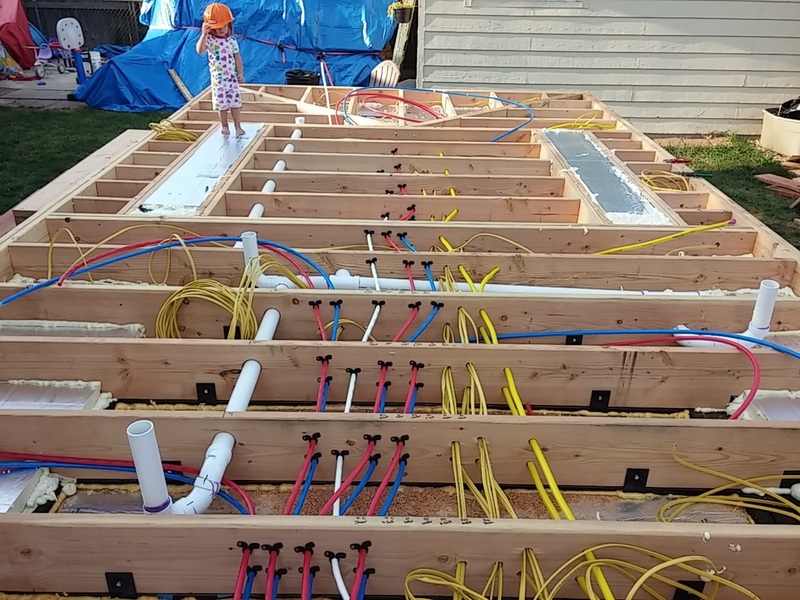 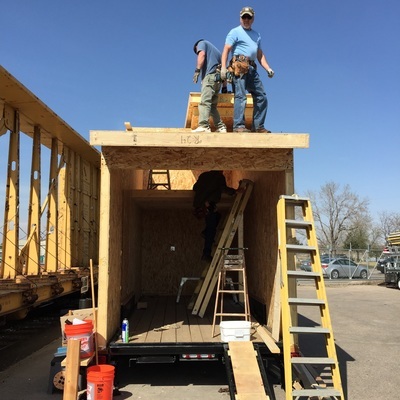 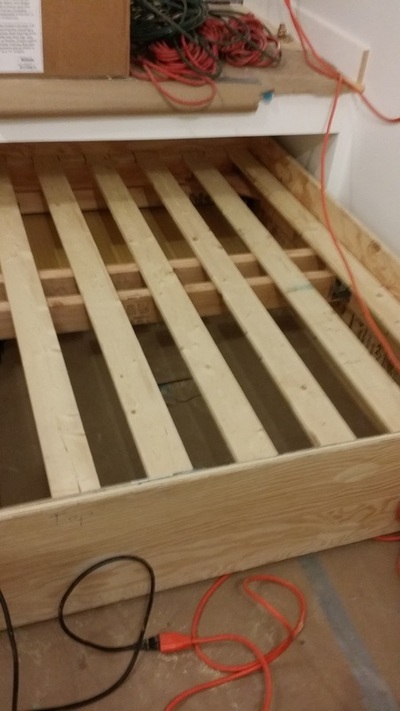 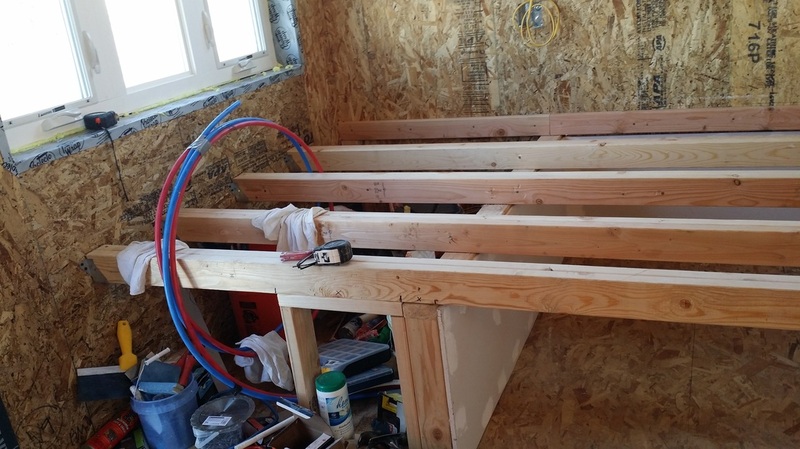 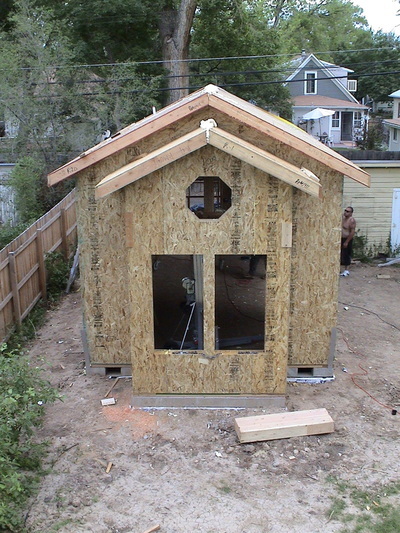 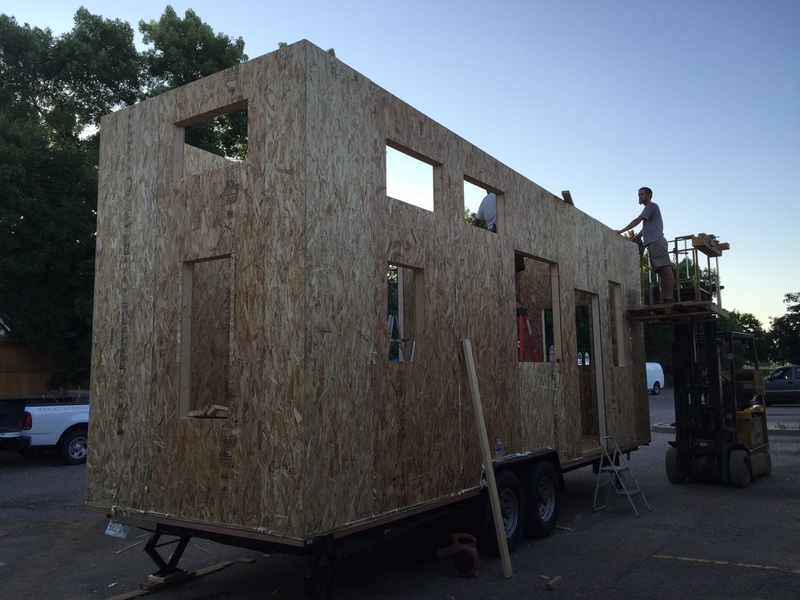 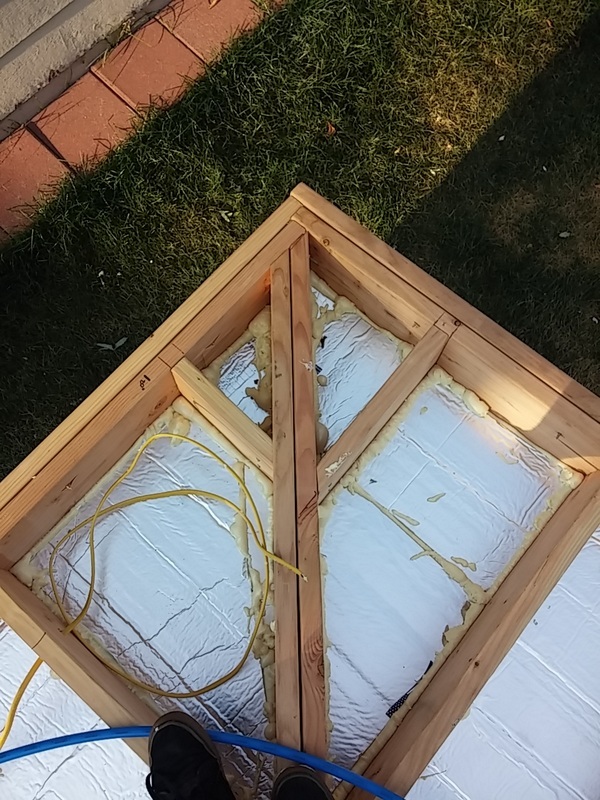 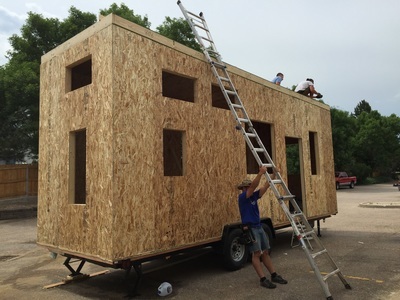 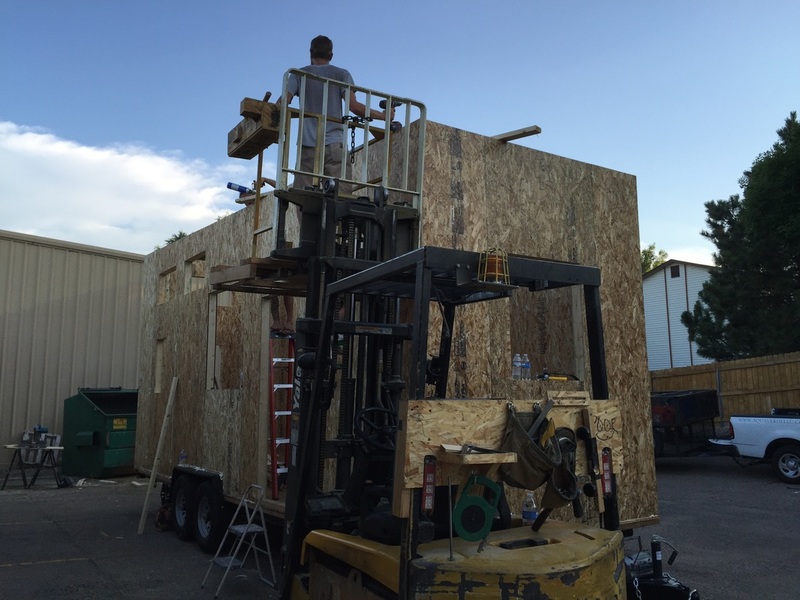 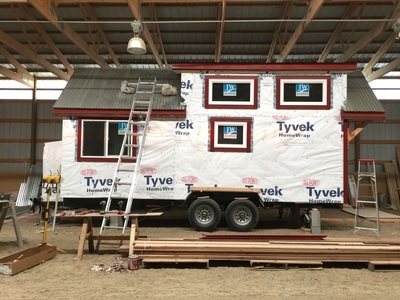 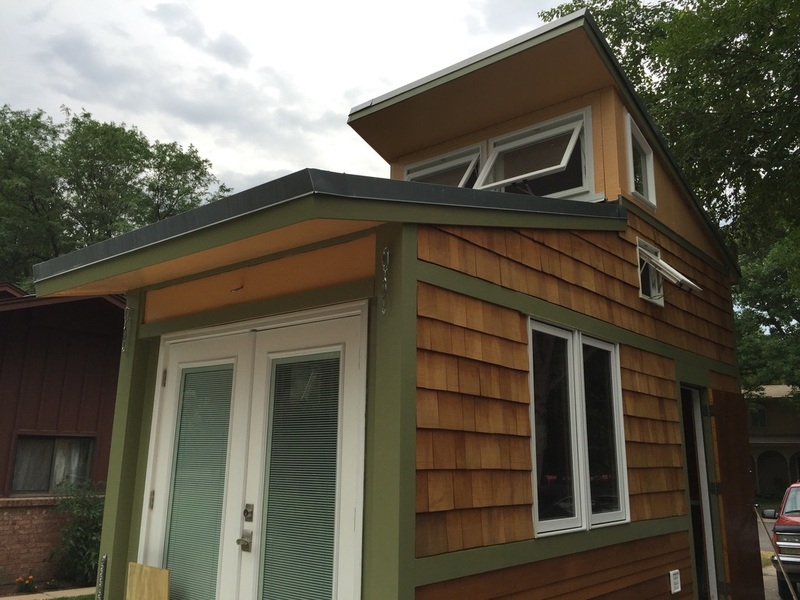 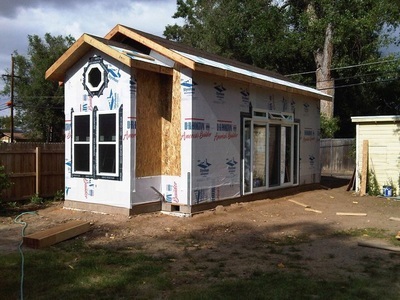 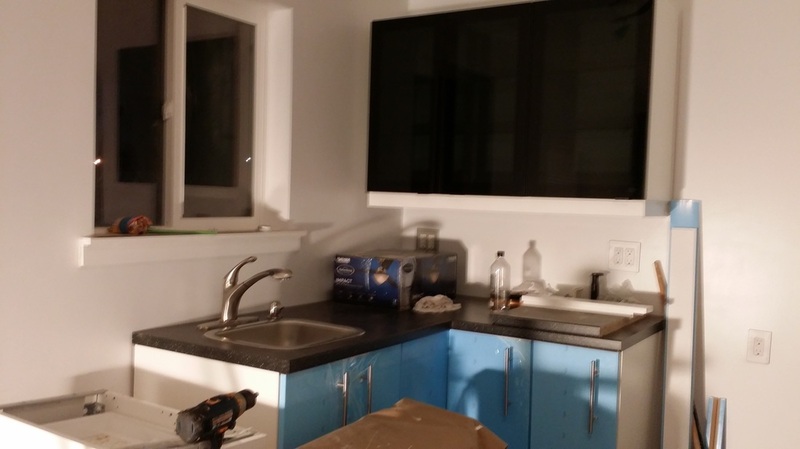 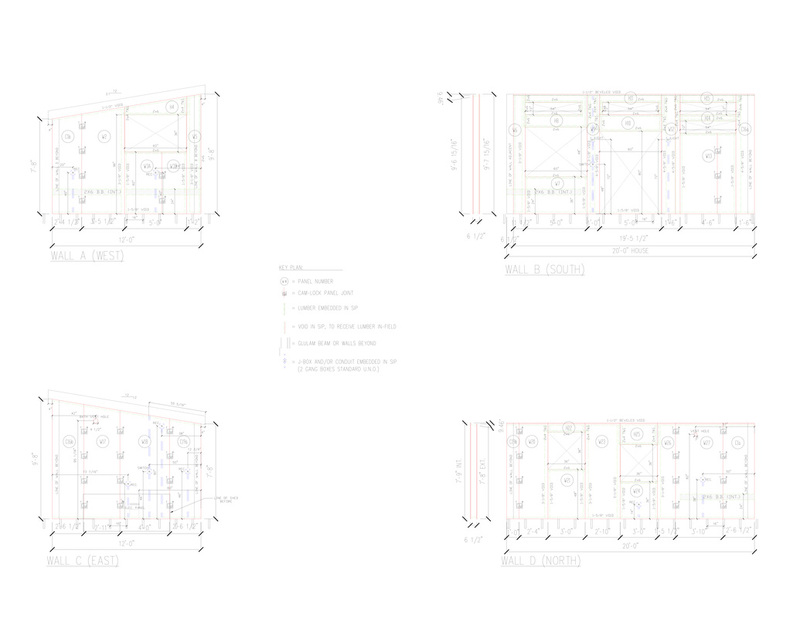 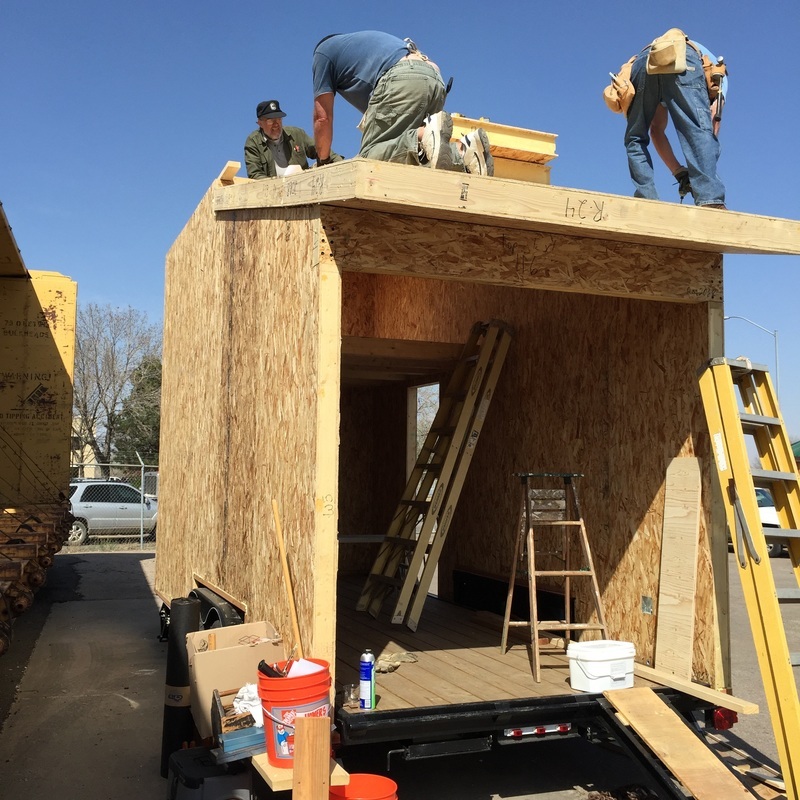 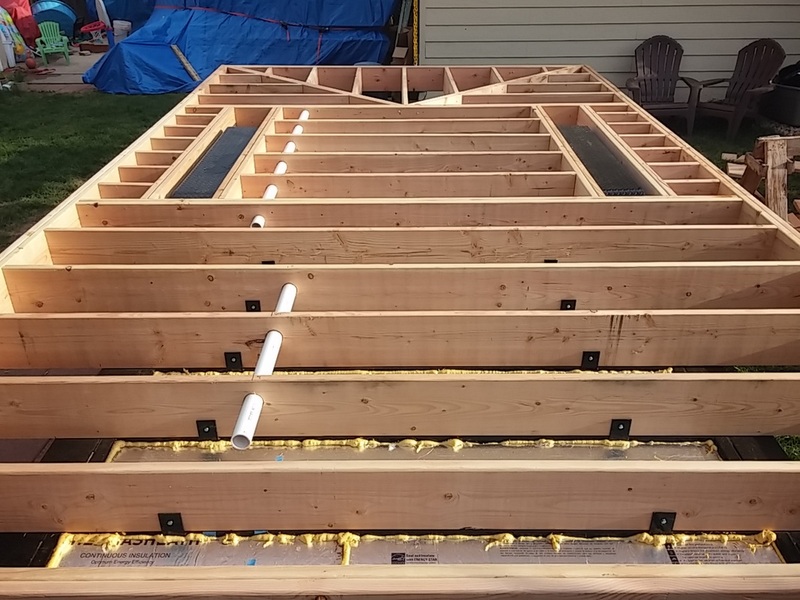 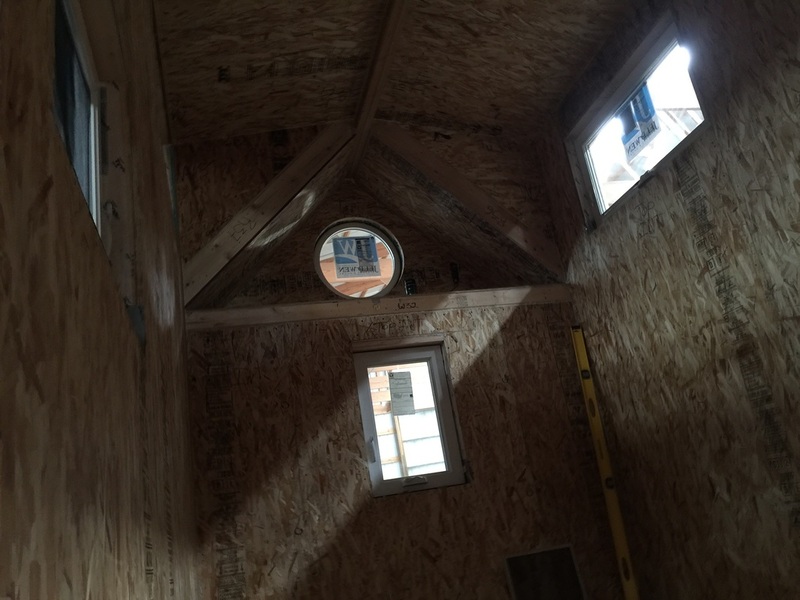 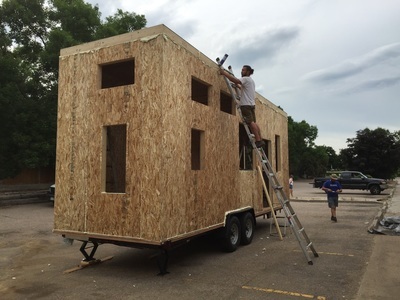 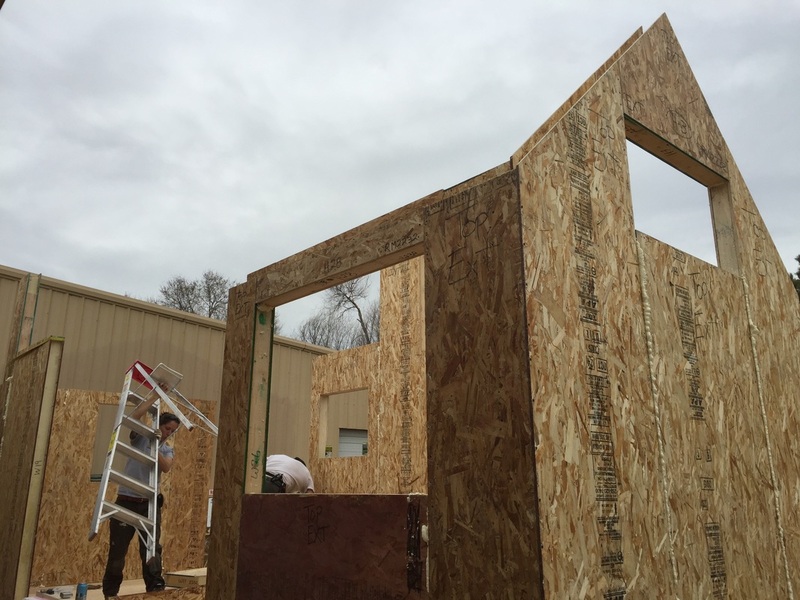 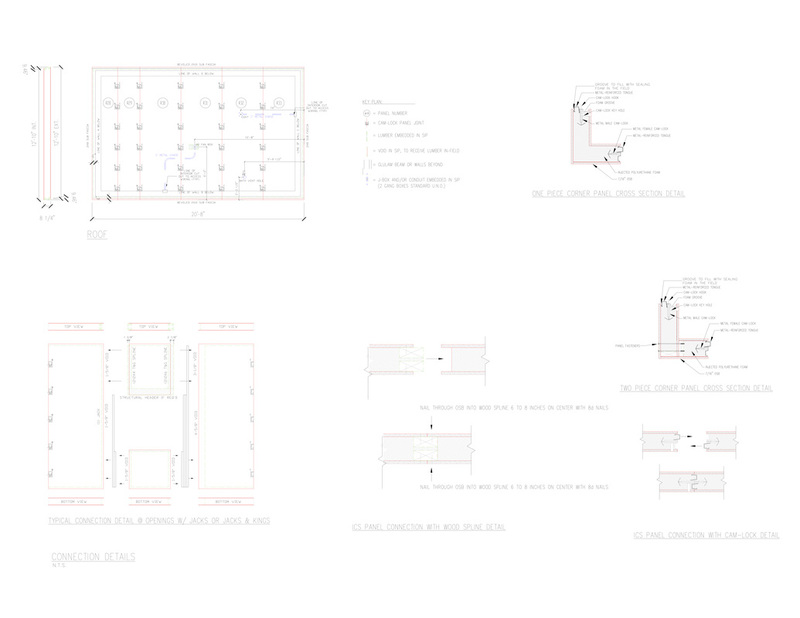 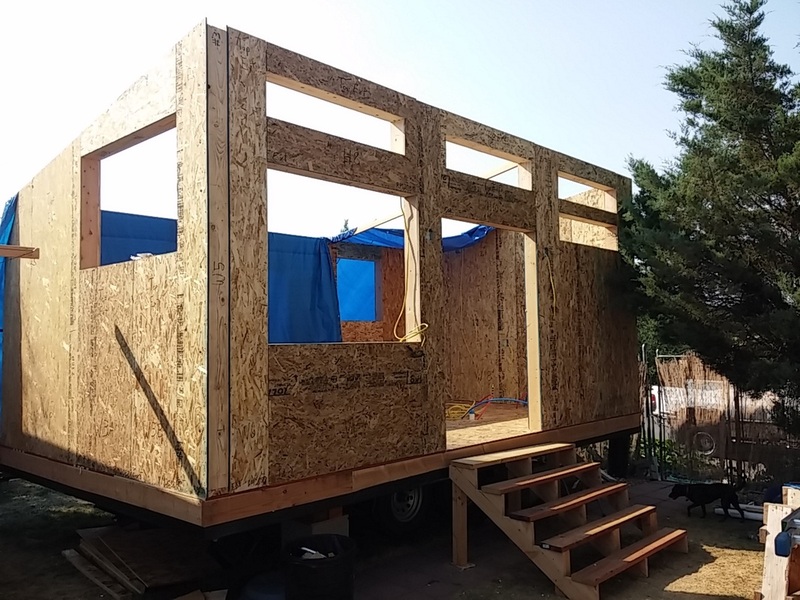 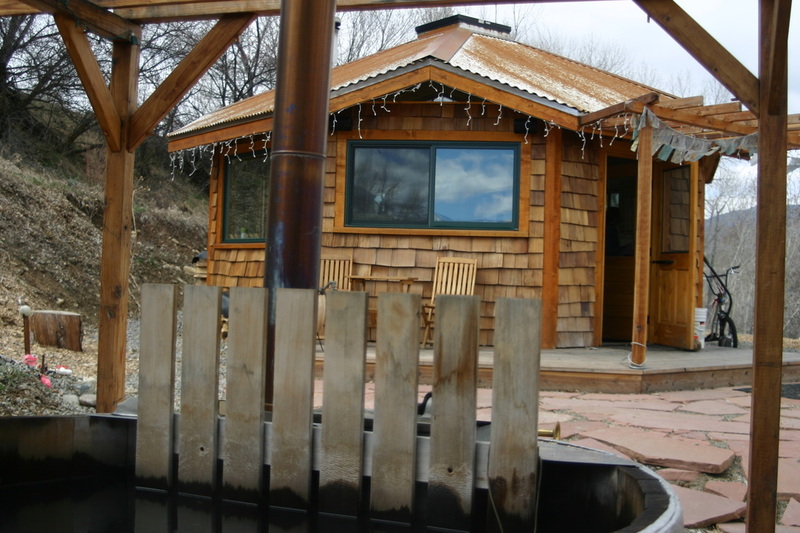 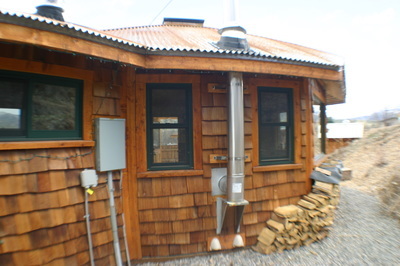 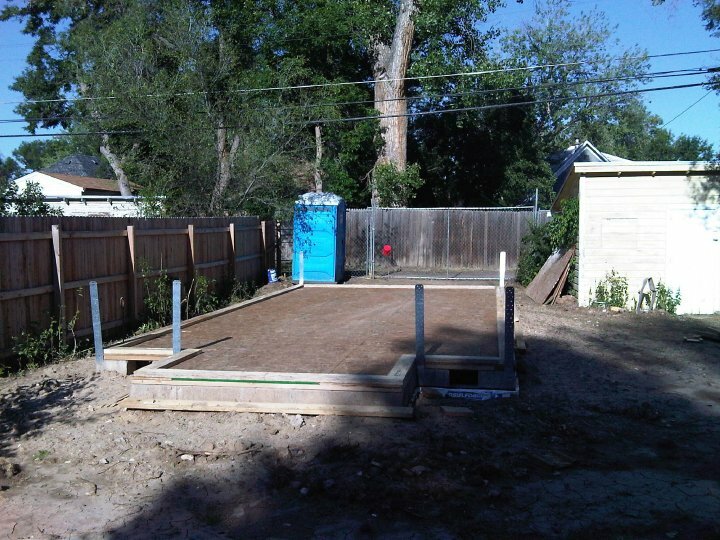 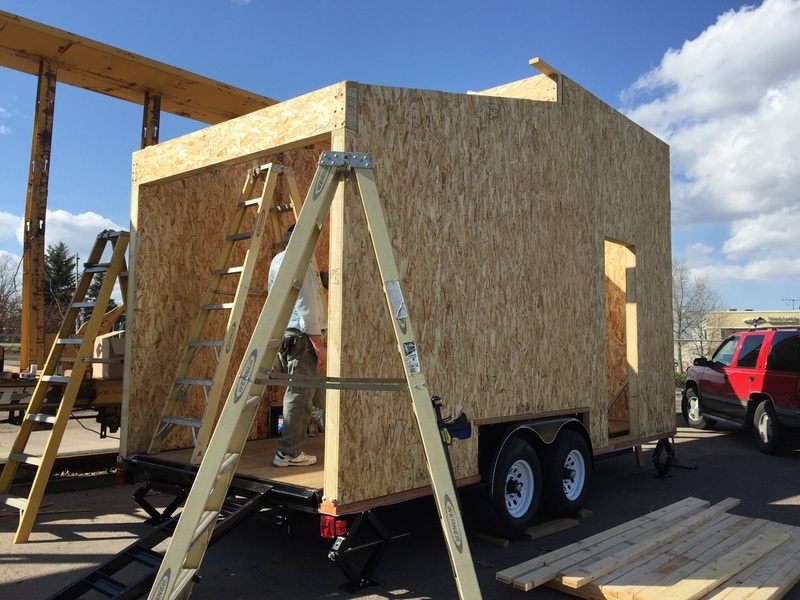 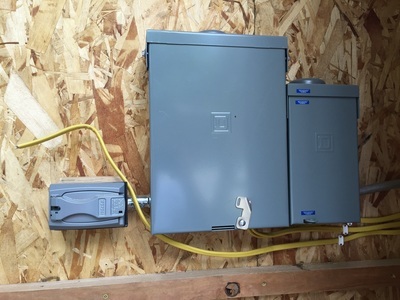 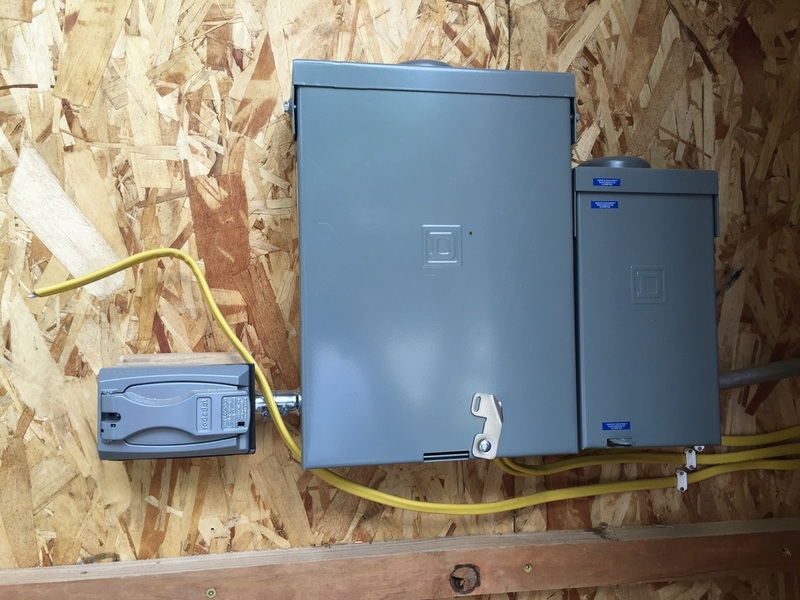 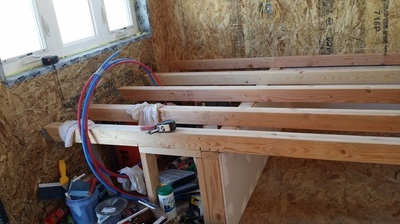 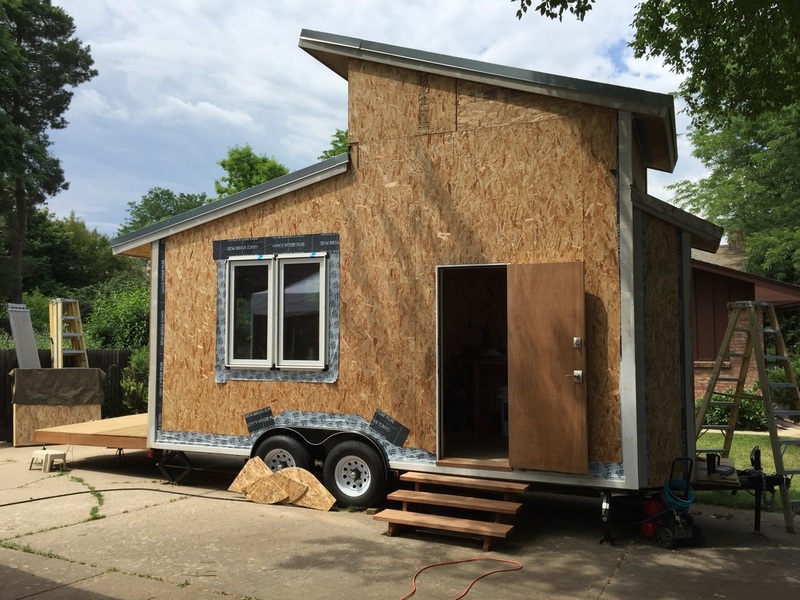 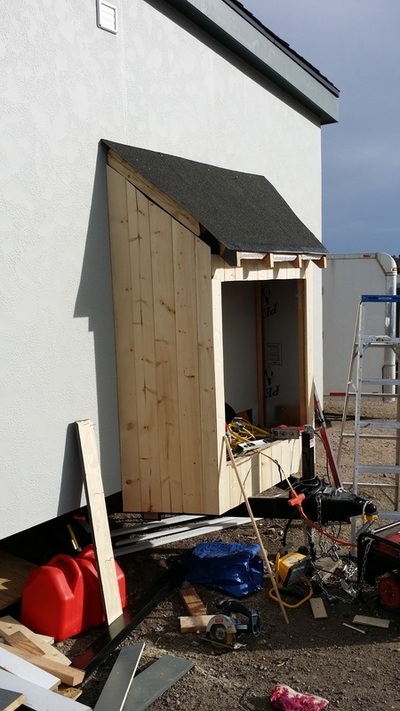 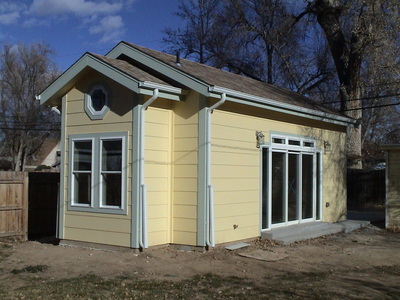 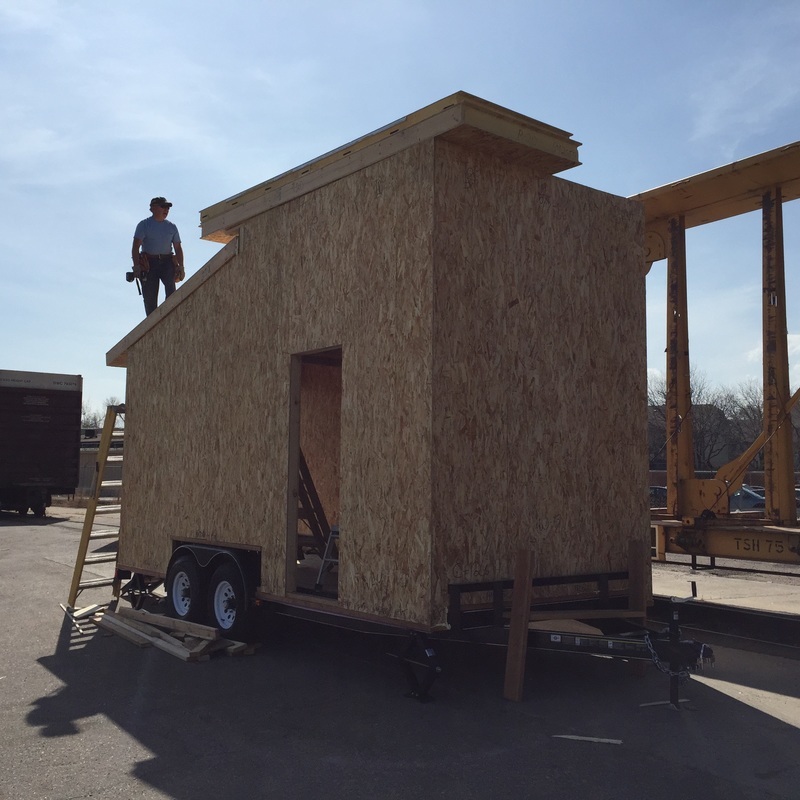 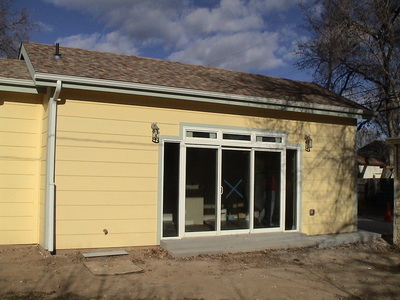 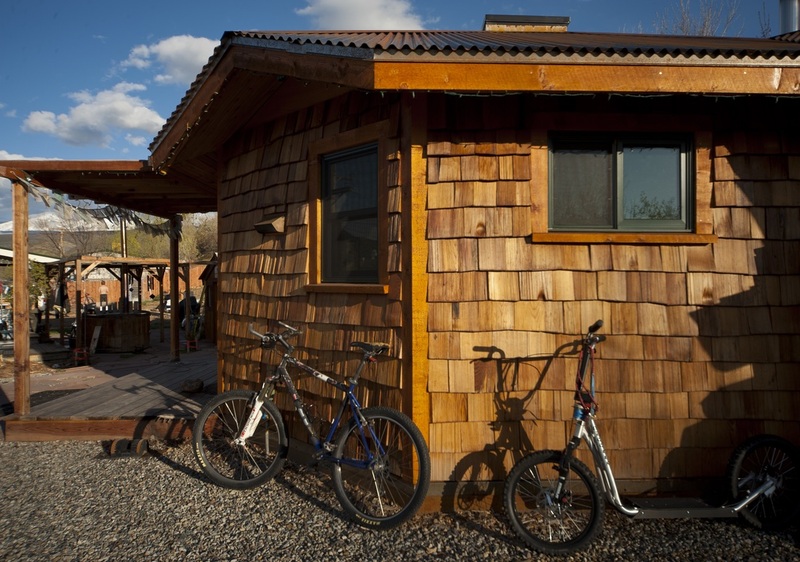 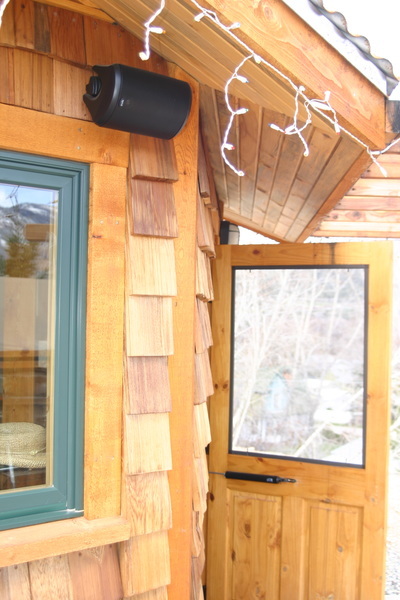 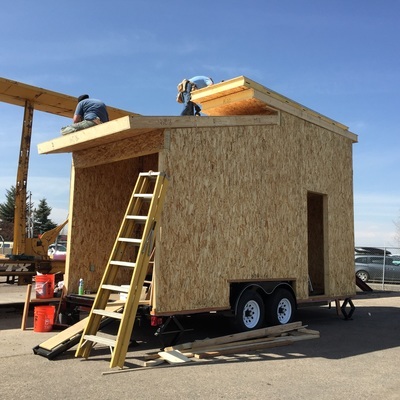 Why build Tiny Houses with ICS SIPs? 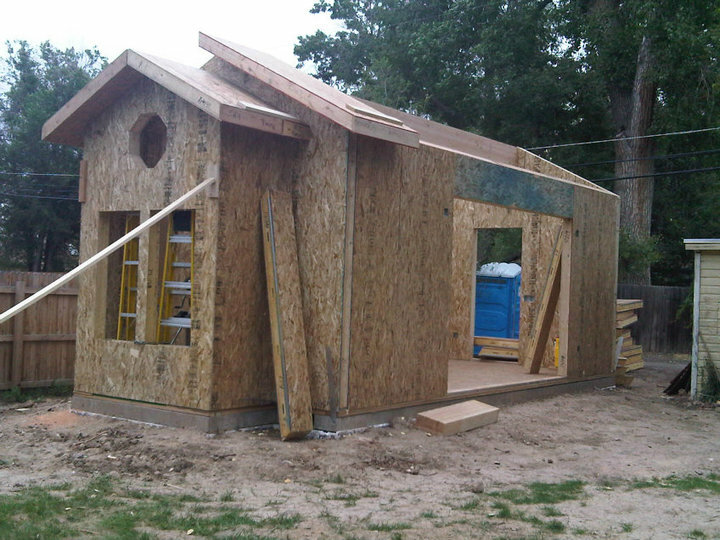 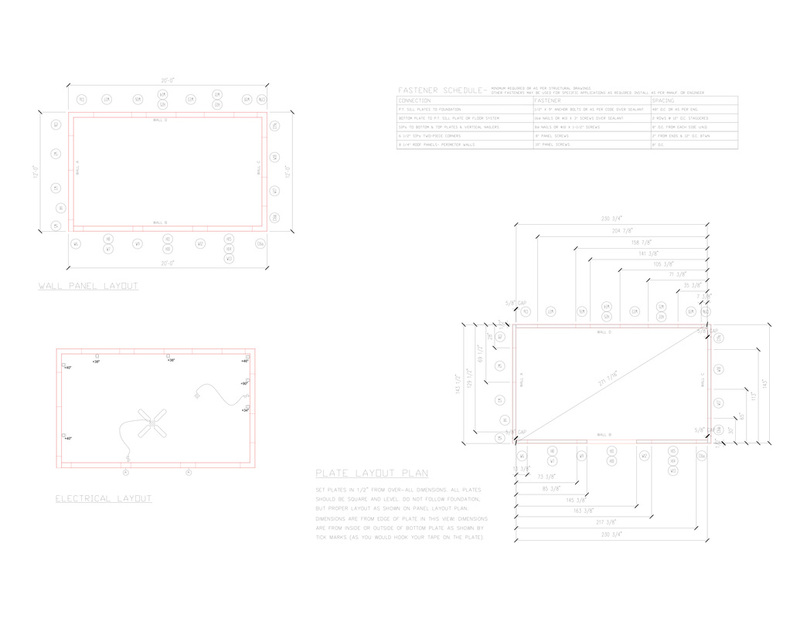 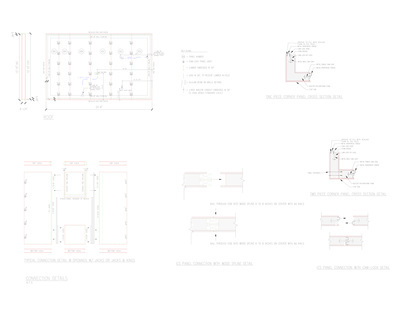 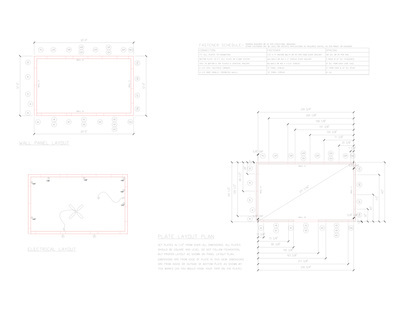 • ICS SIPs provide 2-times the R-value for the same wall or roof thickness. 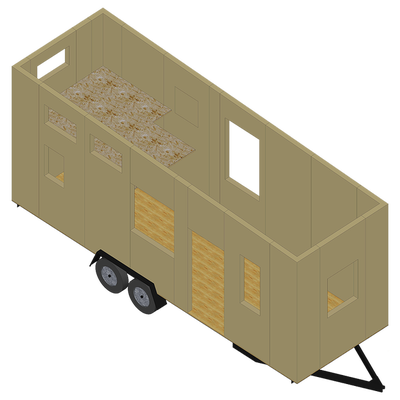 • ICS SIPs walls and roofs can be erected 4-times faster than stick-framing. 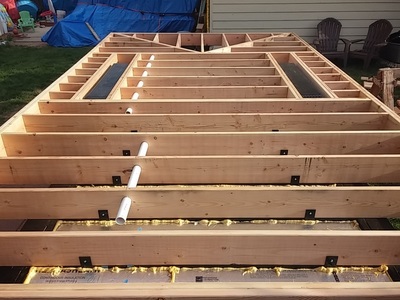 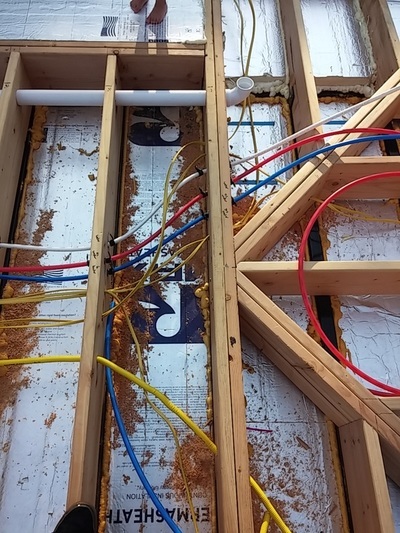 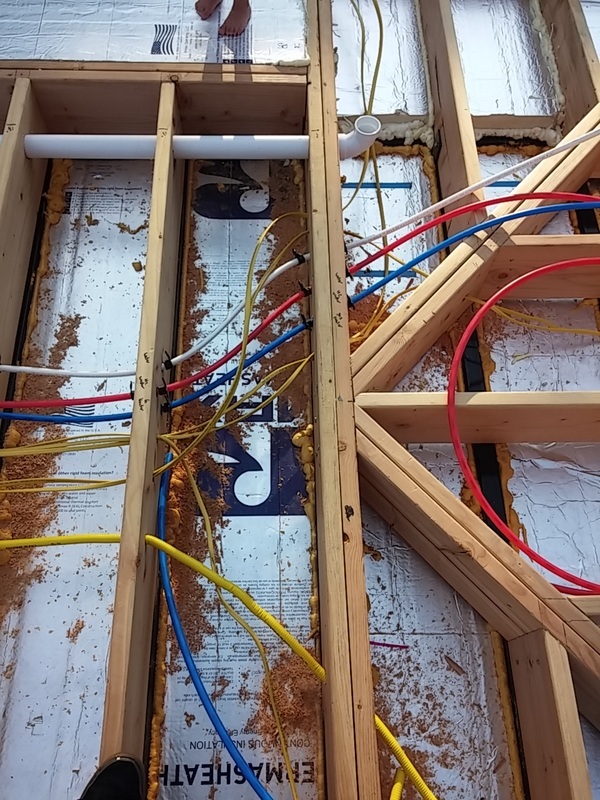 • ICS SIPs are 4-times stronger than stick-framing. • ICS SIPs are lighter-weight than stick-framing. • ICS SIPs can better handle wind, snow, and racking loads. • ICS SIPs are 50% stronger than SIPs made with EPS. 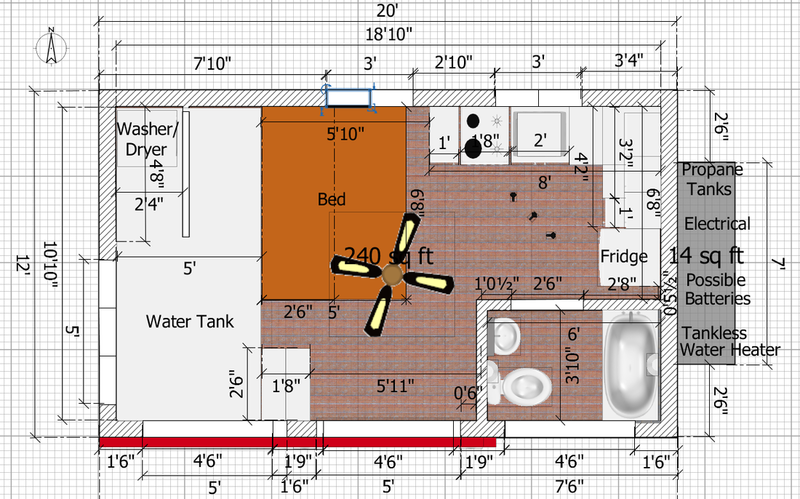 ﻿What will your design be? ICS SIPs can help you make it a reality. 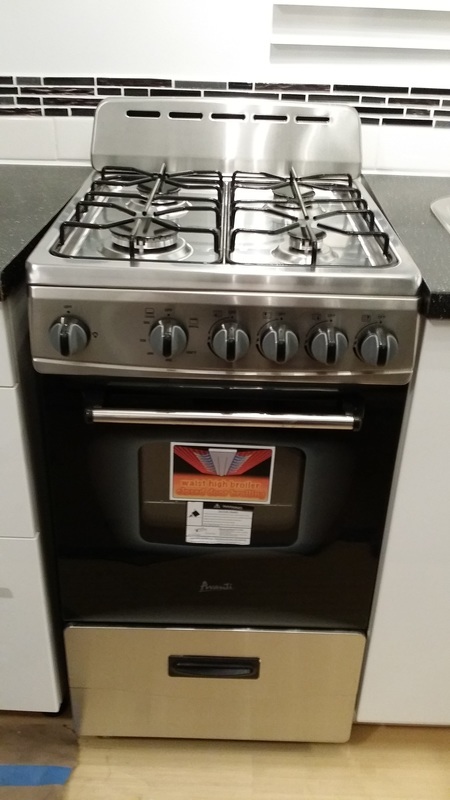 Save ﻿TIME﻿, ﻿MONEY﻿, & ﻿ENERGY﻿. 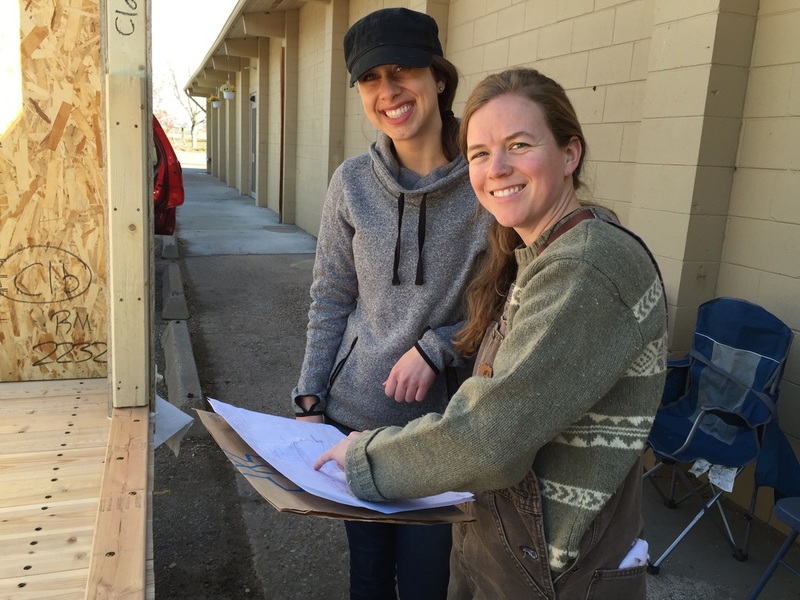 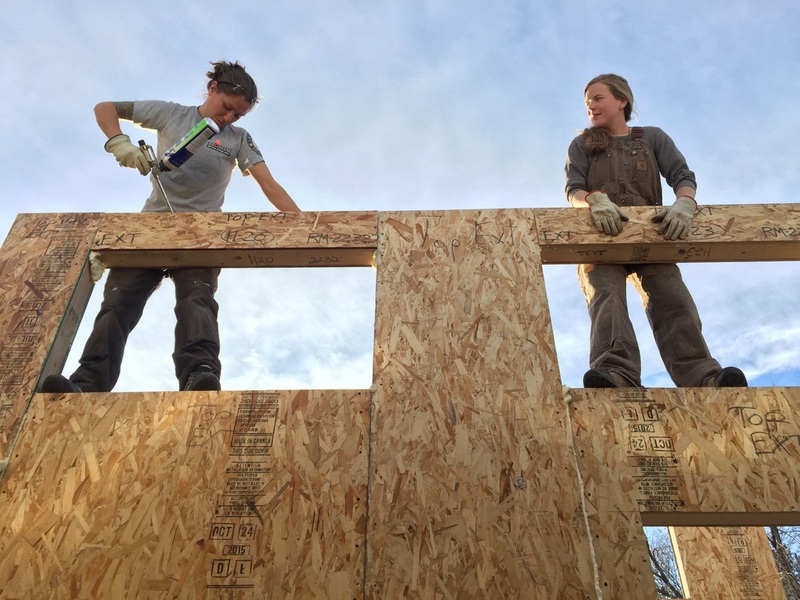 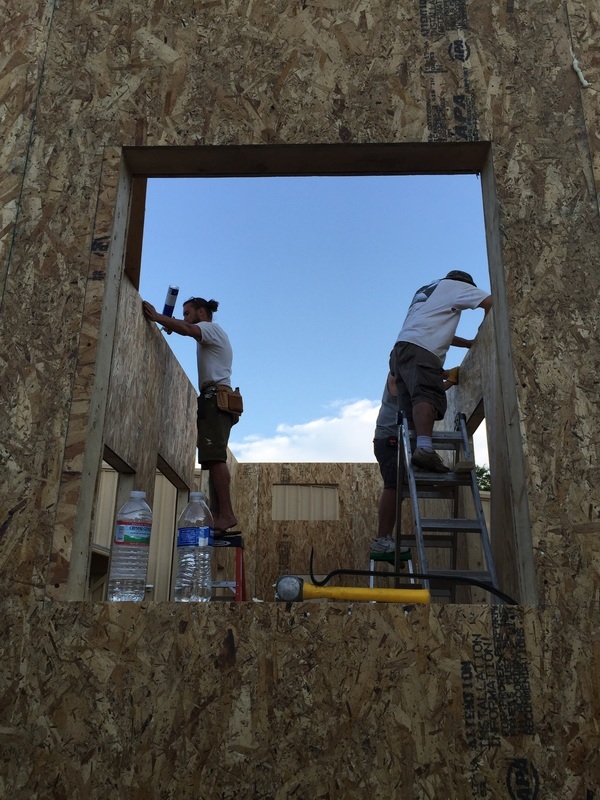 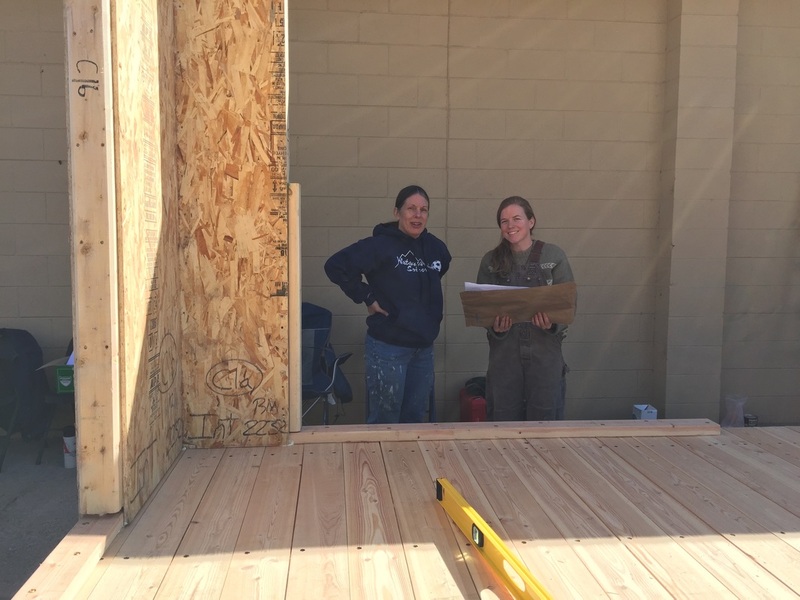 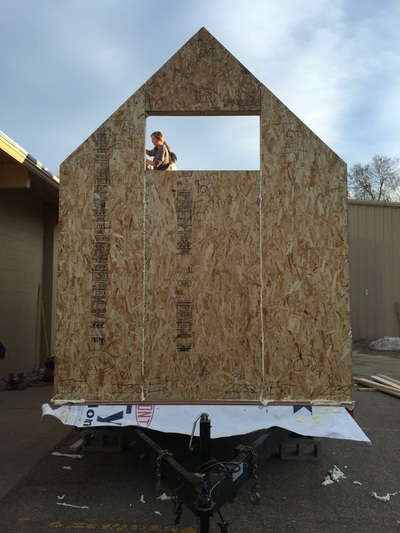 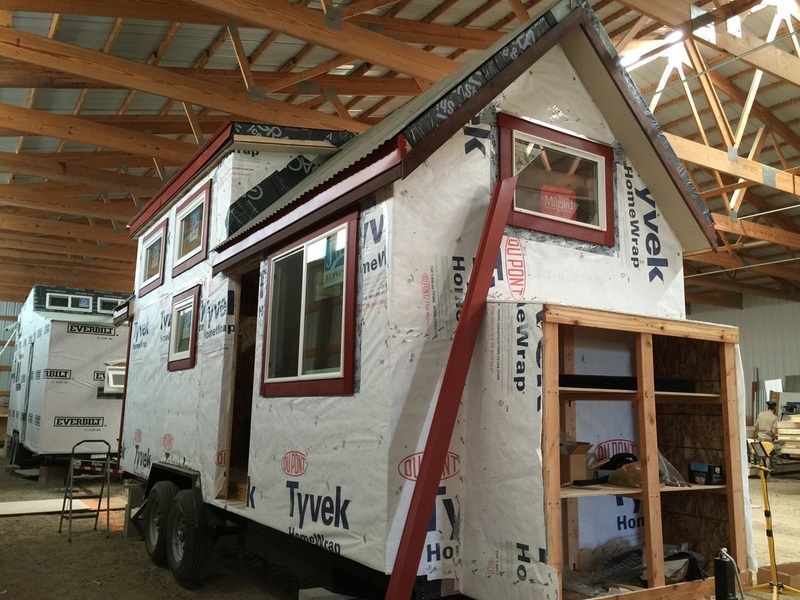 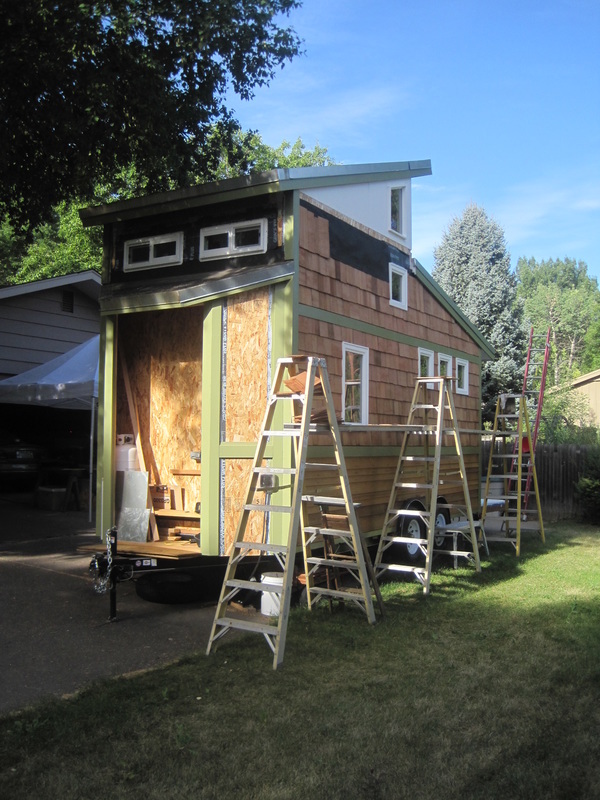 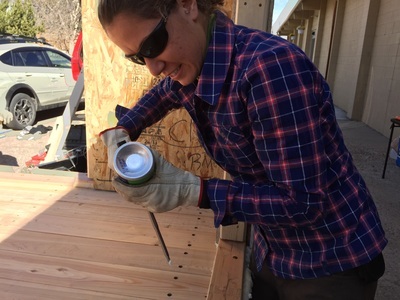 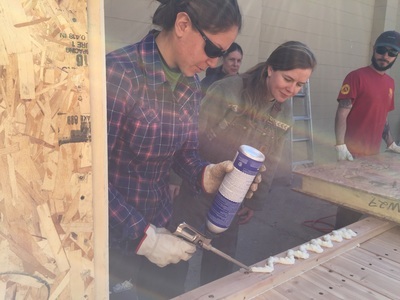 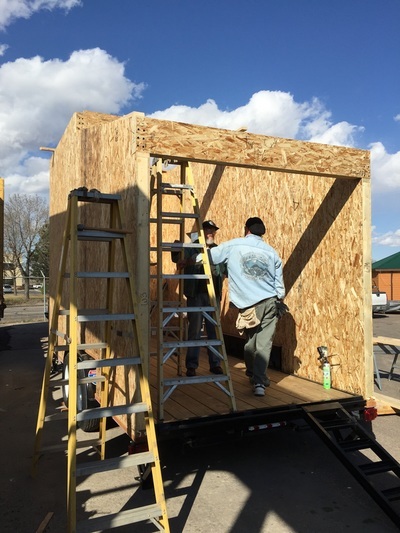 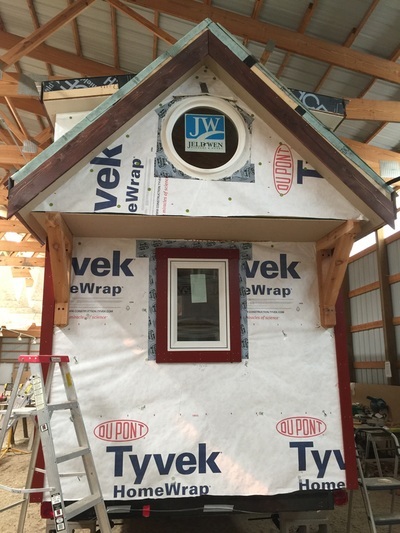 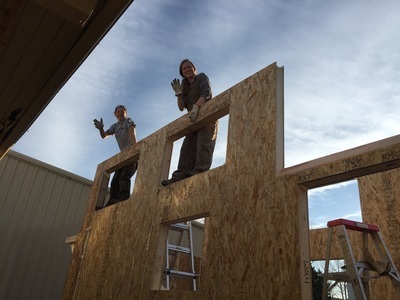 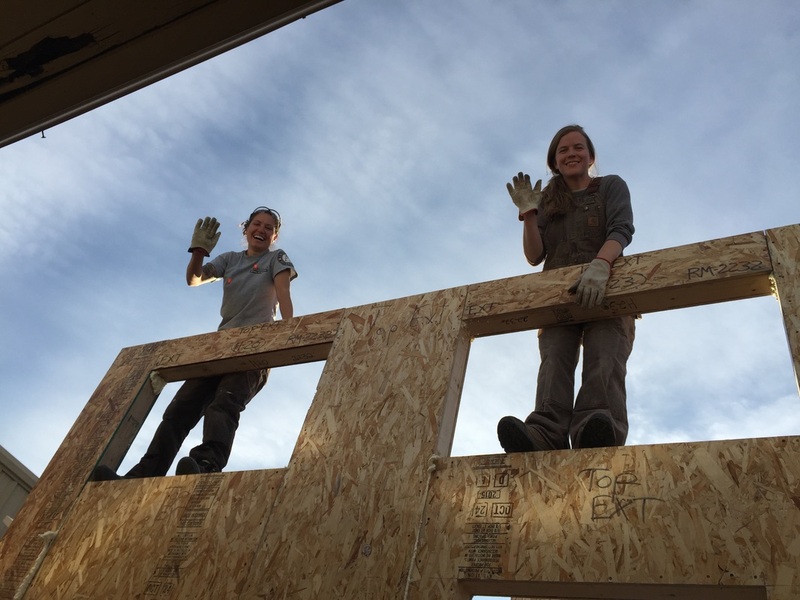 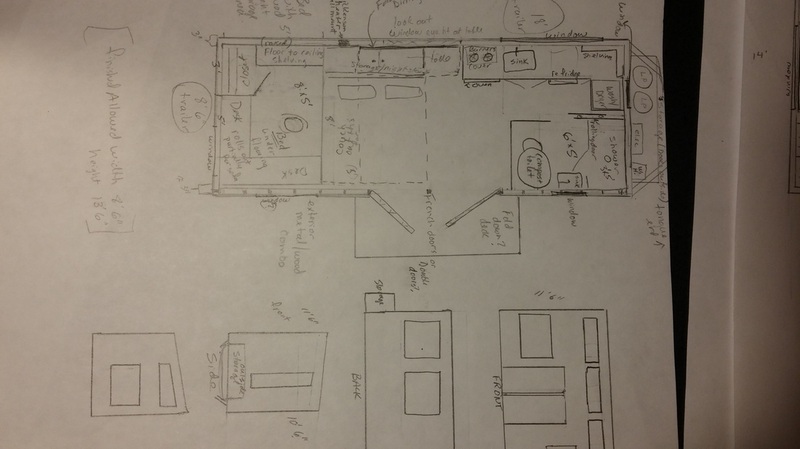 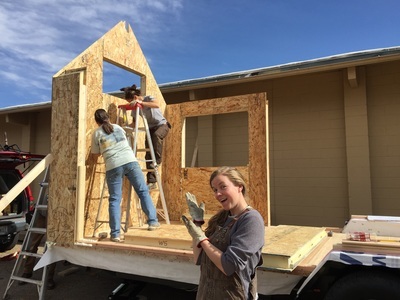 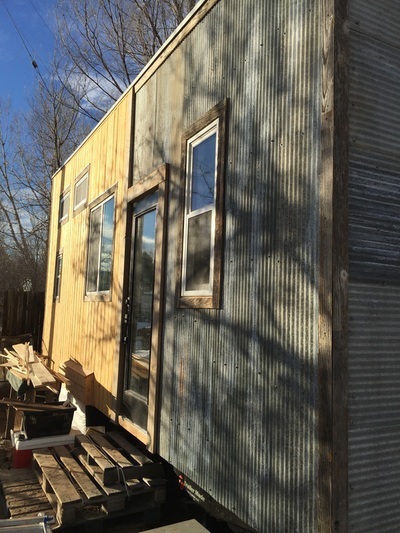 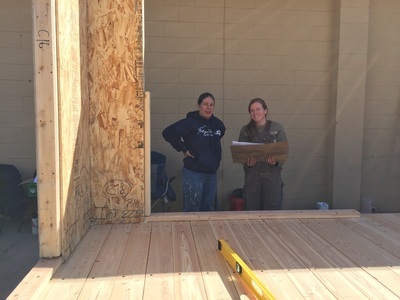 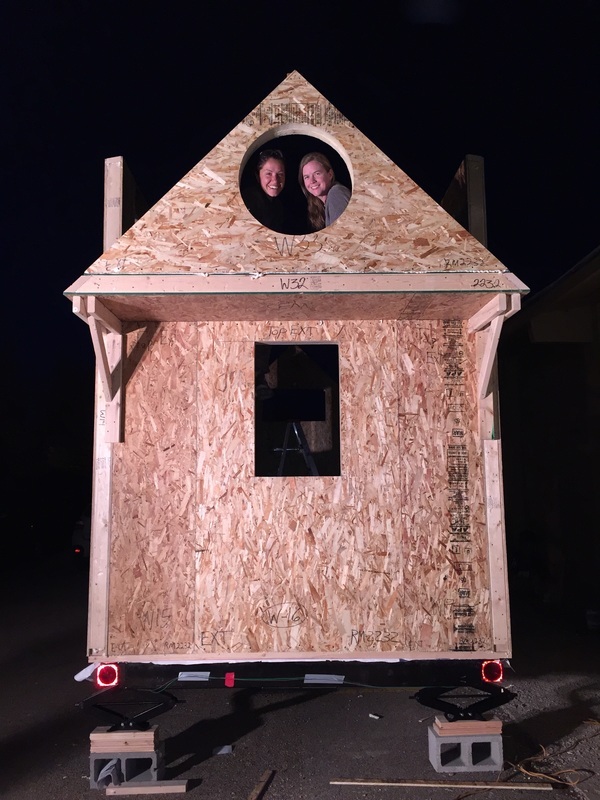 Melanie & Stephanie designed their tiny house and ICS SIPs helped make it a reality. 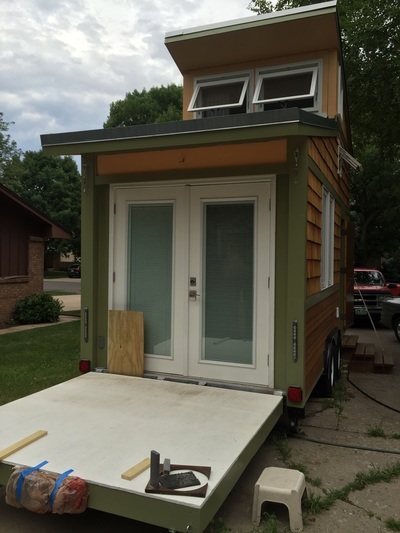 Their design sports 224 square feet of interior floor space on the main level plus 112 square feet in the loft. The unit is 8' wide and 28' long. 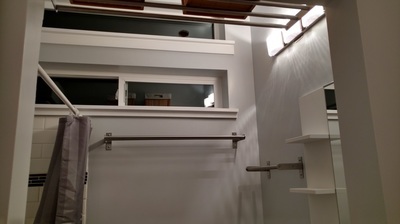 There is a loft which cantilevers off the back. 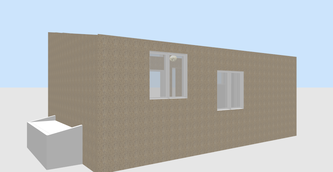 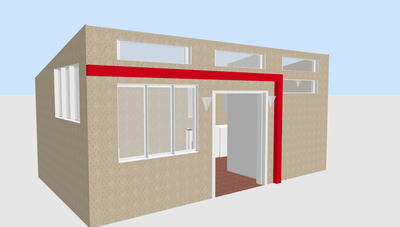 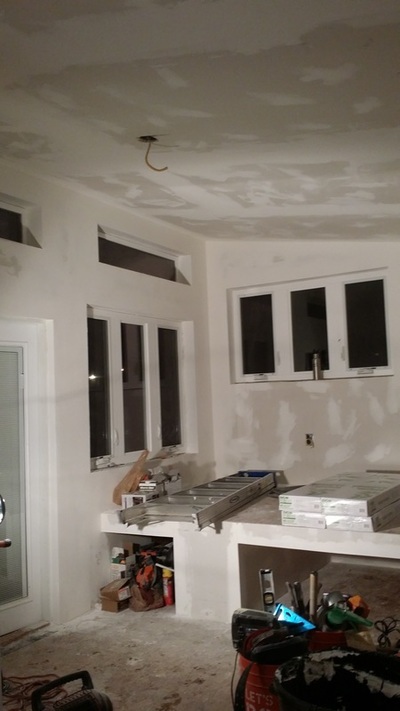 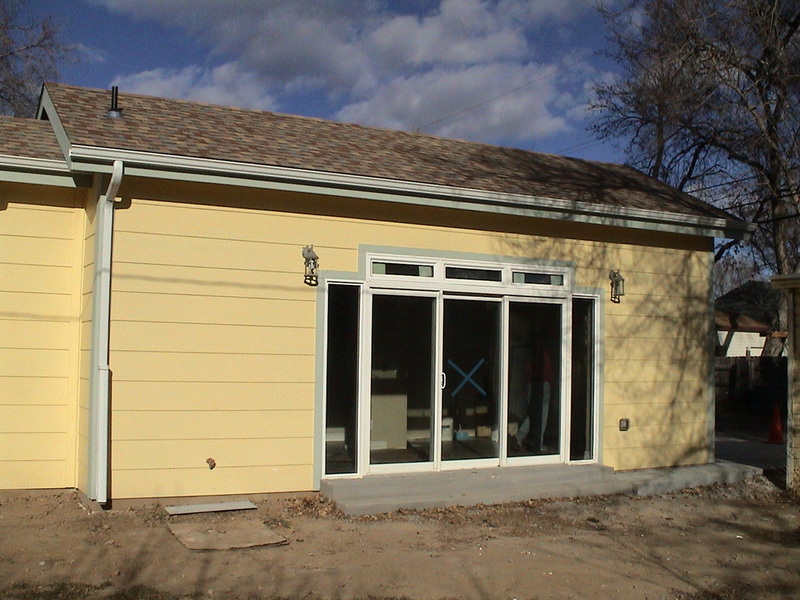 The walls are R-28 (4.5"-thick) ICS SIPs, and the roof is R-42 (6.5"-thick) ICS SIPs. 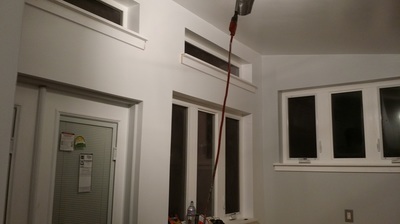 The floor is spray-foamed. 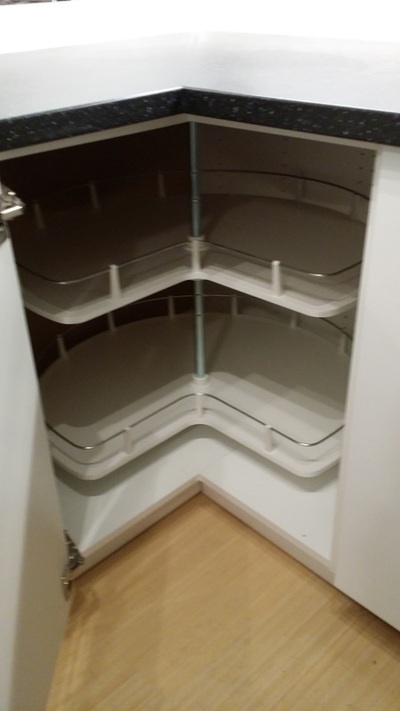 The first one-piece corner panel is installed. 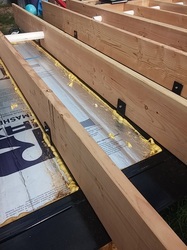 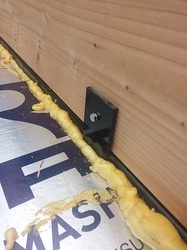 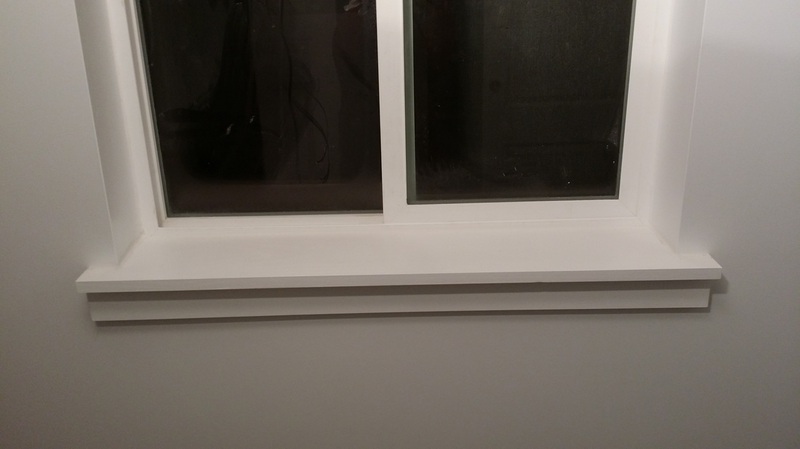 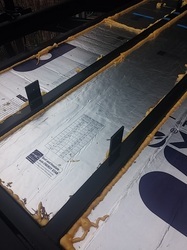 Applying foam to the sill-plate. 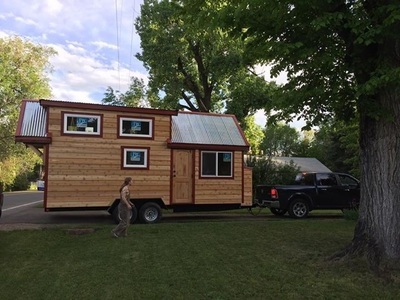 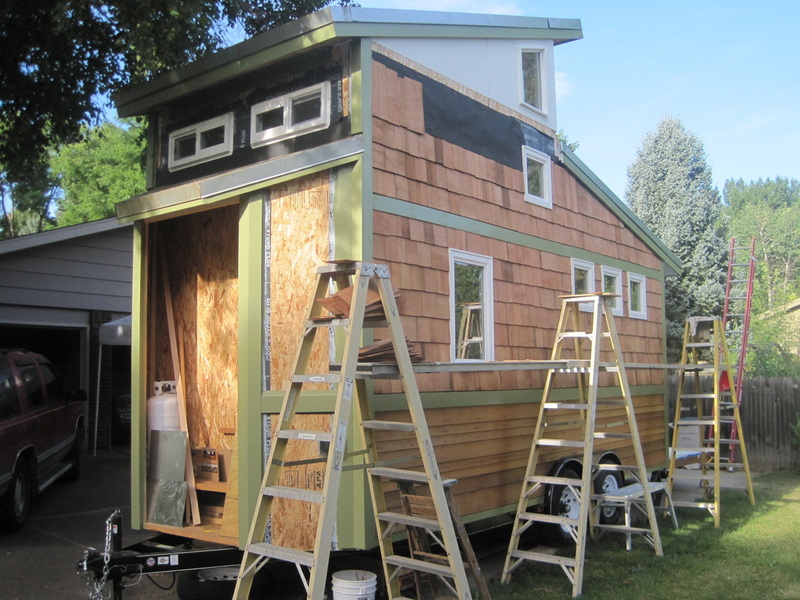 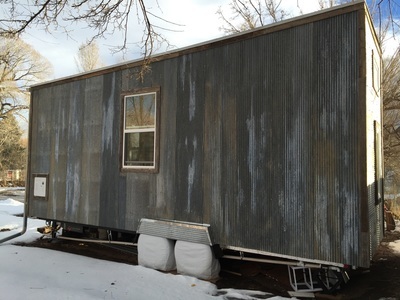 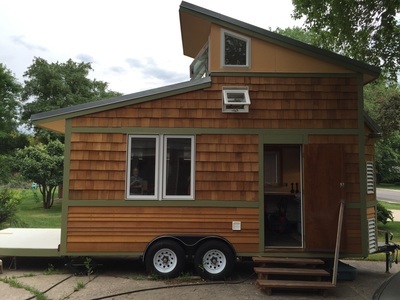 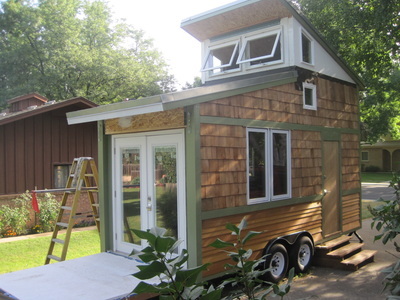 Jim calls his tiny house “The Band Wagon." 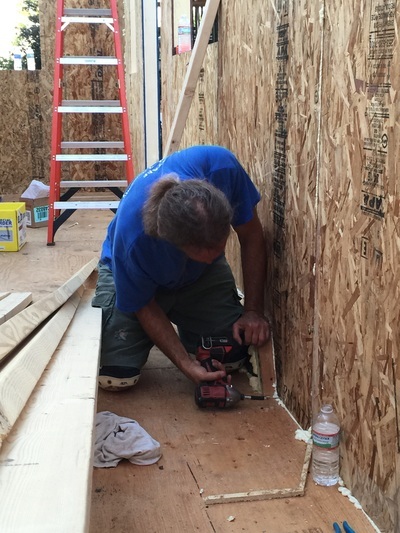 Jim is an accomplished musician and he plays many instruments, including piano, keyboard, and trombone. His pop-up design sports 122 square feet of interior floor space on the main level plus 56 square feet in the loft. The unit is nearly 8' wide and about 18' long. 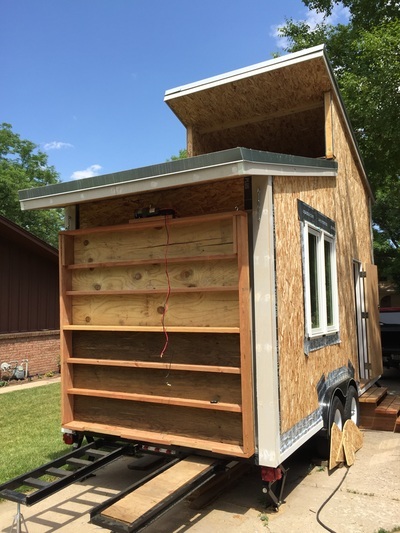 The upper roof hinges down for transport and up when parked to provide a full standing loft height. The rear deck winches up for transport to protect the French doors. The walls are R-28 (4.5"-thick) ICS SIPs, and the roof is R-42 (6.5"-thick) ICS SIPs. 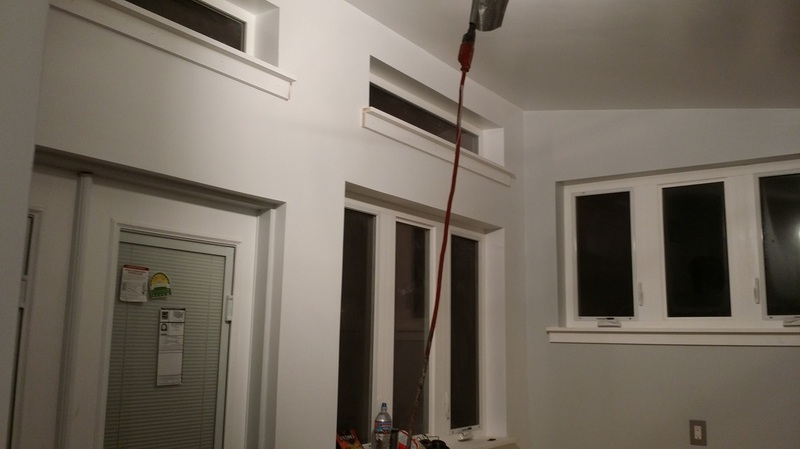 The floor is spray-foamed. 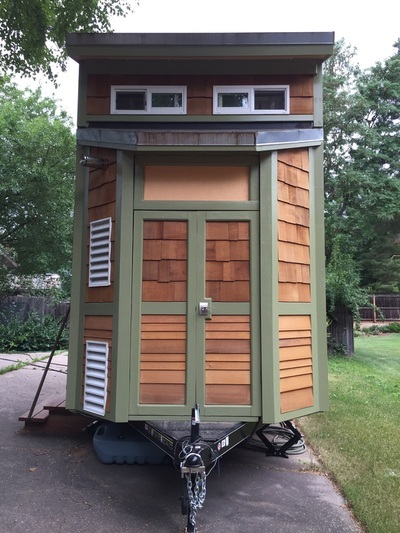 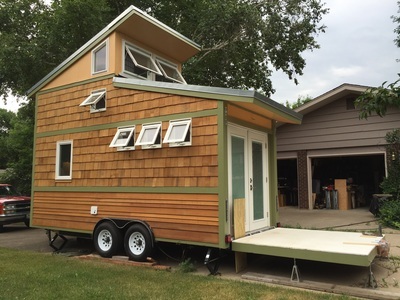 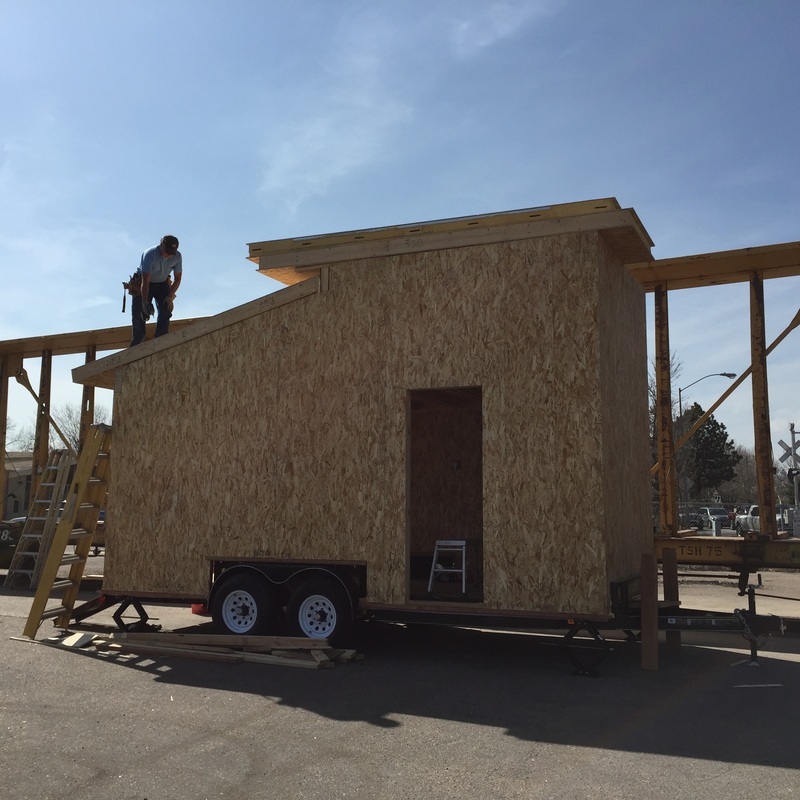 His tiny house will be on display at the 2nd annual "Tiny House Jamboree” at the Air Force Academy in Colorado Springs, August 5th, 6th, and 7th, 2016. See his website at www.TinyByDesignUSA.com. 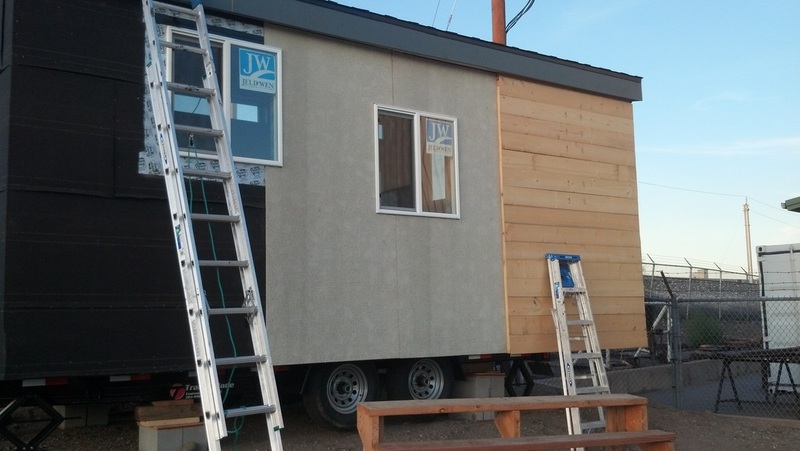 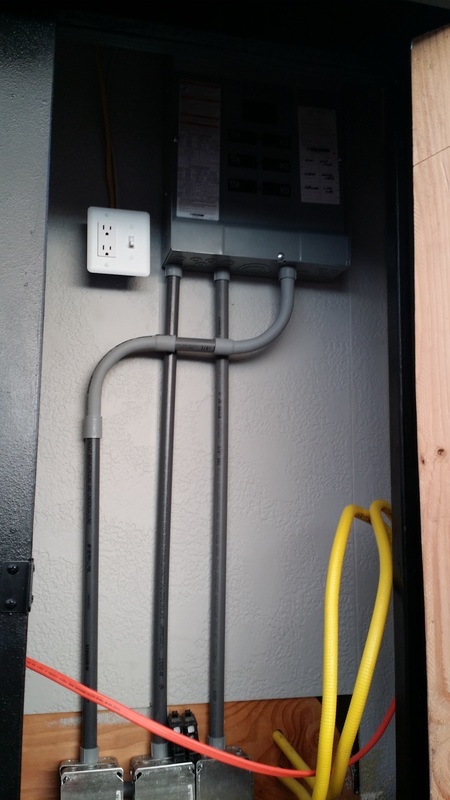 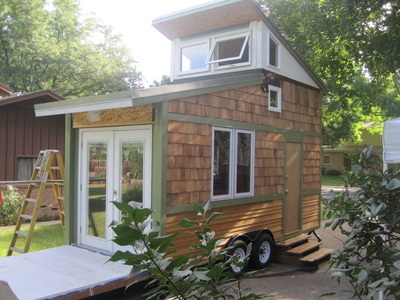 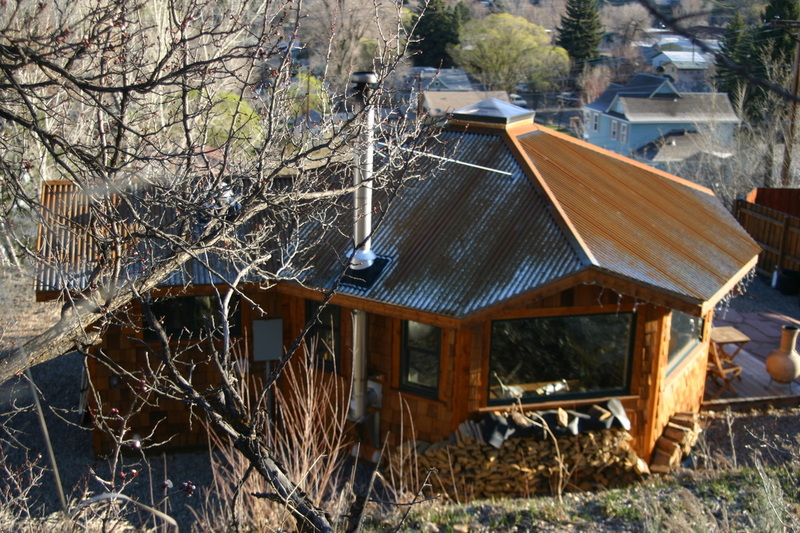 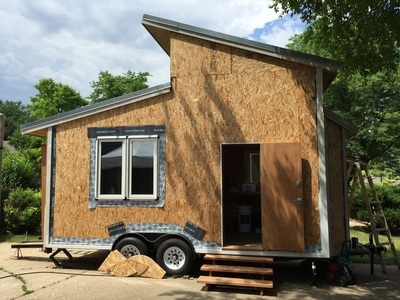 This tiny house has a shell made of ICS SIPs. 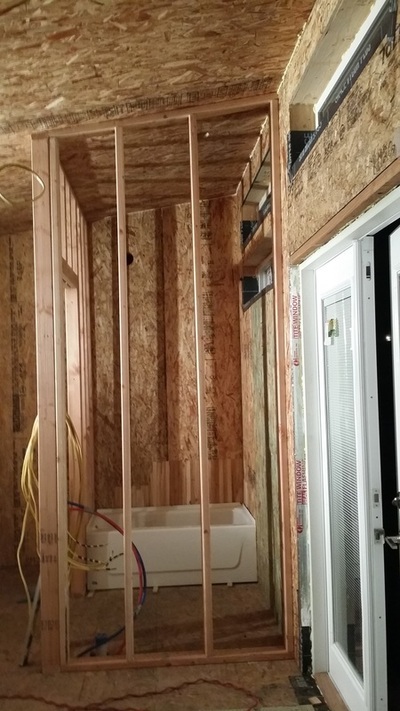 The walls are R-28 (4.5"-thick). 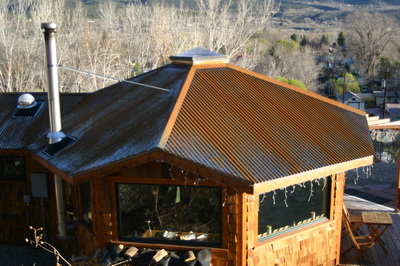 The roof is R-42 (6.5"-thick). 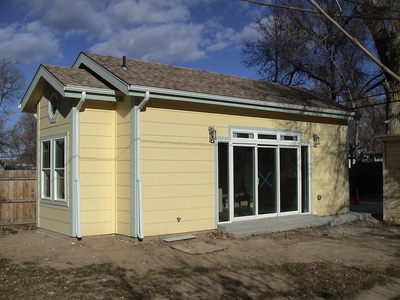 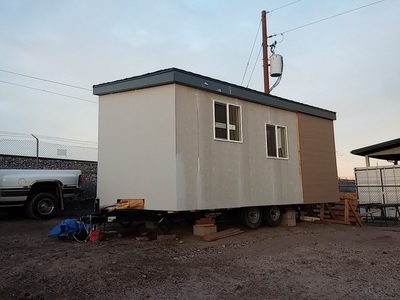 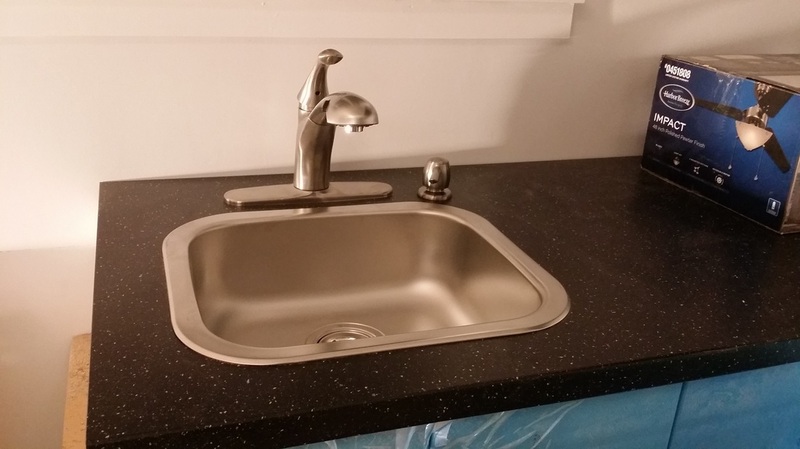 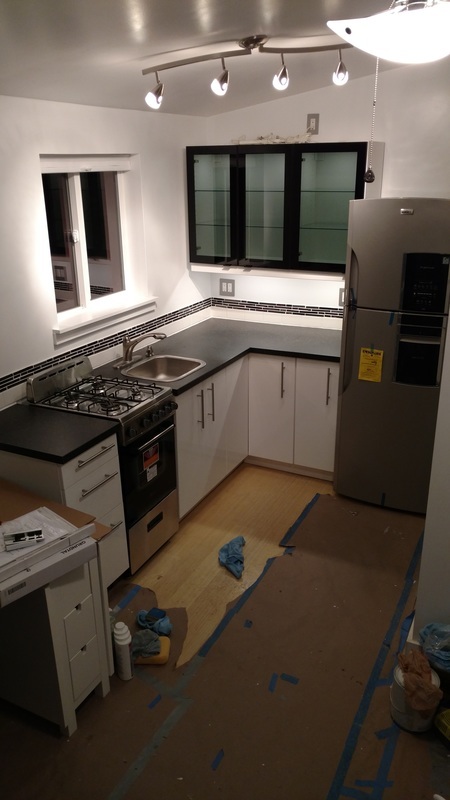 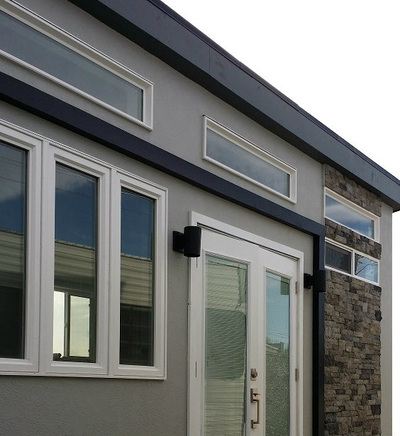 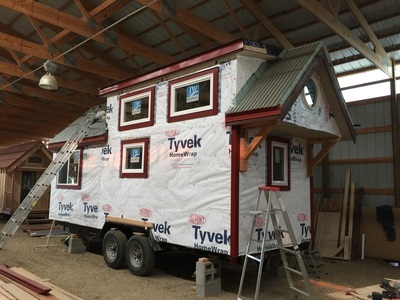 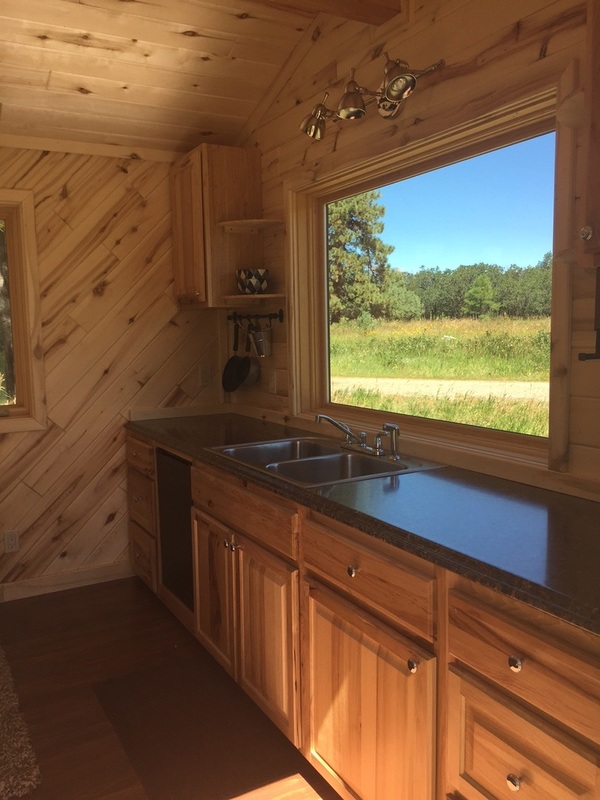 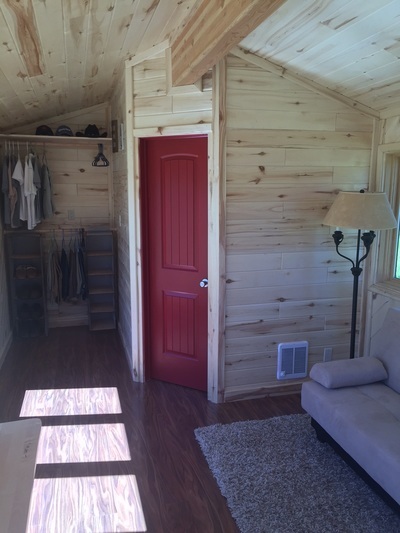 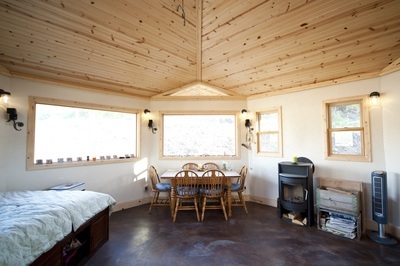 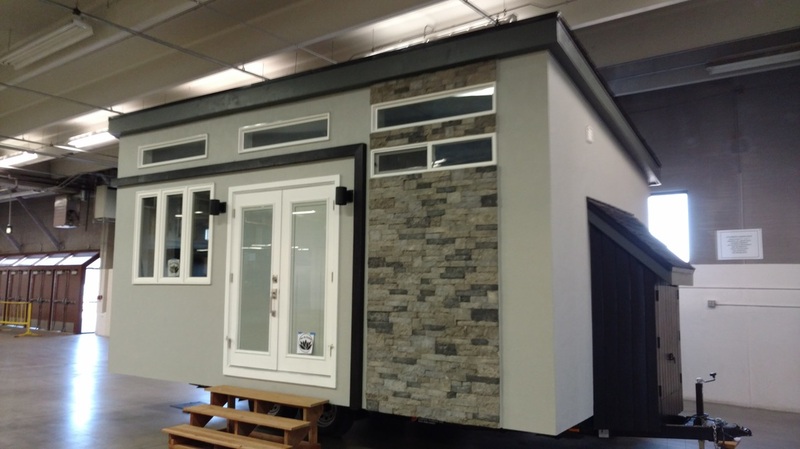 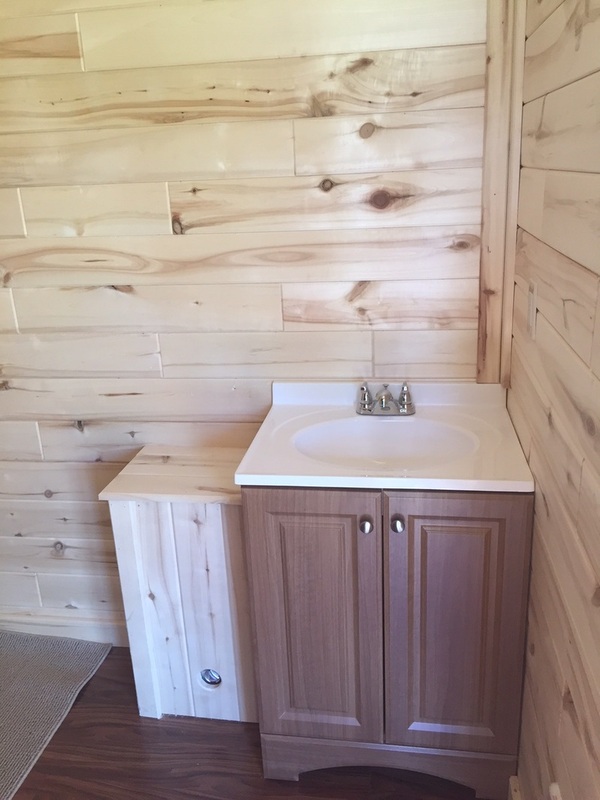 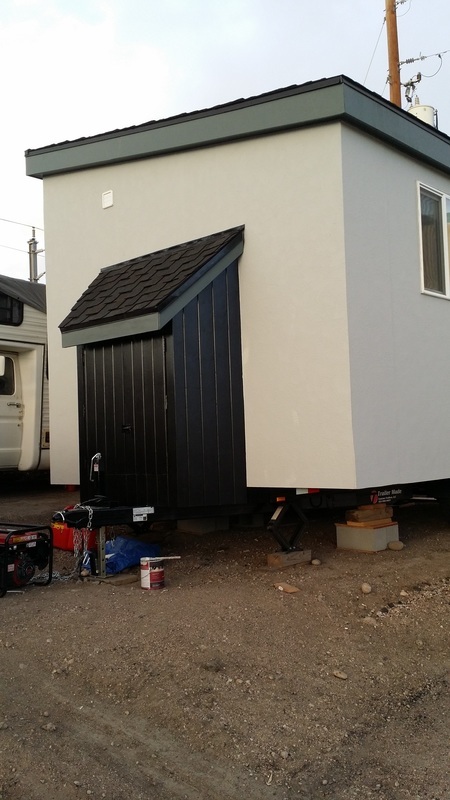 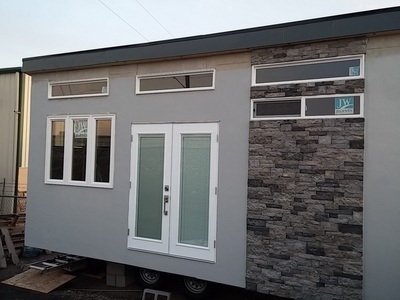 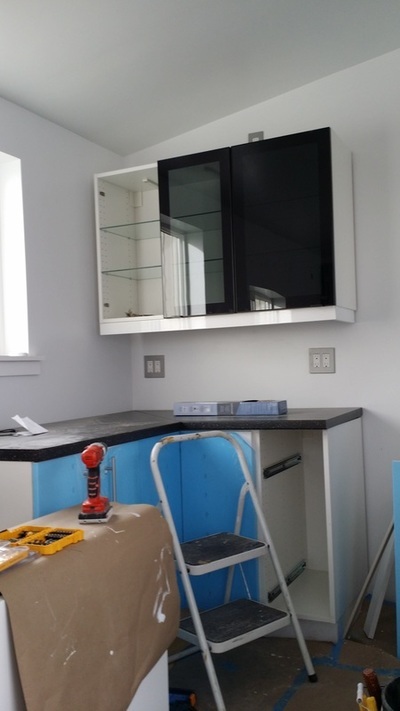 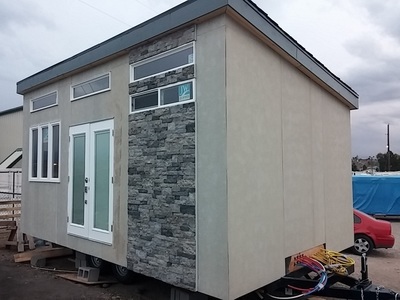 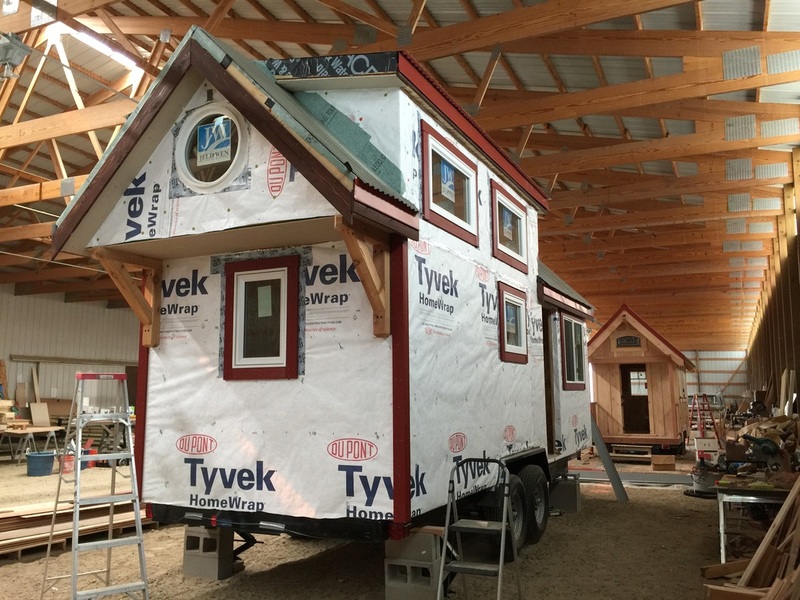 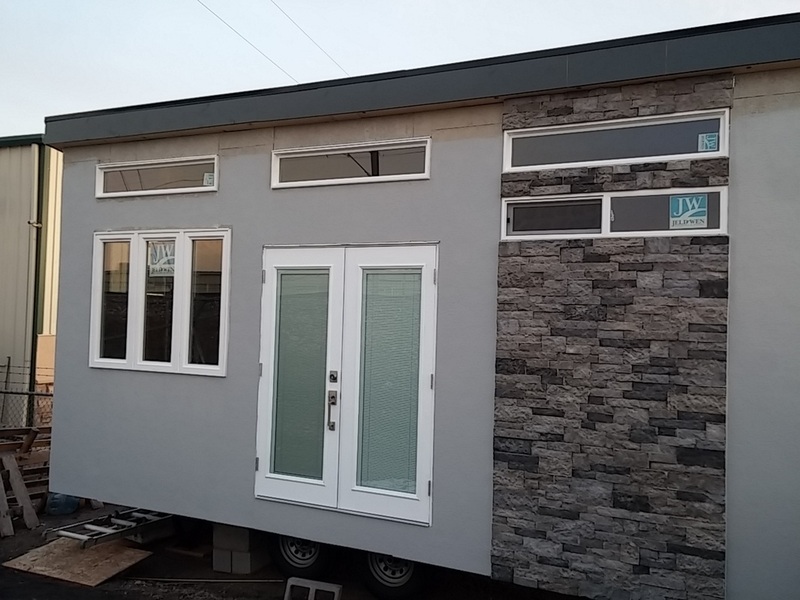 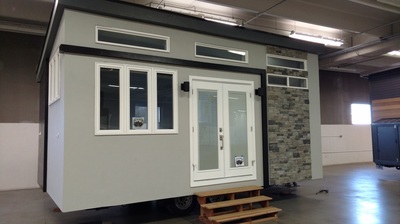 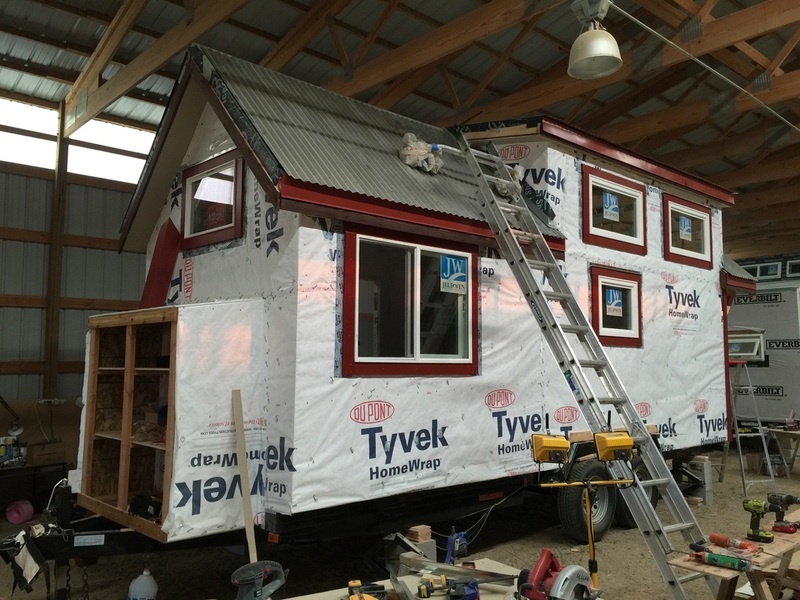 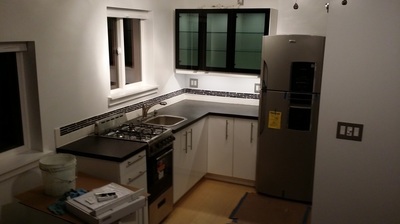 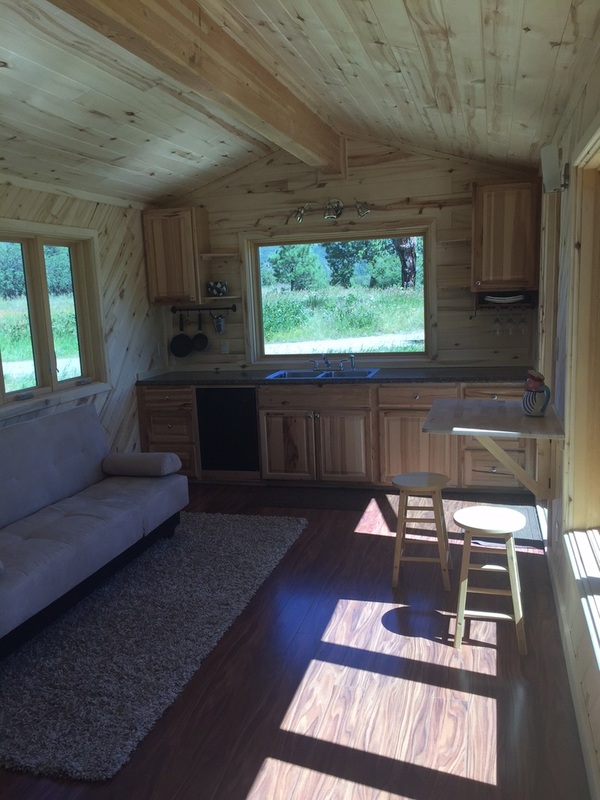 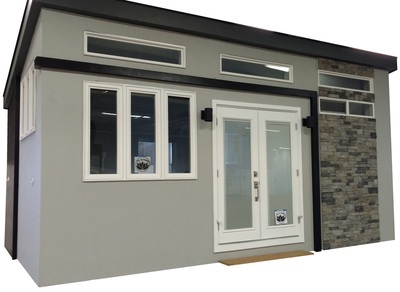 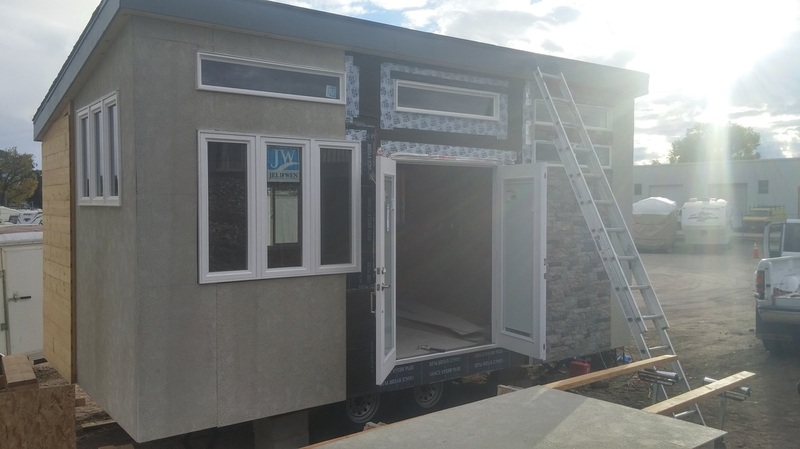 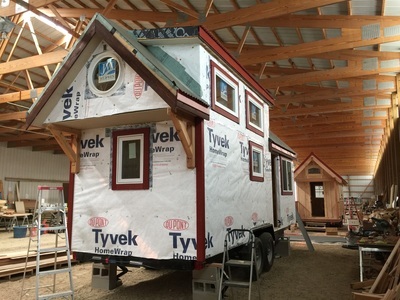 The customer contracted MitchCraft Tiny Homes to design and build it. 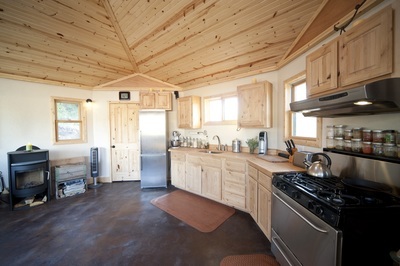 See ​​​​www.MitchCraftTinyHomes.com​​​​​ for more photos and information. 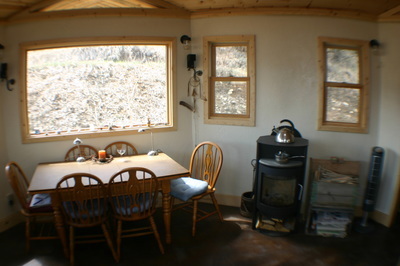 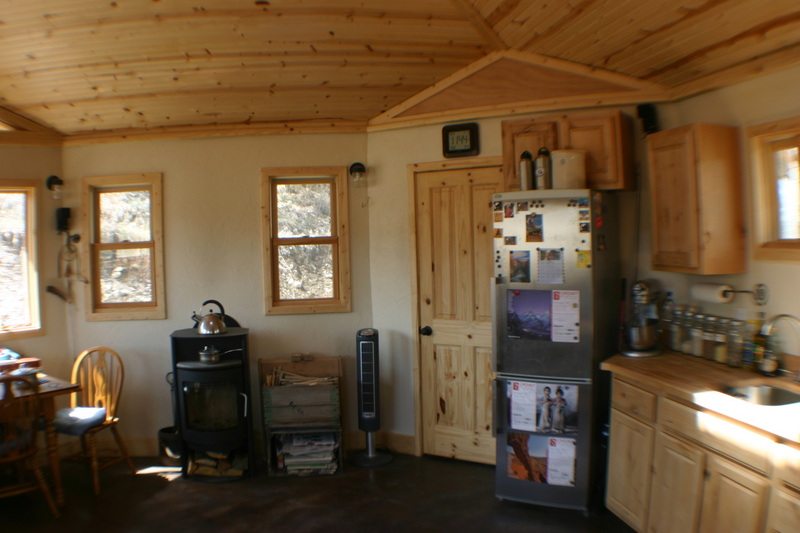 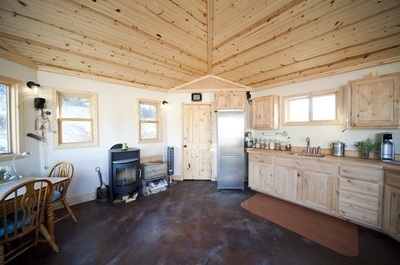 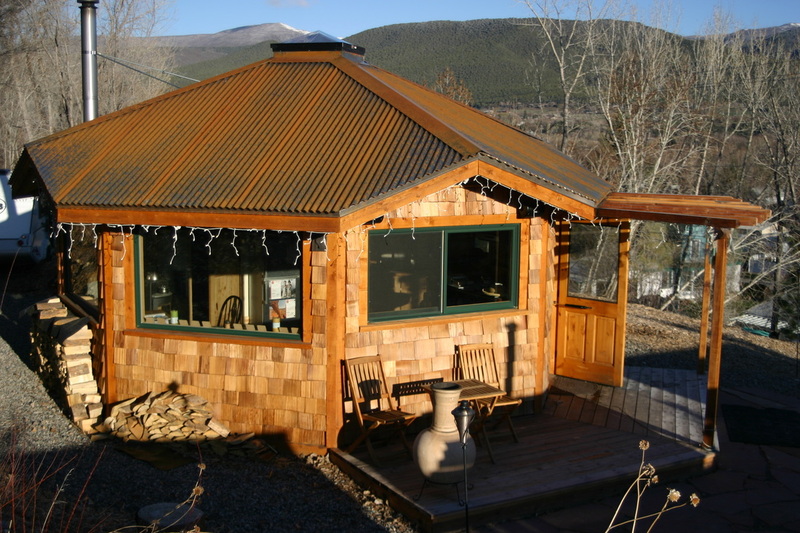 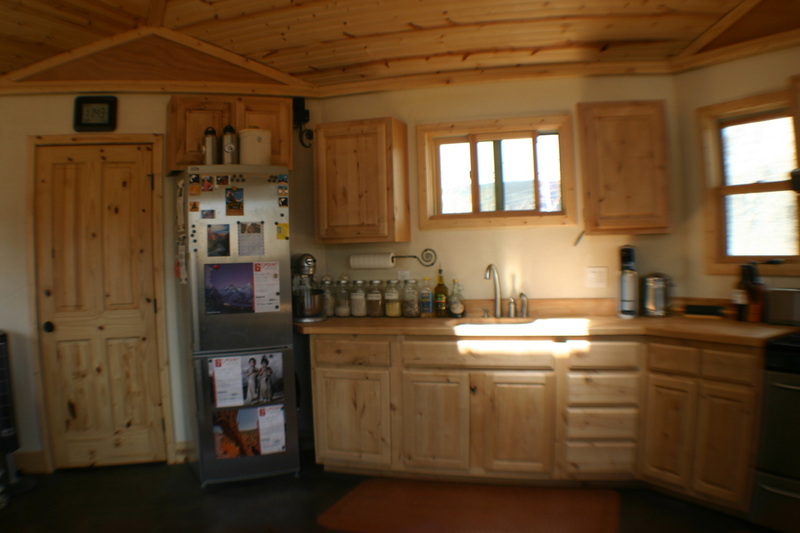 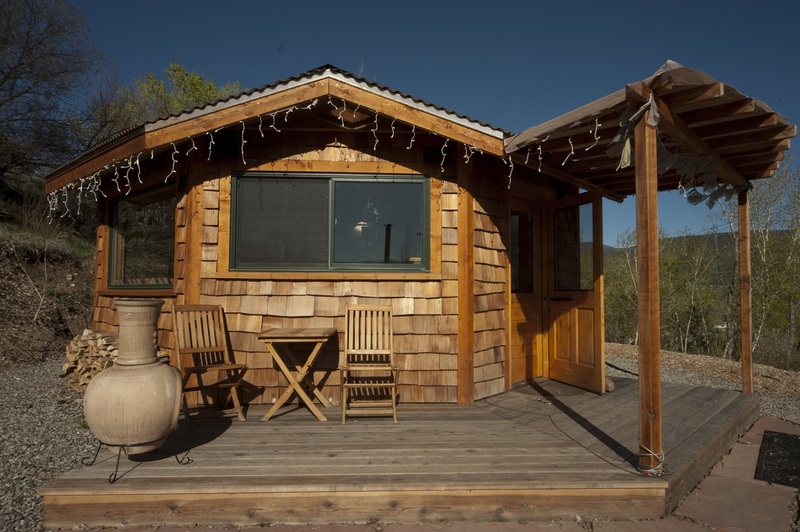 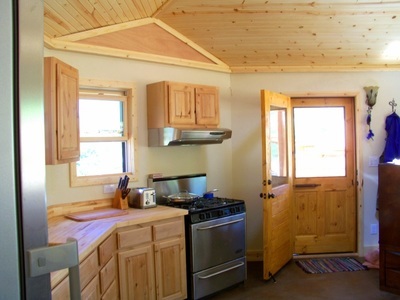 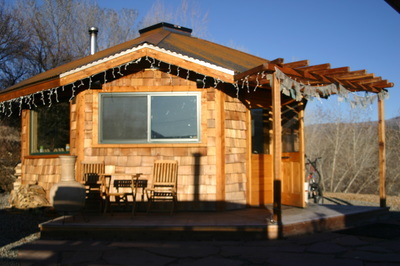 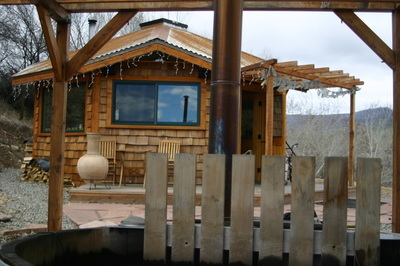 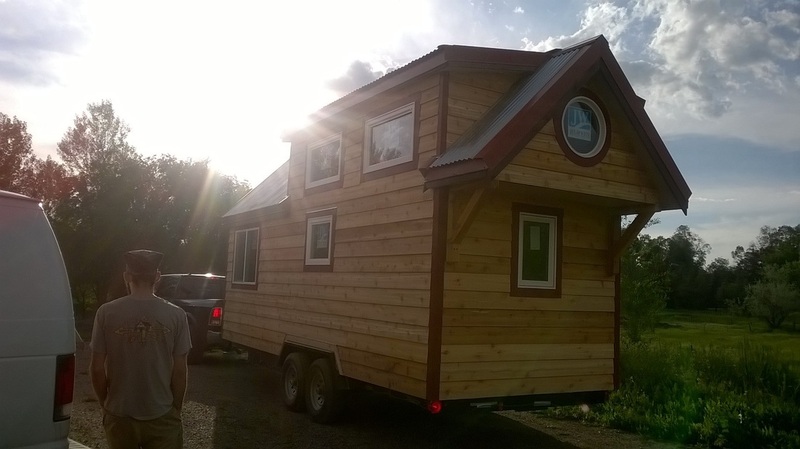 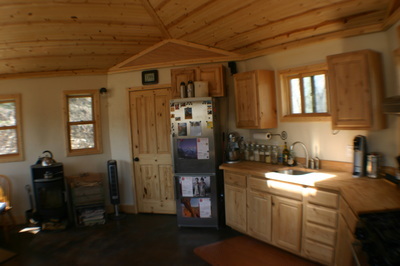 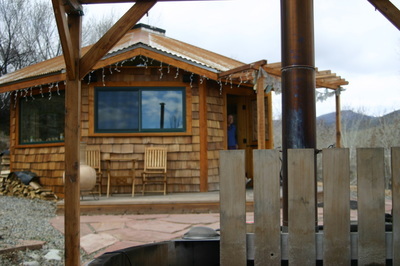 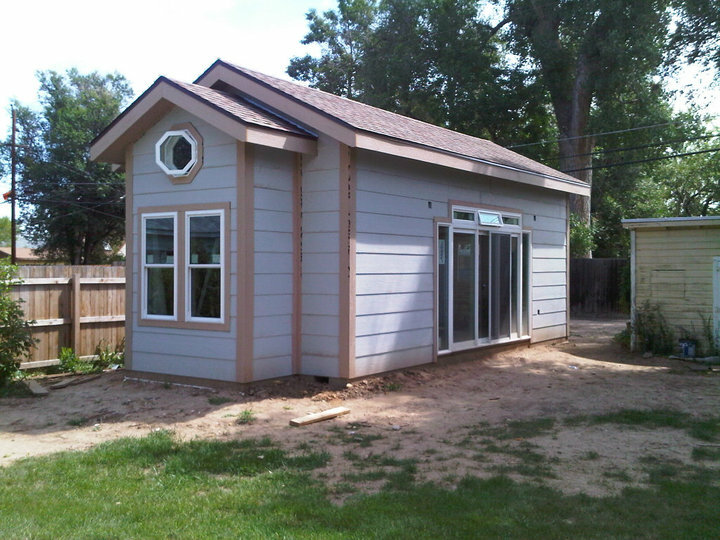 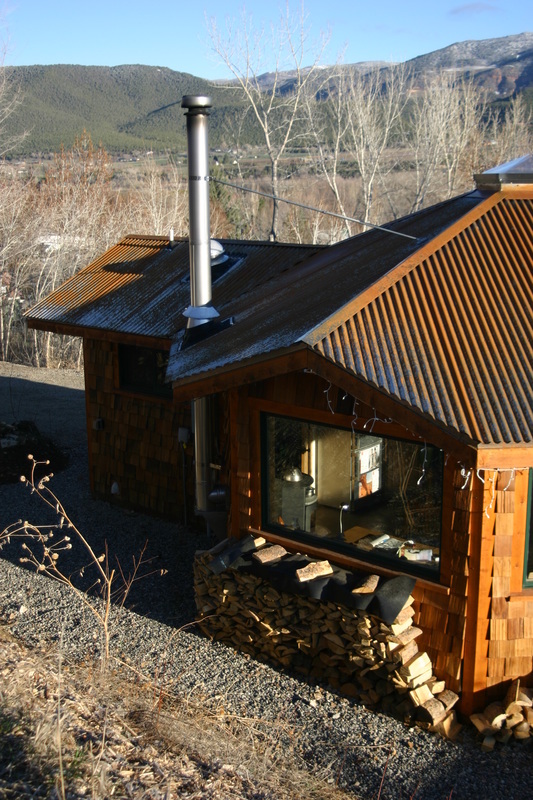 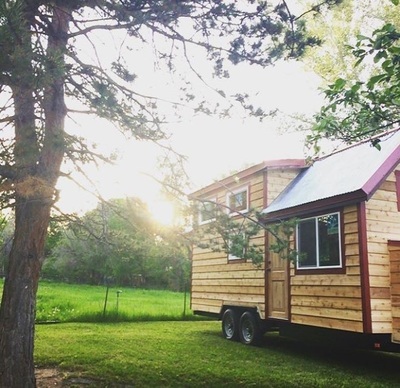 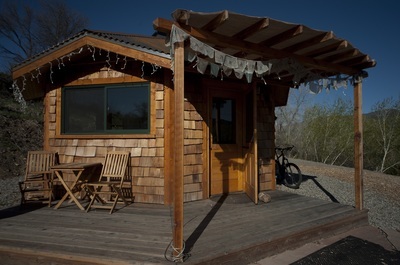 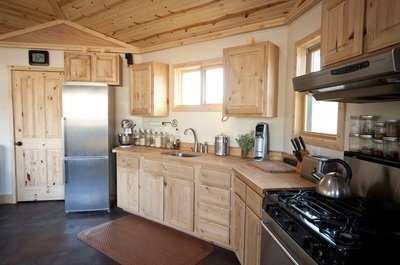 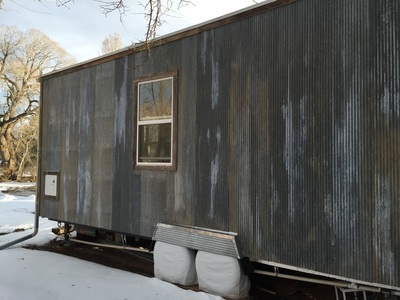 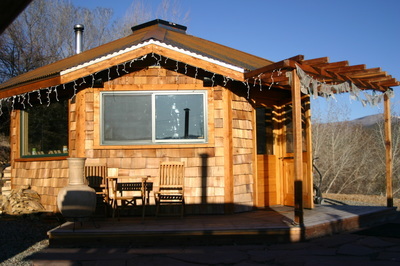 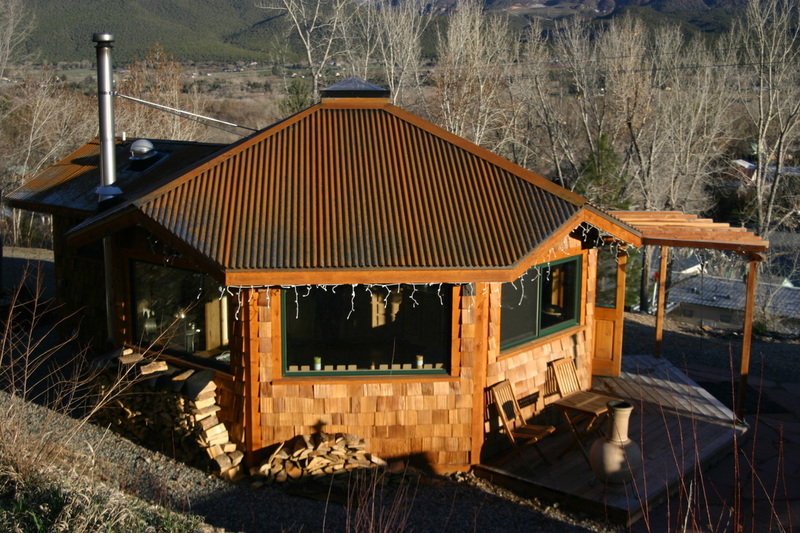 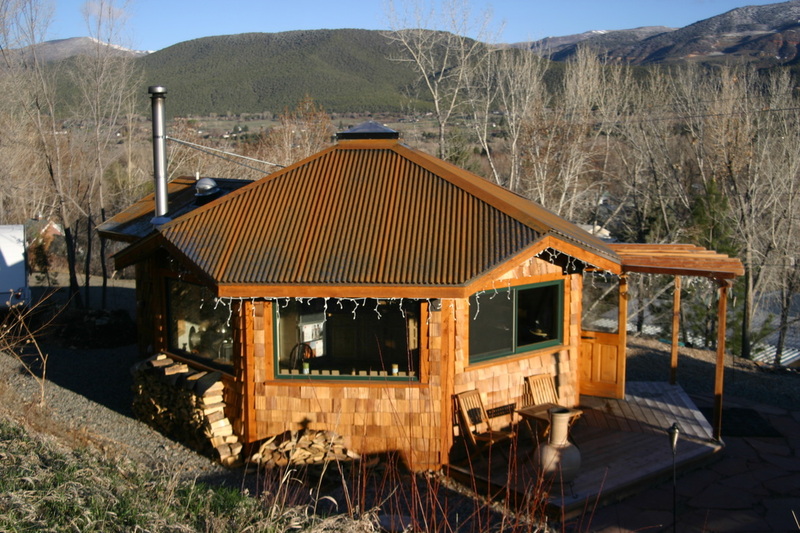 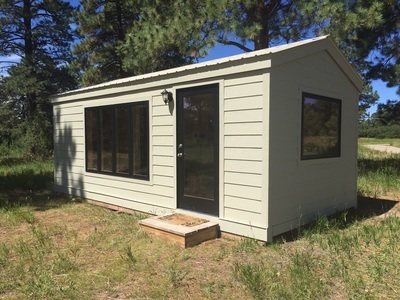 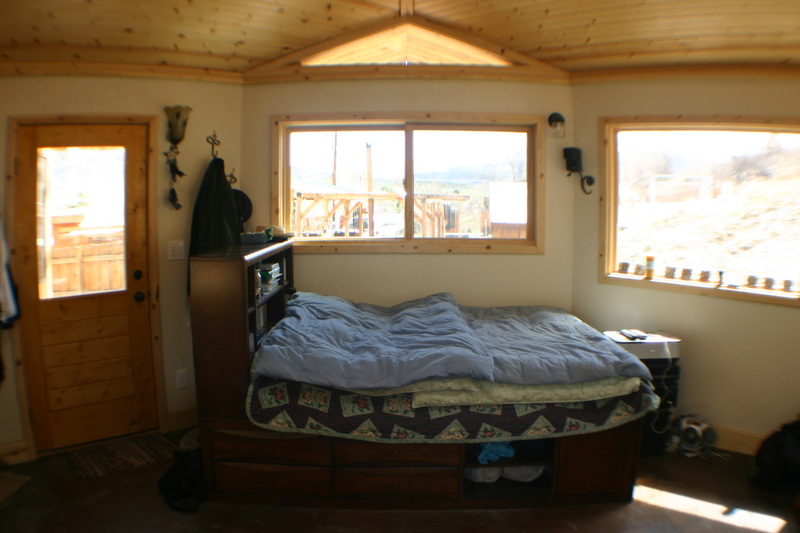 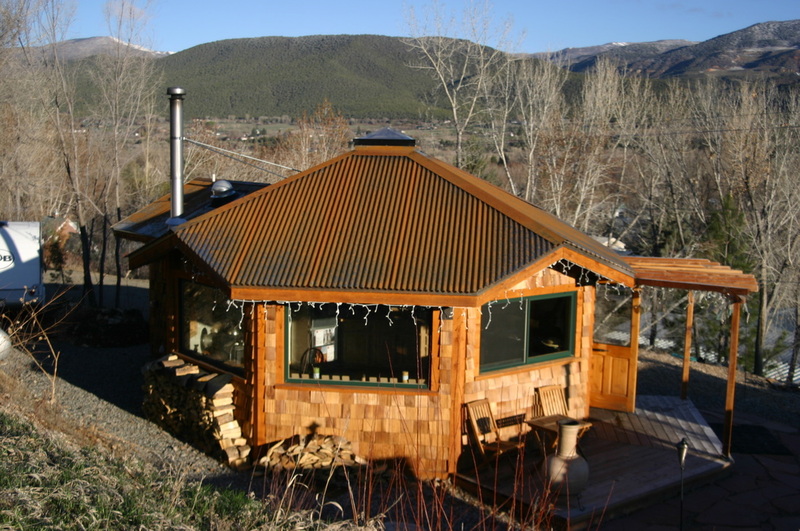 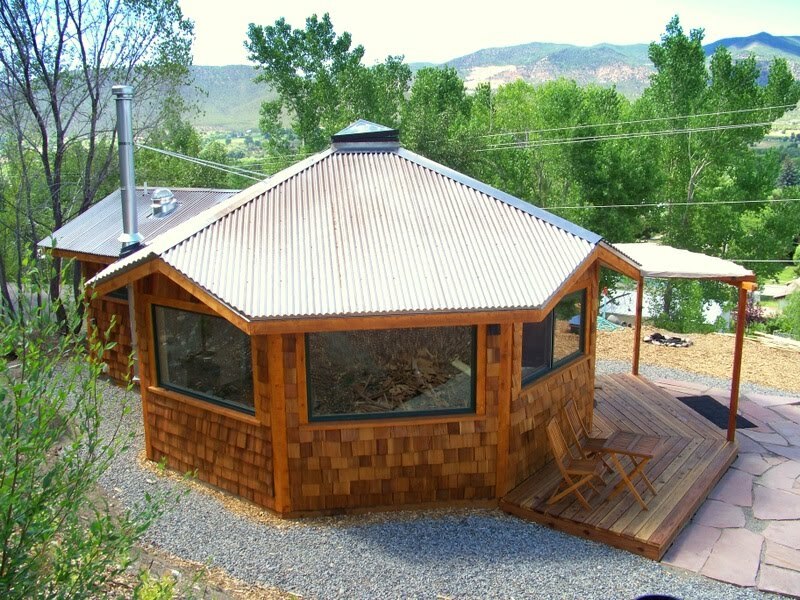 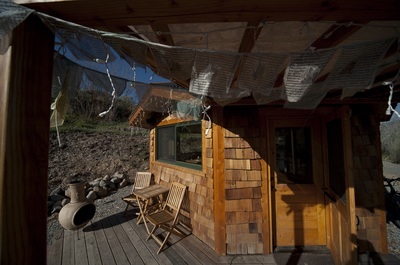 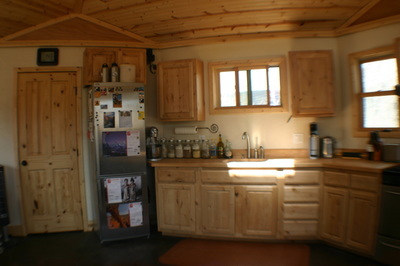 This tiny house near Durango, Colorado has 218 square feet of interior floor space. It is nearly 11' wide and a little more than 22’ long. The floor is made of R-28 (4.5"-thick) ICS SIPs. The walls are R-28 (4.5"-thick) ICS SIPs, and the roof is R-42 (6.5"-thick) ICS SIPs. 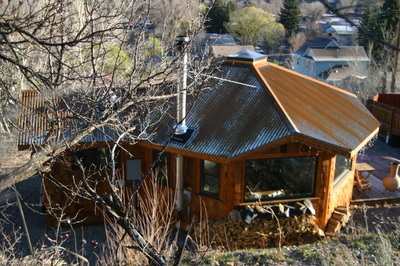 John contracted Oliver Whiting to build it. 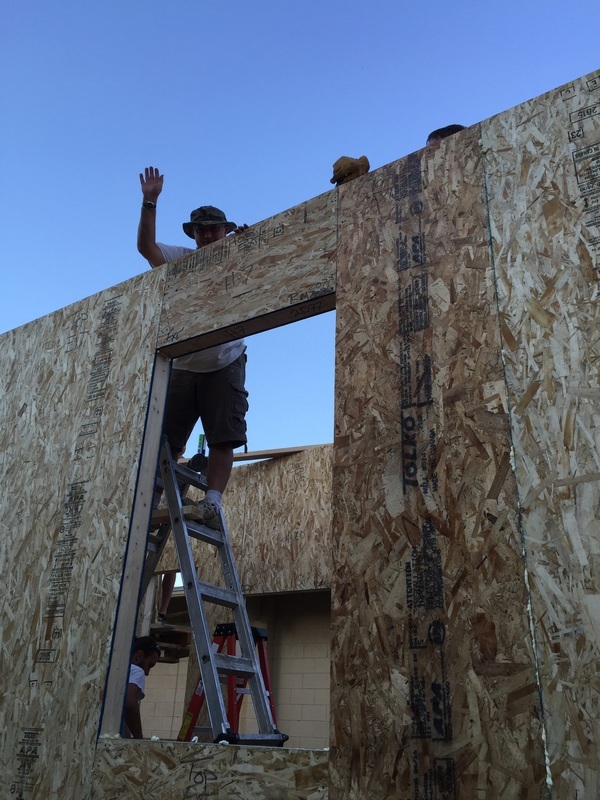 All the ICS SIPs wall and roof panels were installed in one day by one man! 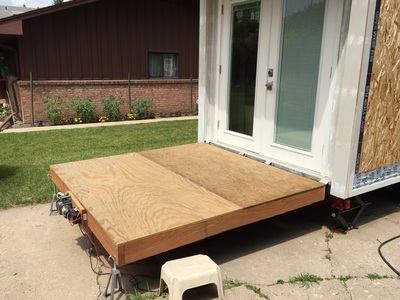 It is built on skids so that it can be slid onto a trailer. 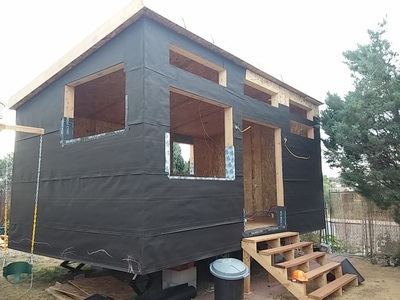 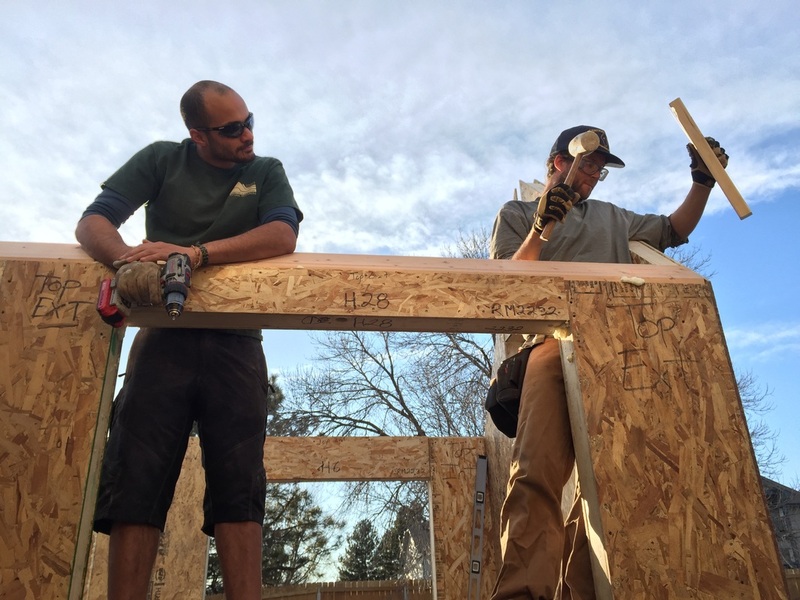 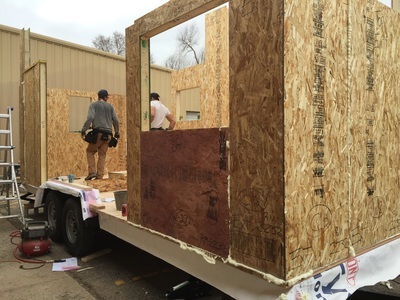 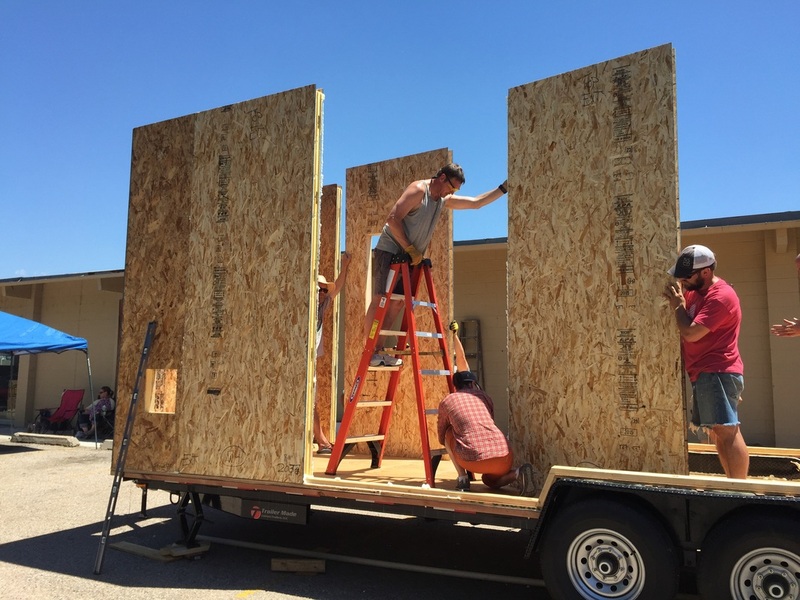 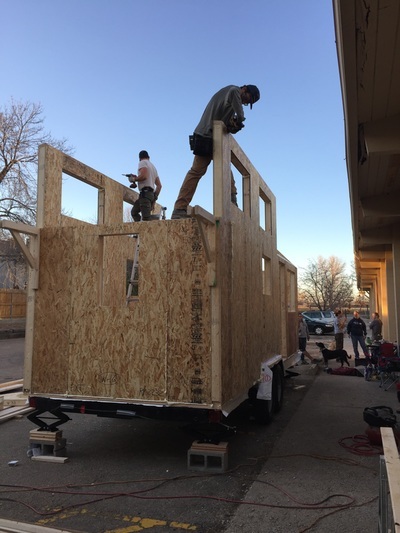 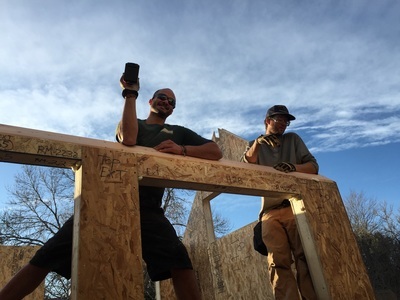 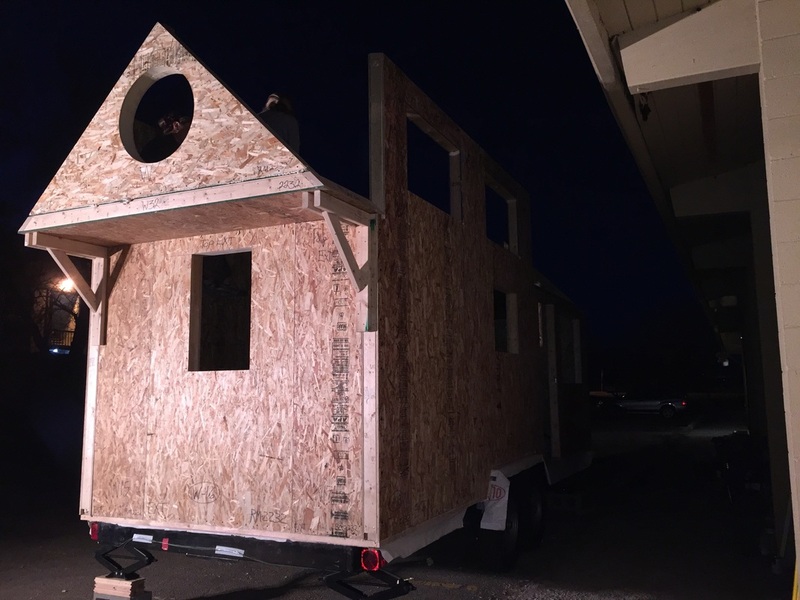 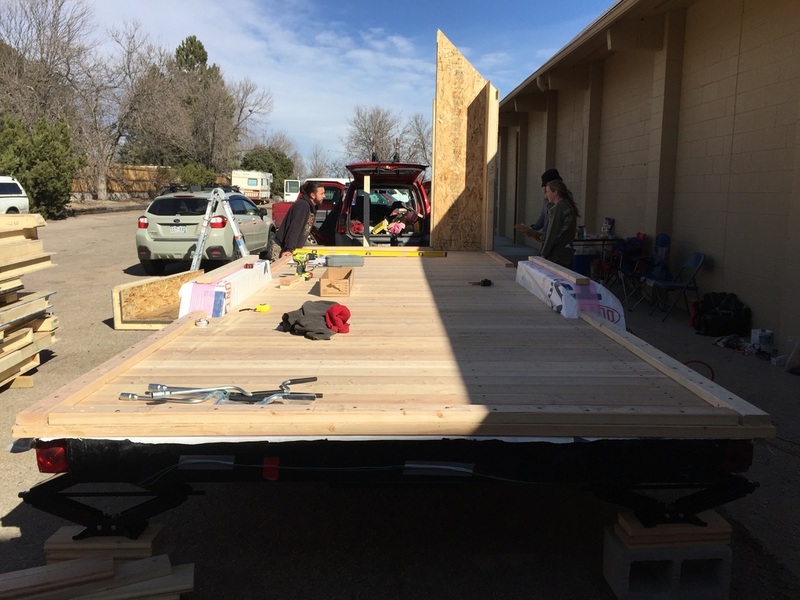 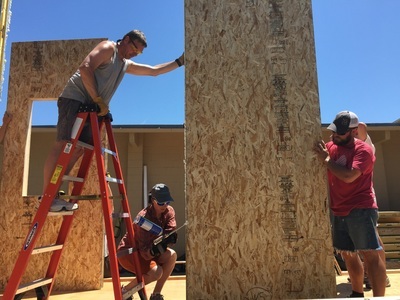 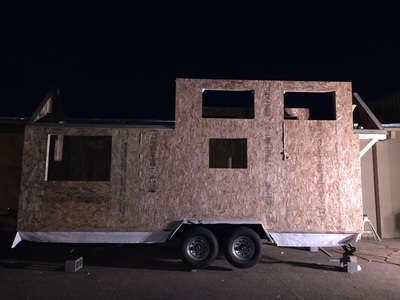 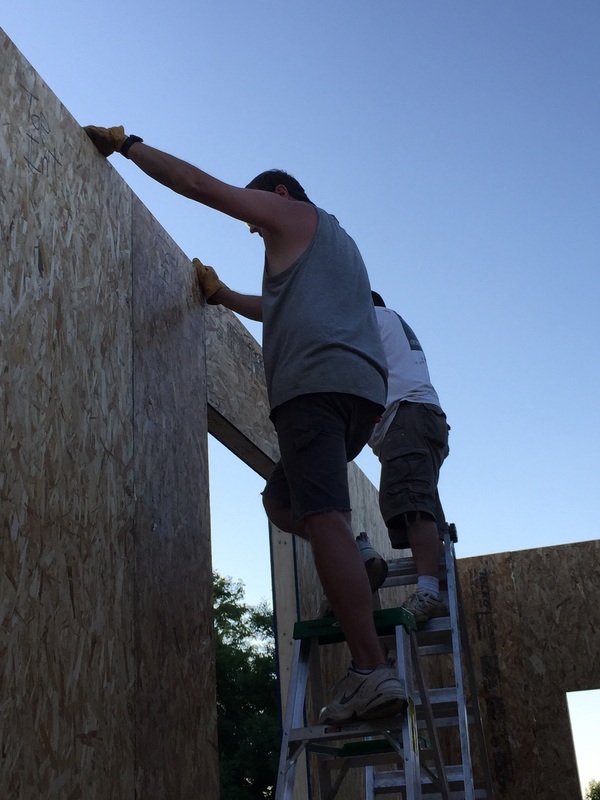 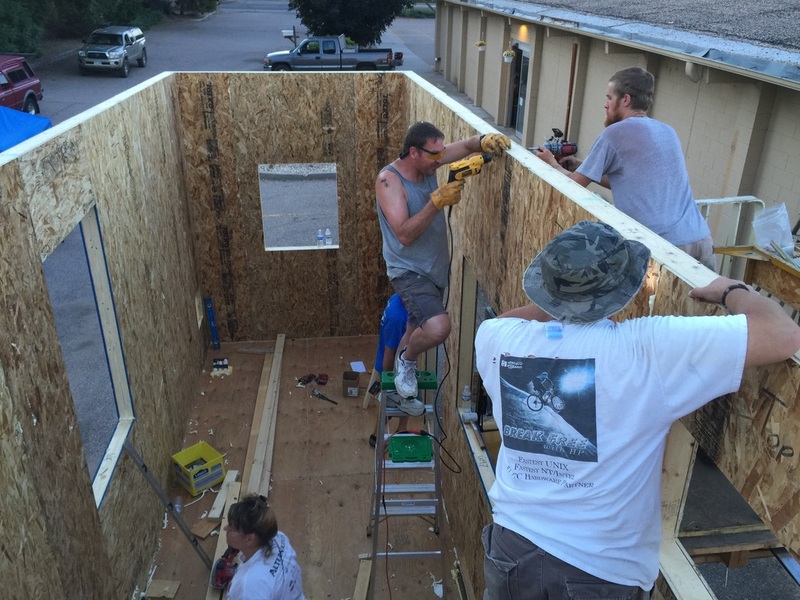 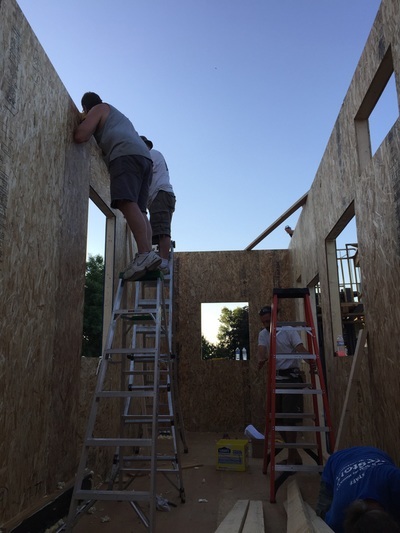 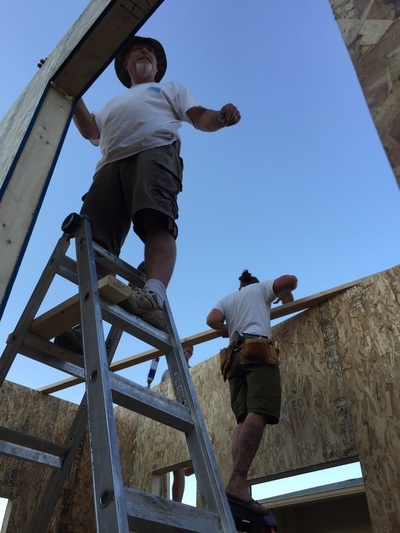 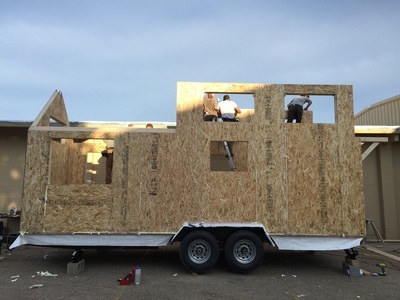 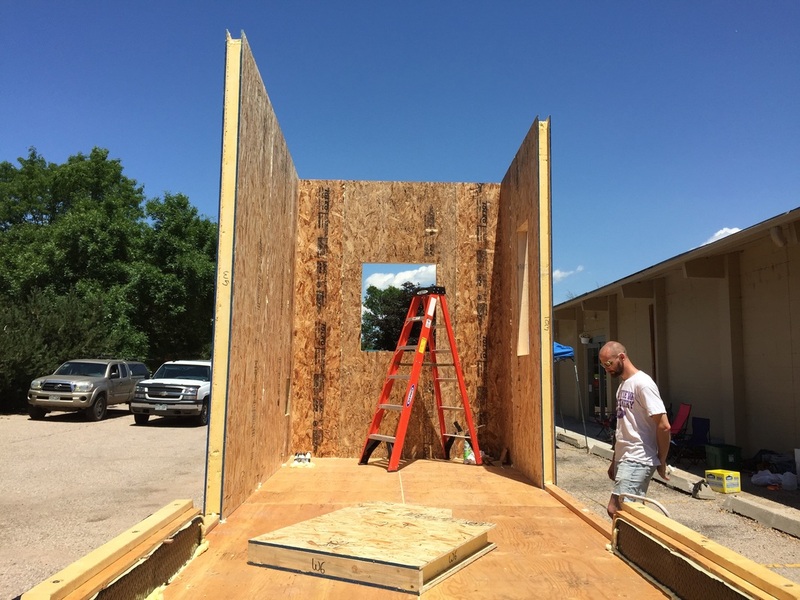 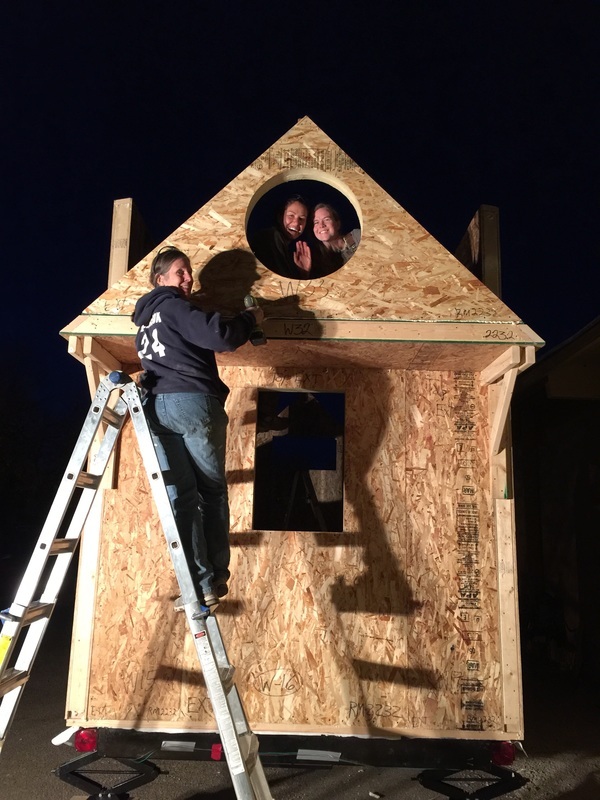 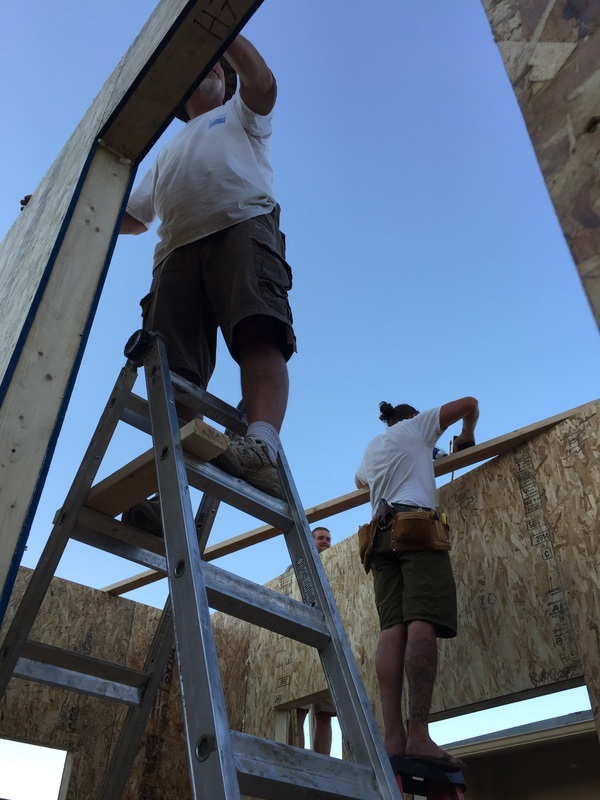 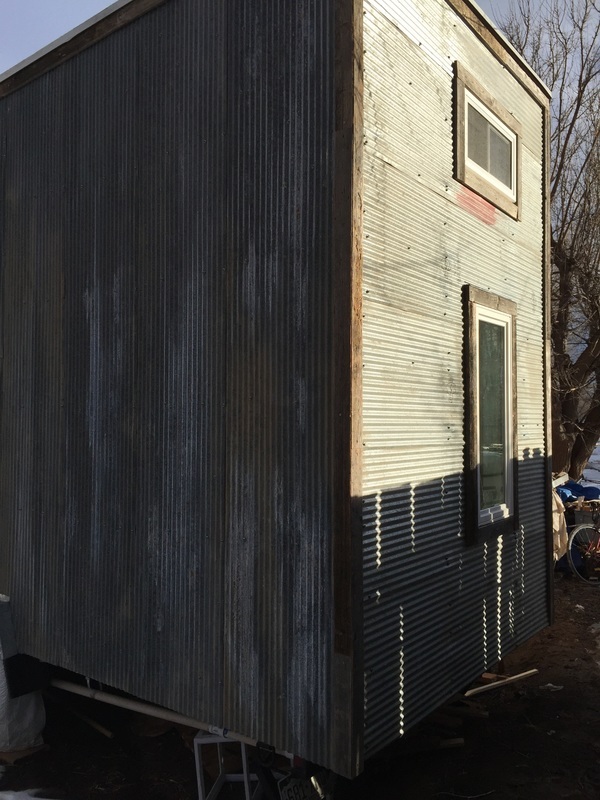 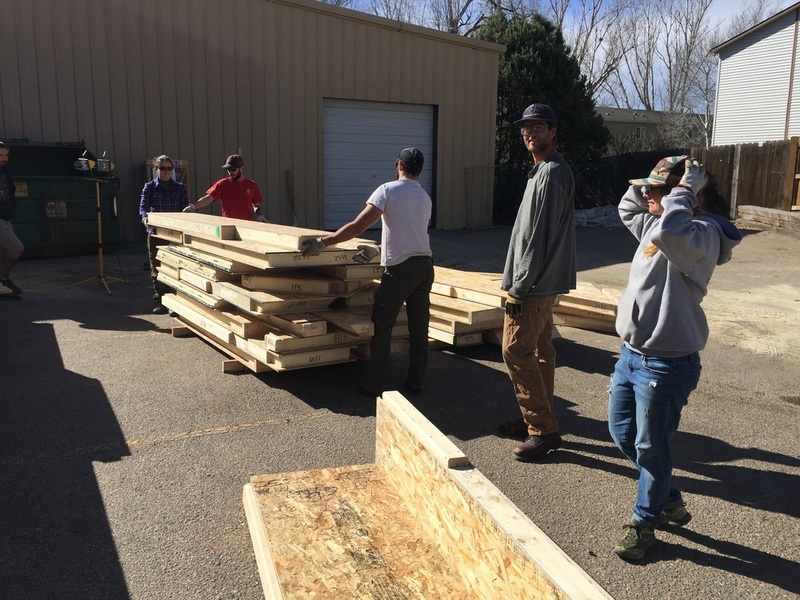 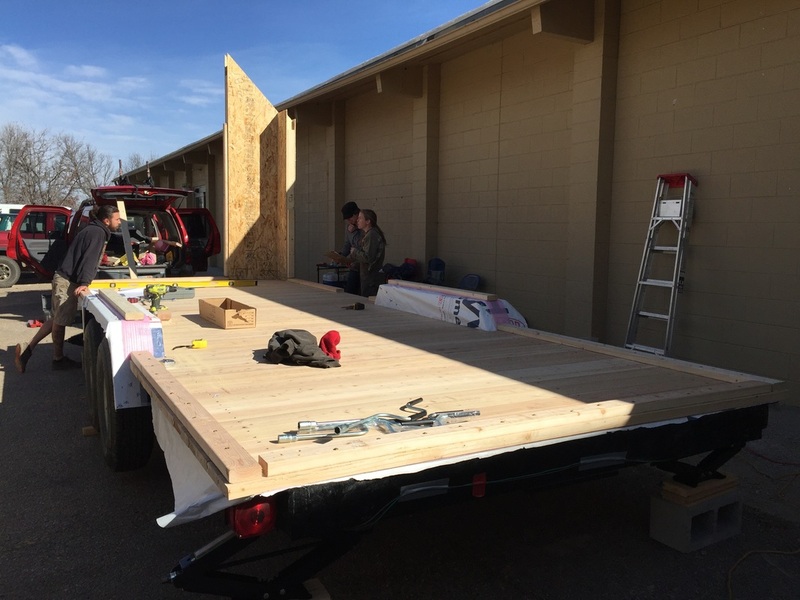 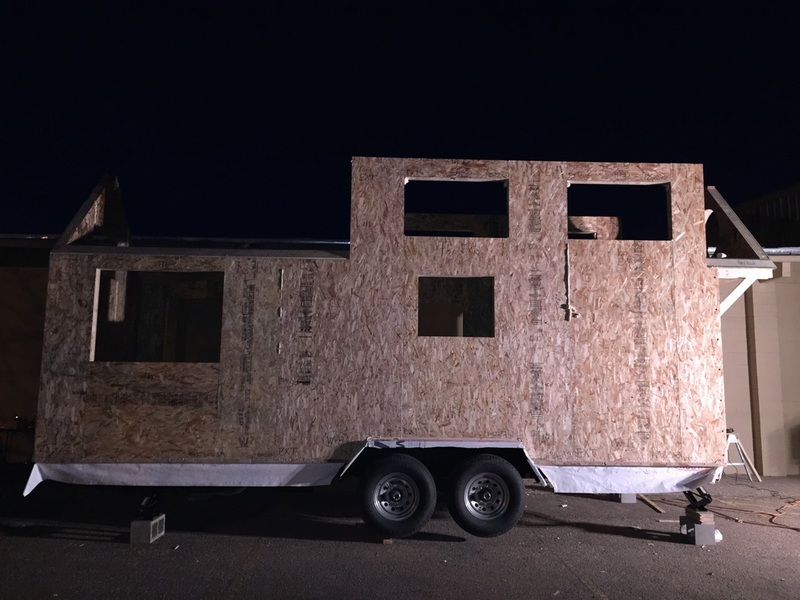 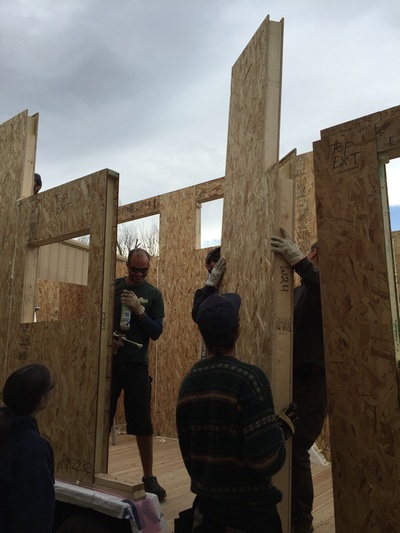 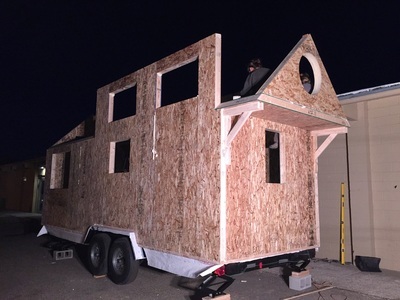 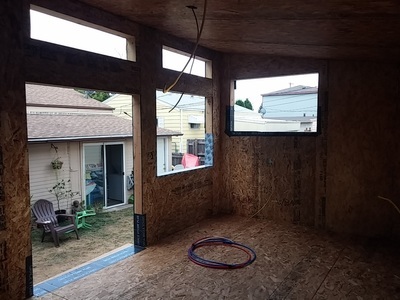 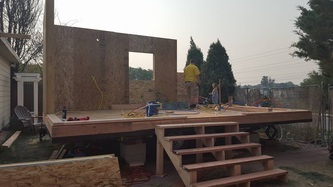 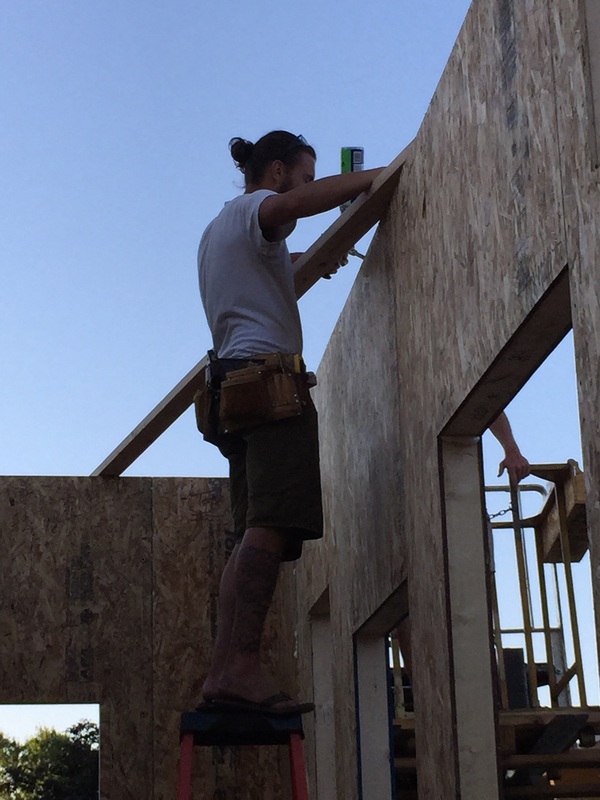 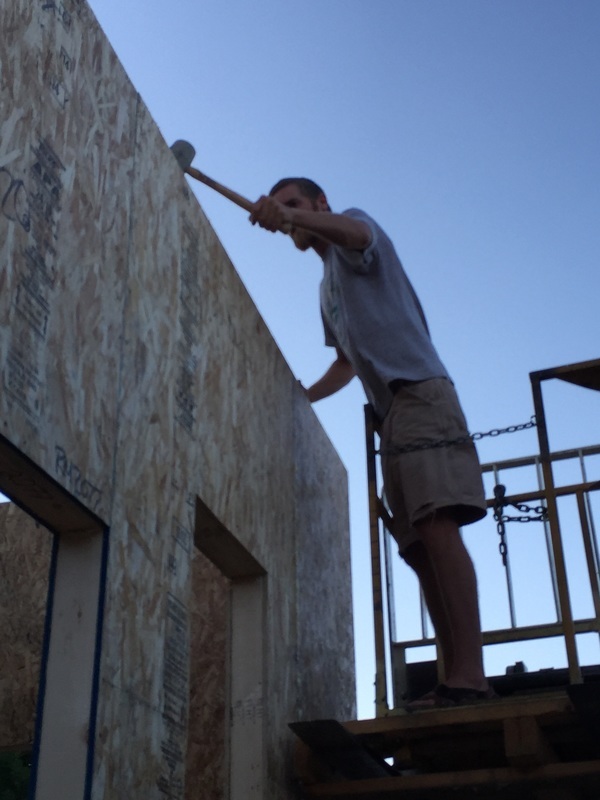 Justin's family and friends came together for an amazing and fun "tiny house-raising" party, and it only took one and a half days to assemble the walls and roof. 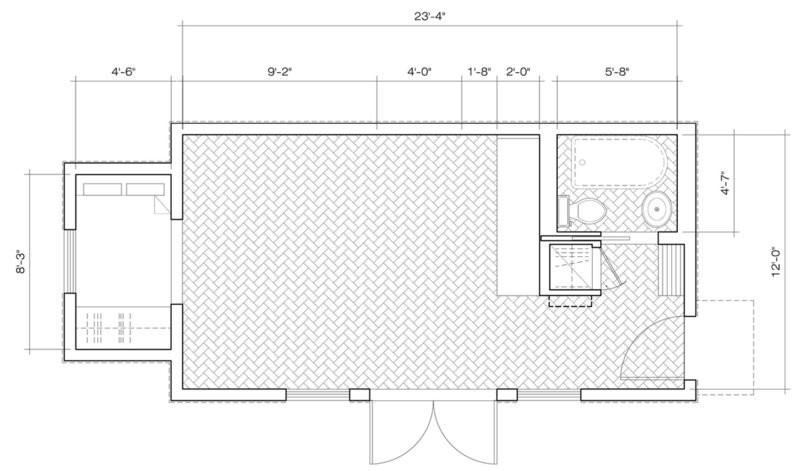 His design sports 176 square feet of interior floor space on the main level plus 64 square feet in the loft. 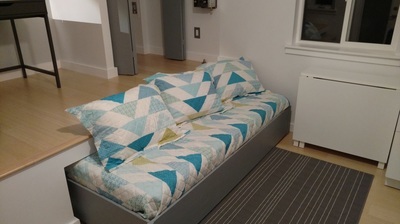 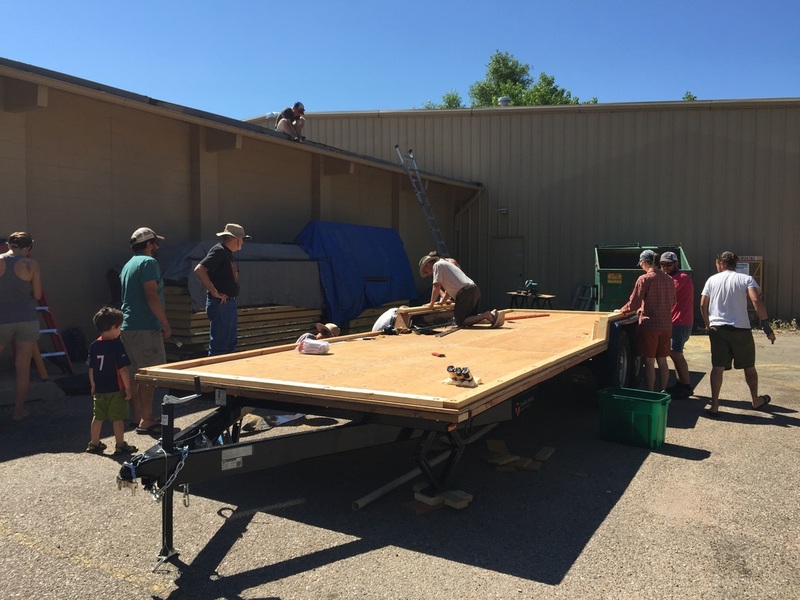 The unit is 8' wide and 25' long. 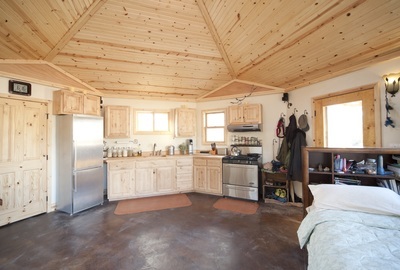 The floor was spray-foamed. 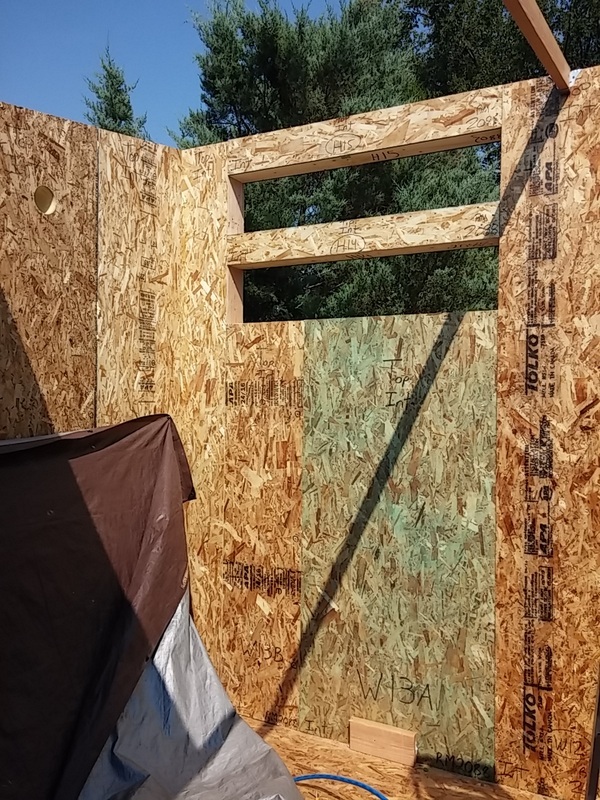 The walls are R-28 (4.5"-thick) ICS SIPs, and the roof is R-42 (6.5"-thick) ICS SIPs. 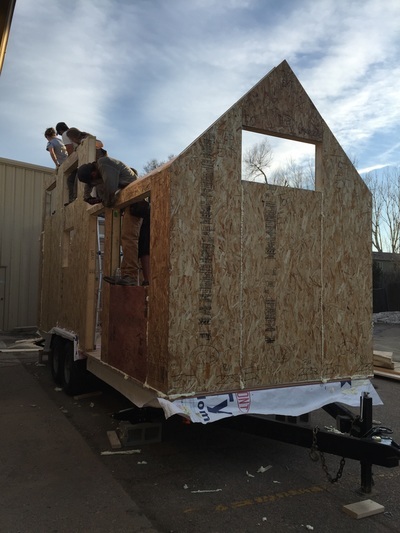 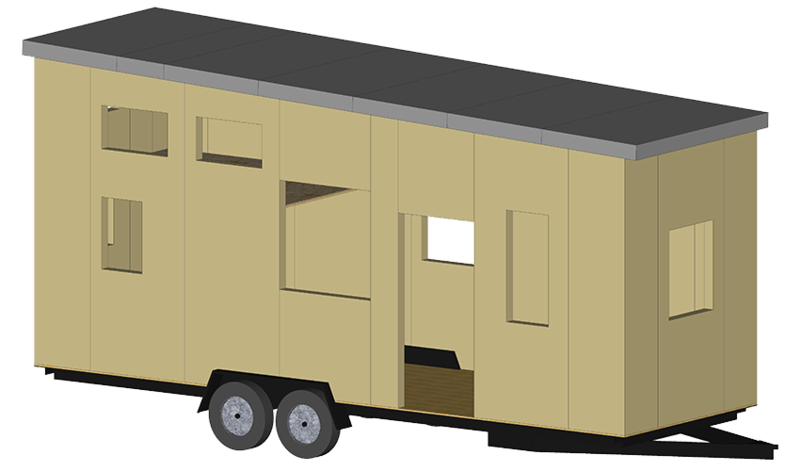 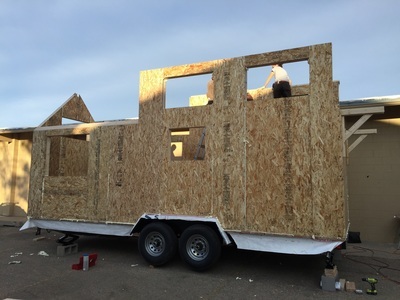 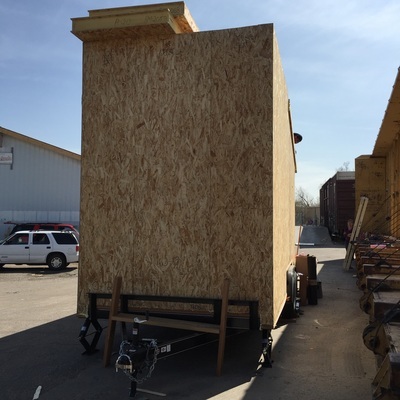 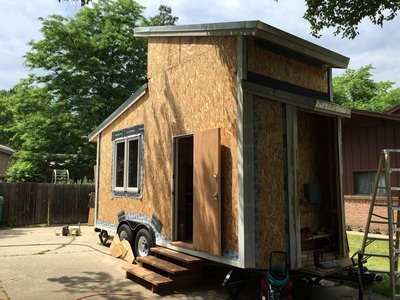 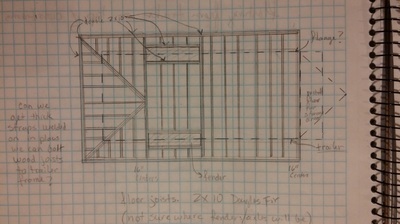 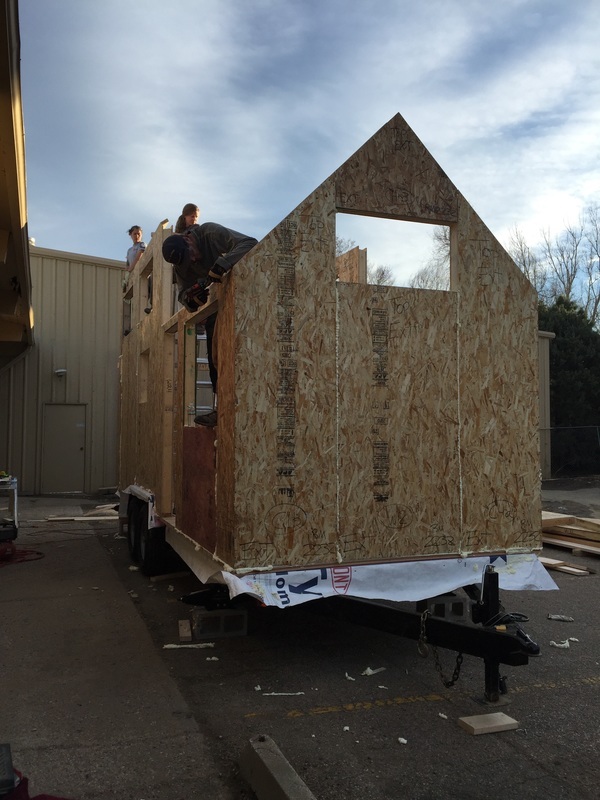 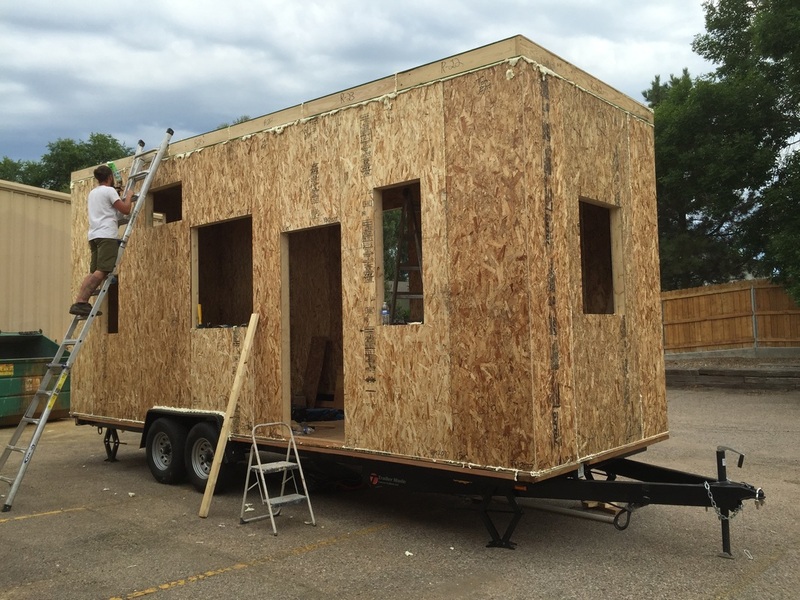 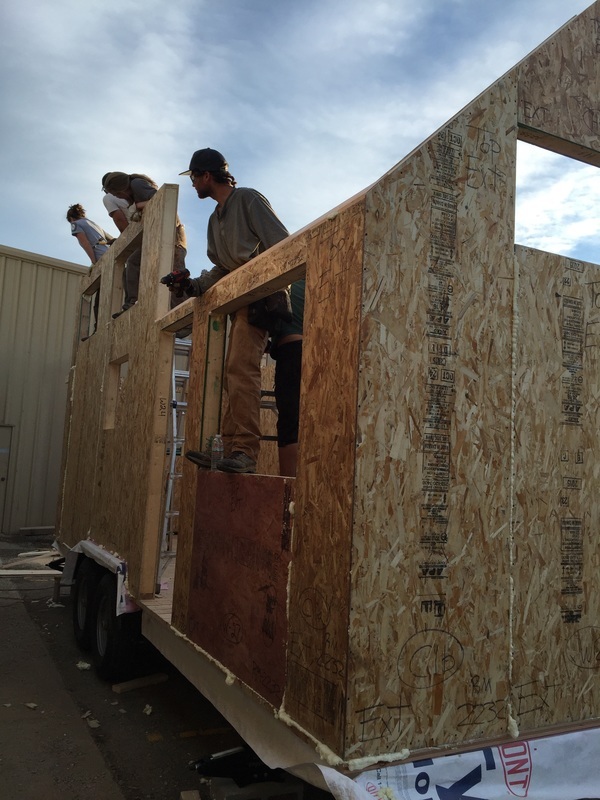 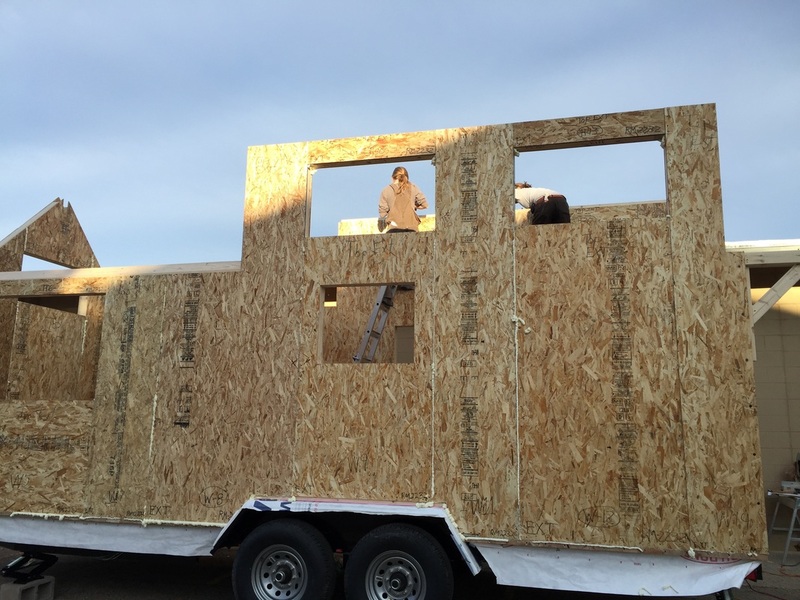 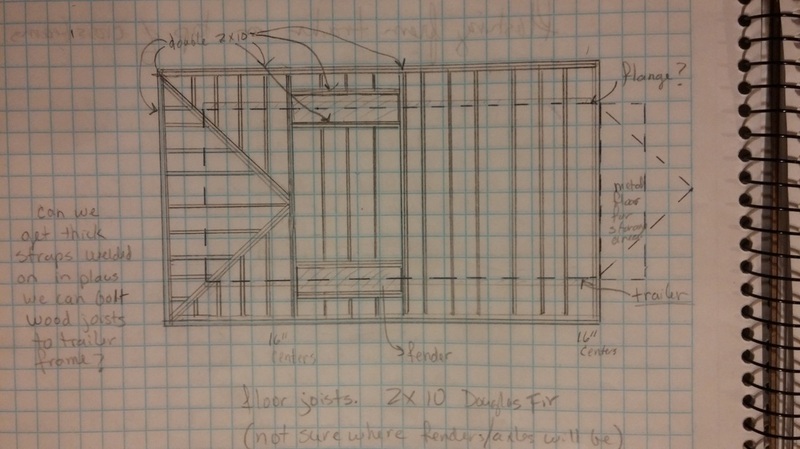 Aaron and his mother Virya have designed a 12' x 20' tiny house for a trailer and ICS SIPs custom-produced the panels for their design. 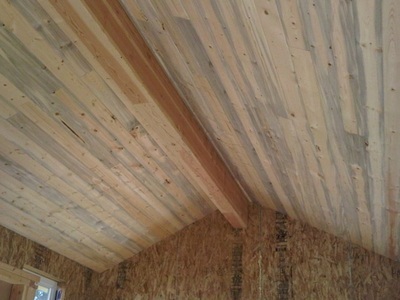 The walls are R-28 (4.5"-thick) ICS SIPs, and the roof is R-42 (6.5"-thick) ICS SIPs. 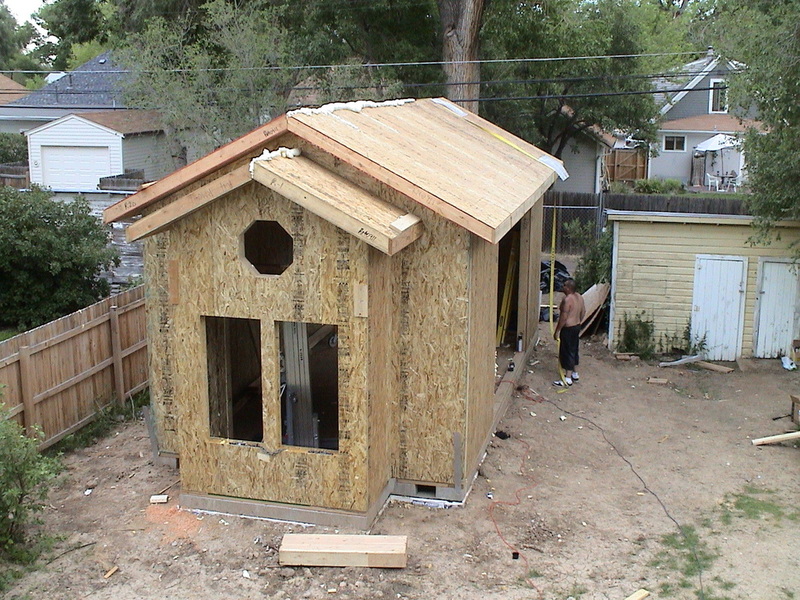 ​They call it "The Nun's Home." 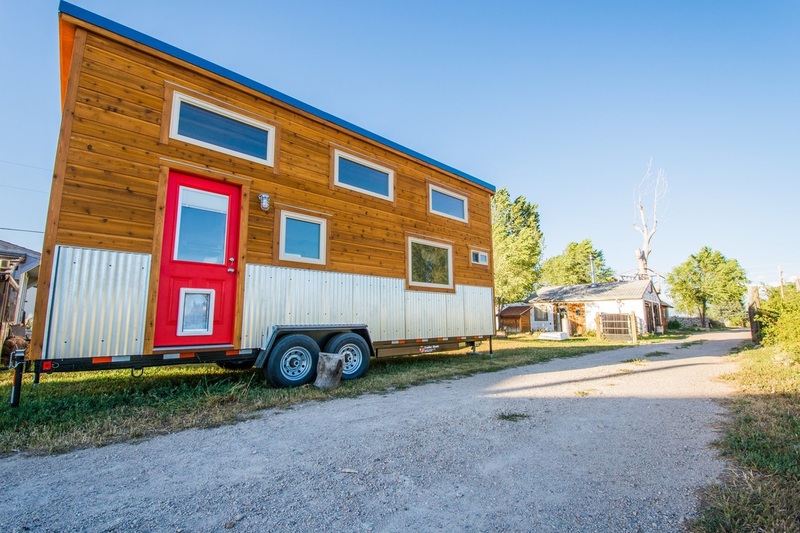 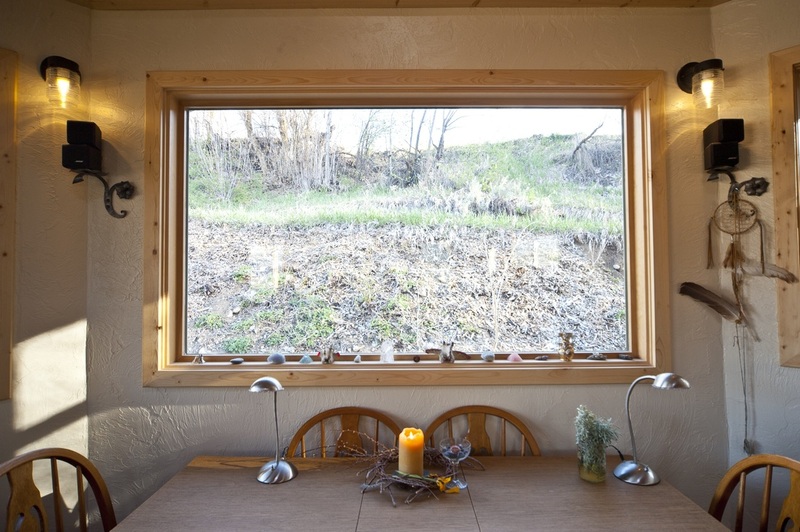 The Nun’s Home is a mid-sized tiny home with everything needed for two people and their furry friends to live comfortably, including all the conveniences of a larger home. 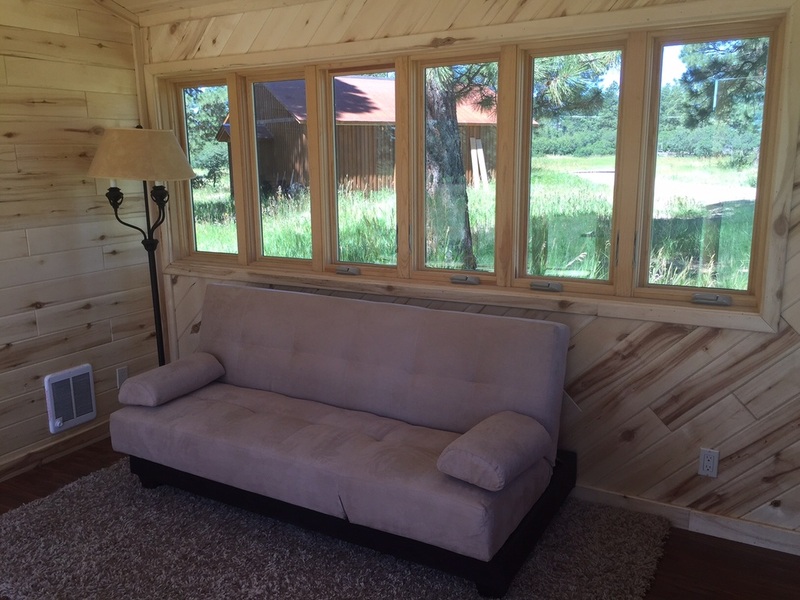 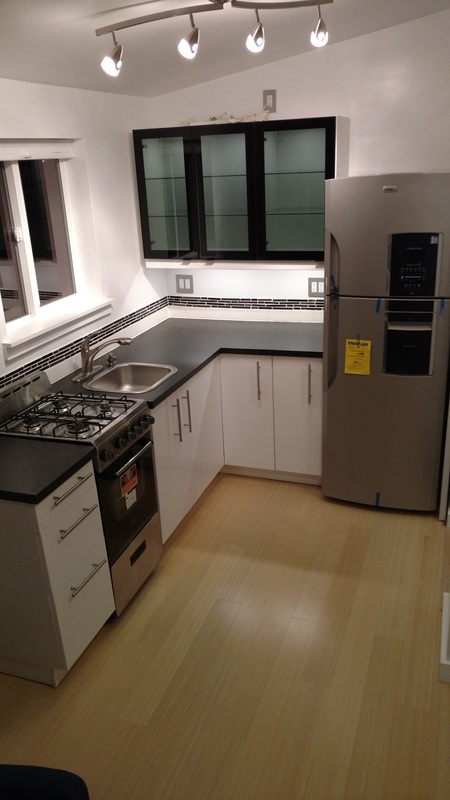 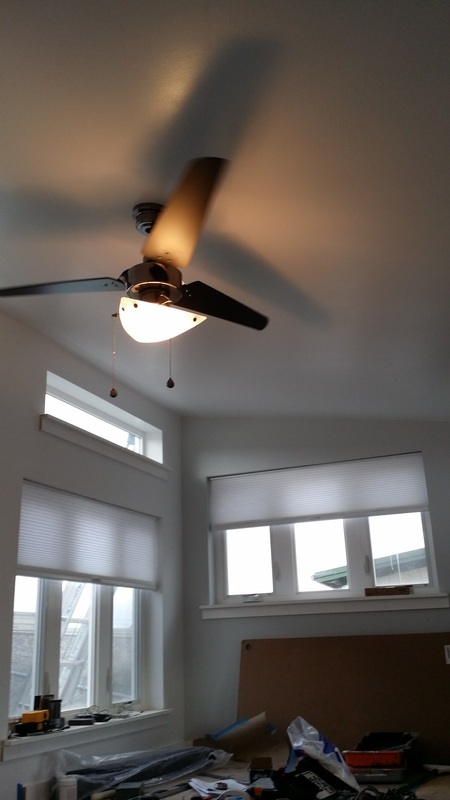 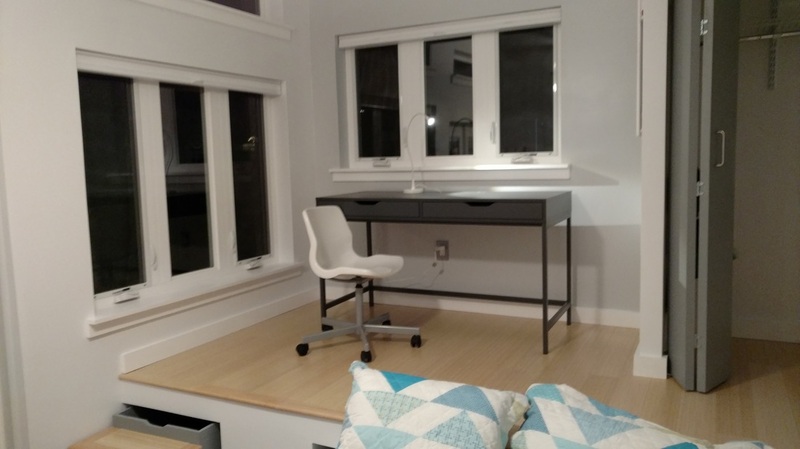 With large windows and french style doors, this unit allows for much natural light. 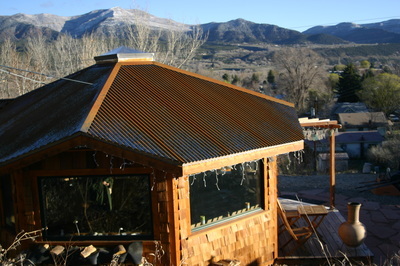 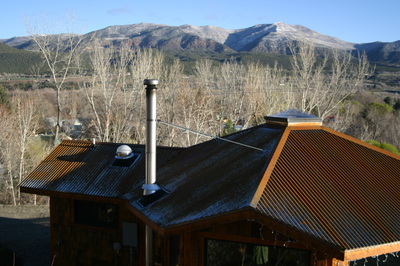 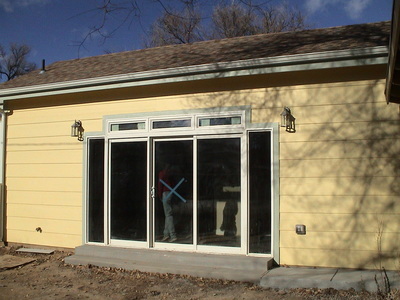 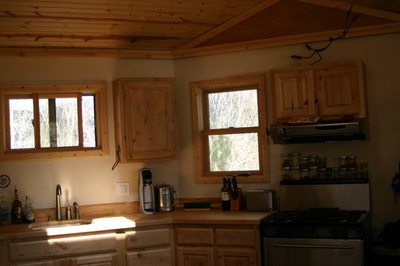 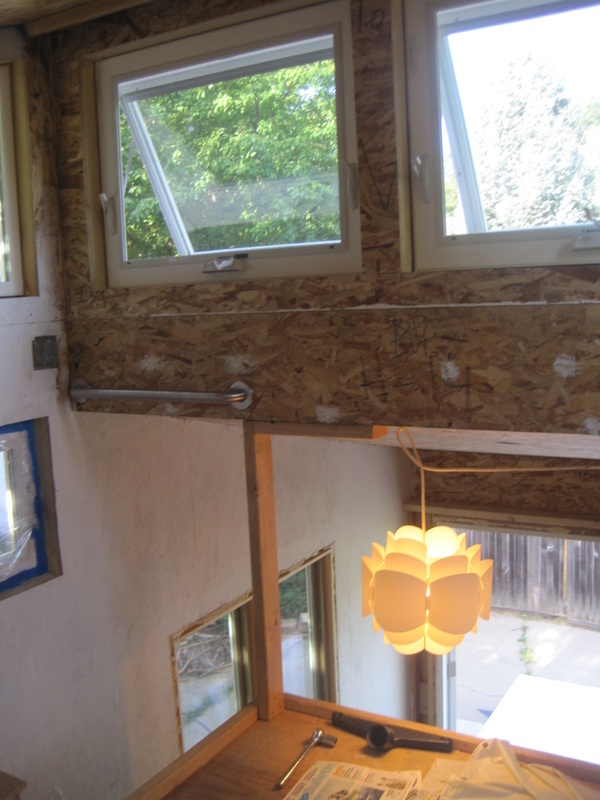 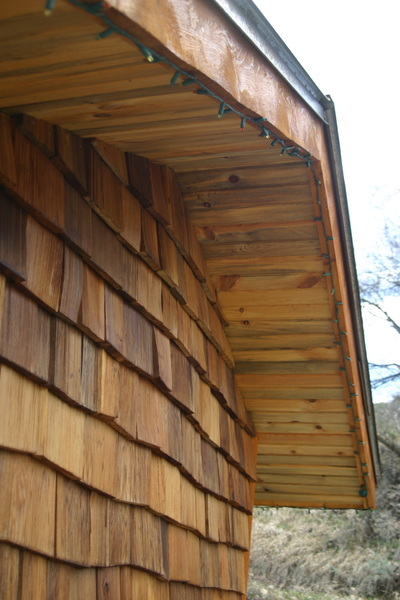 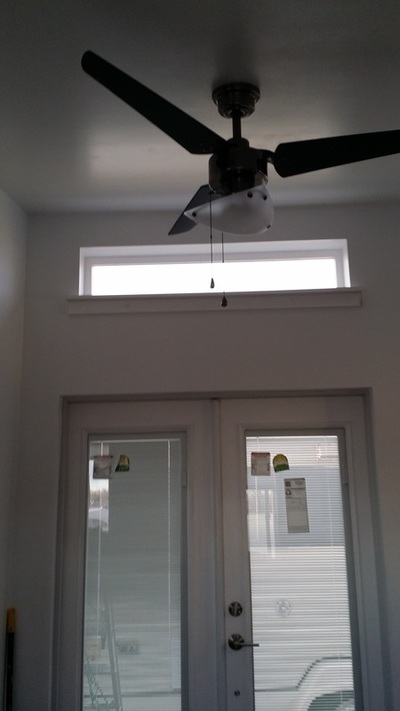 With correct orientation, it can provide much passive solar heating. The model home is 12 feet wide by 20 feet long with an exceptionally spacious feeling and ceiling heights that range from 9’ 6” to 7’ 6”, and is still easy to move with a simple permit on its quality trailer foundation. 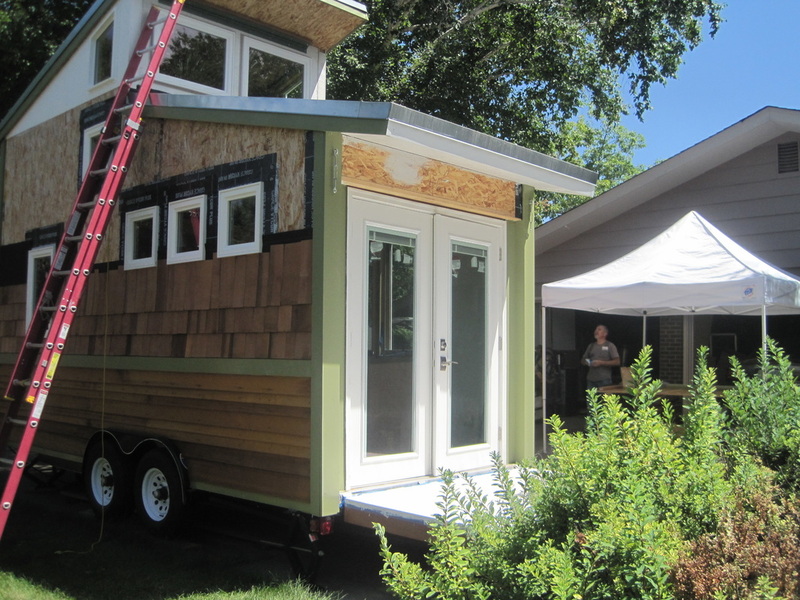 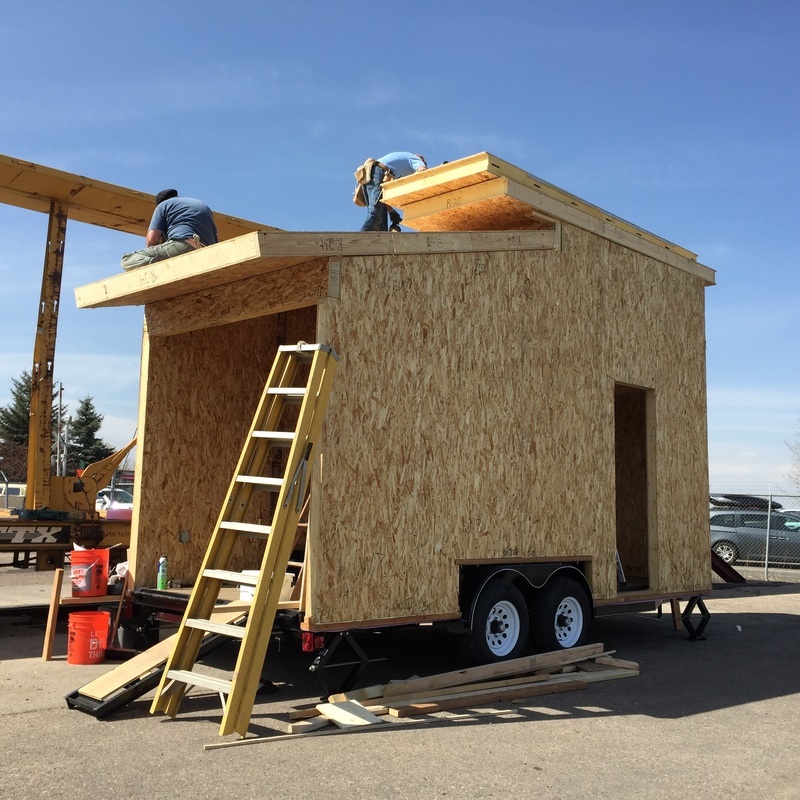 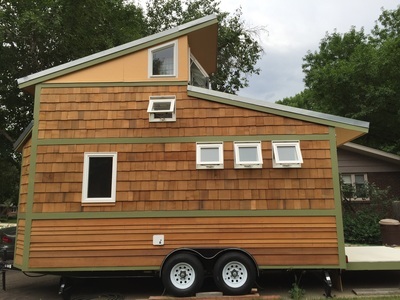 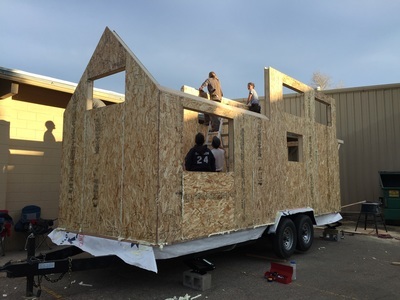 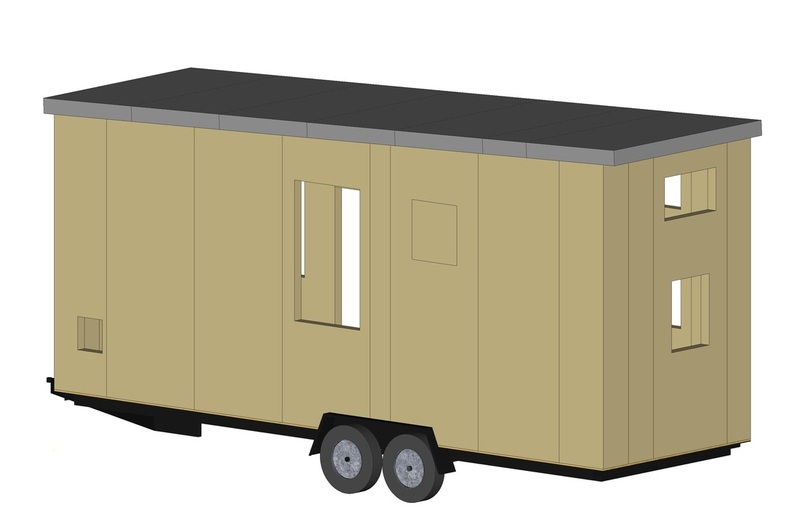 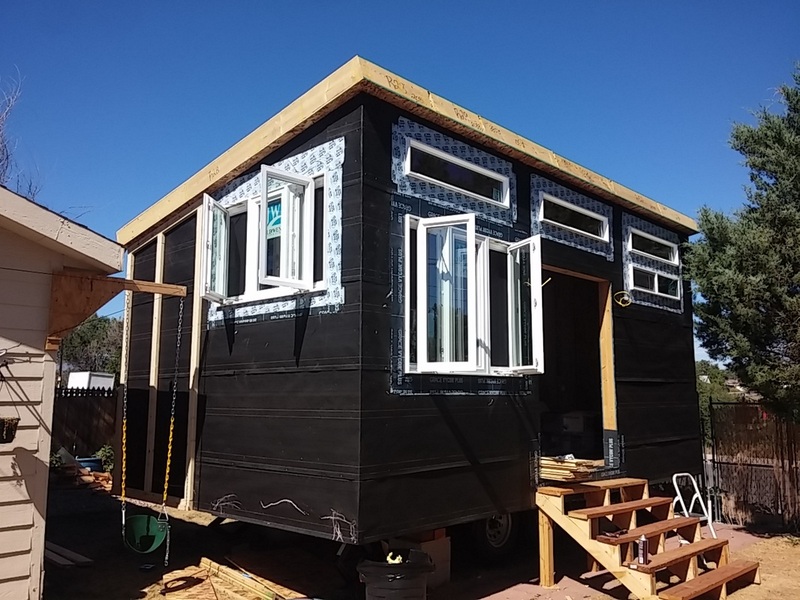 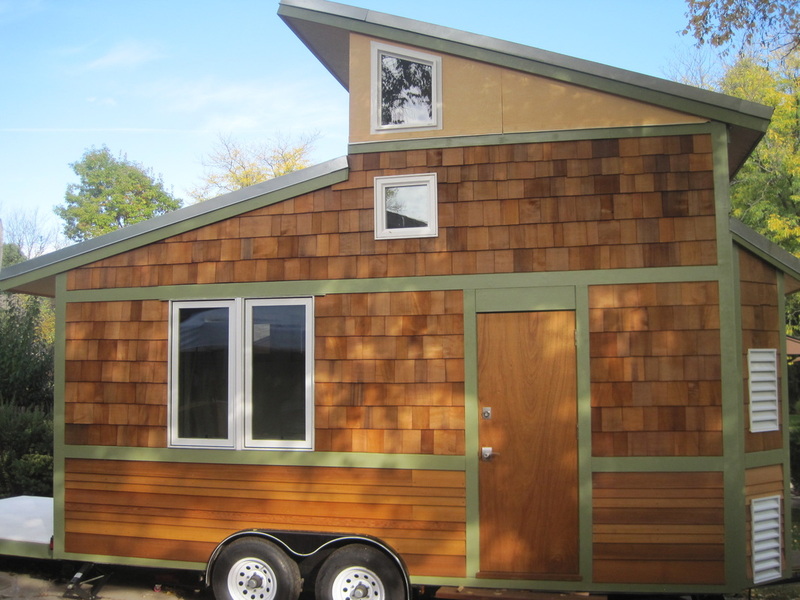 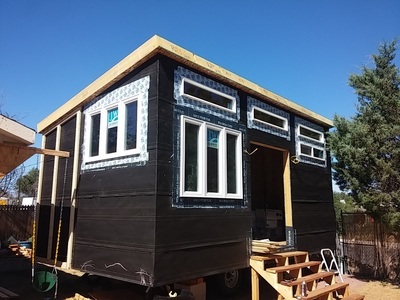 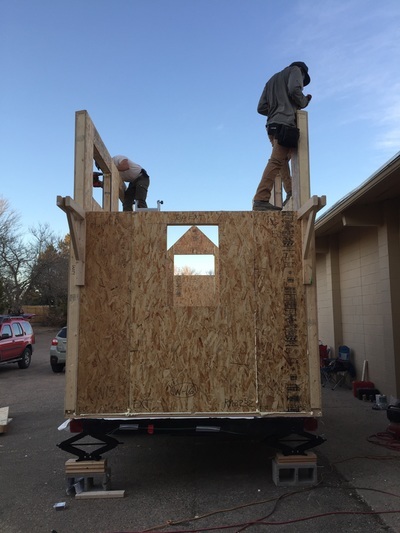 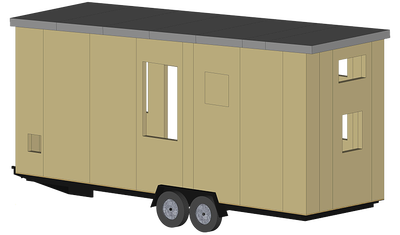 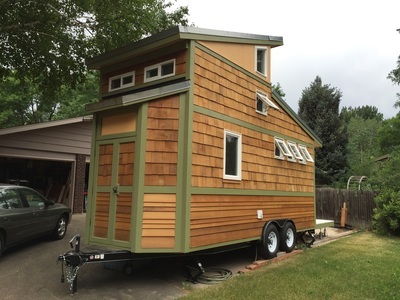 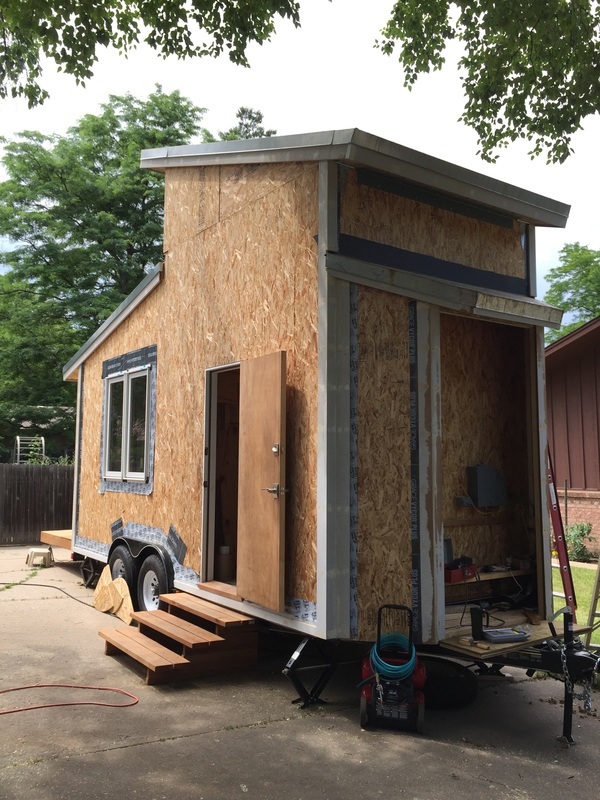 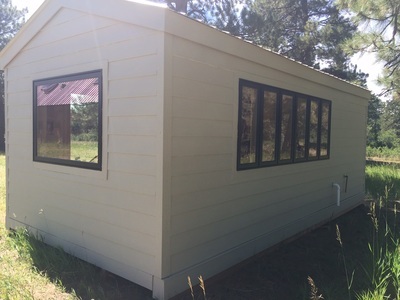 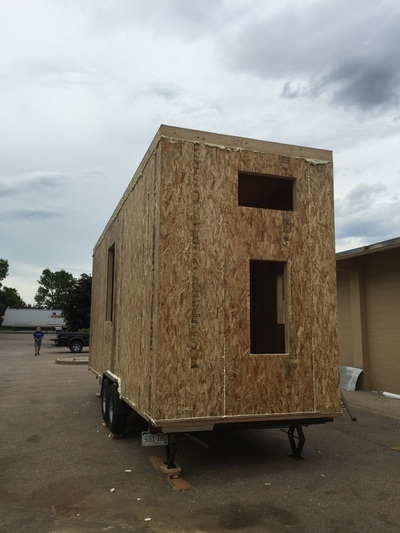 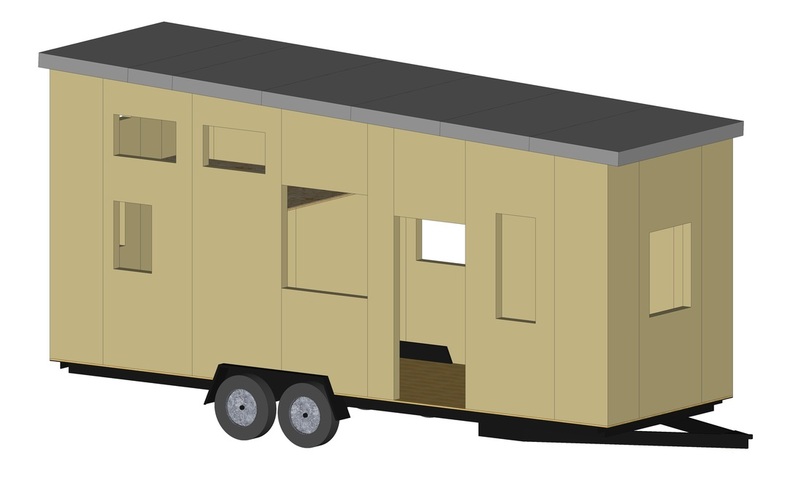 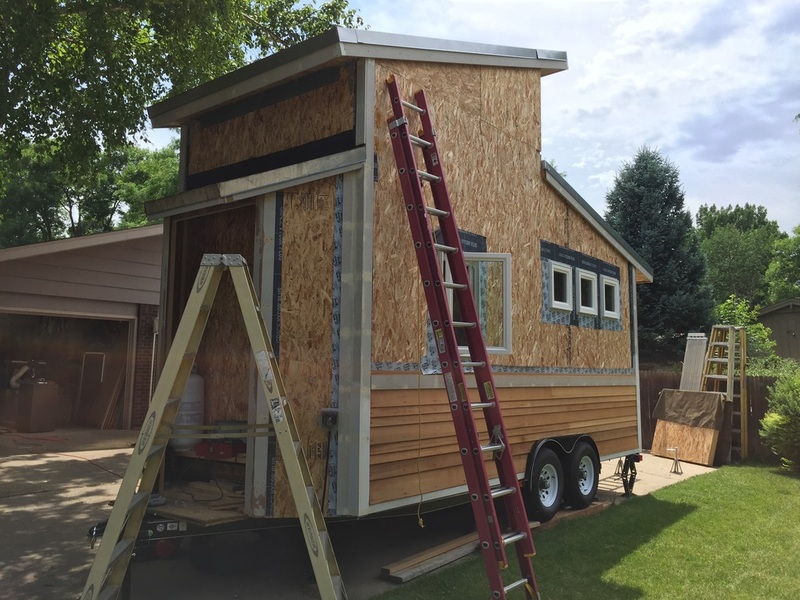 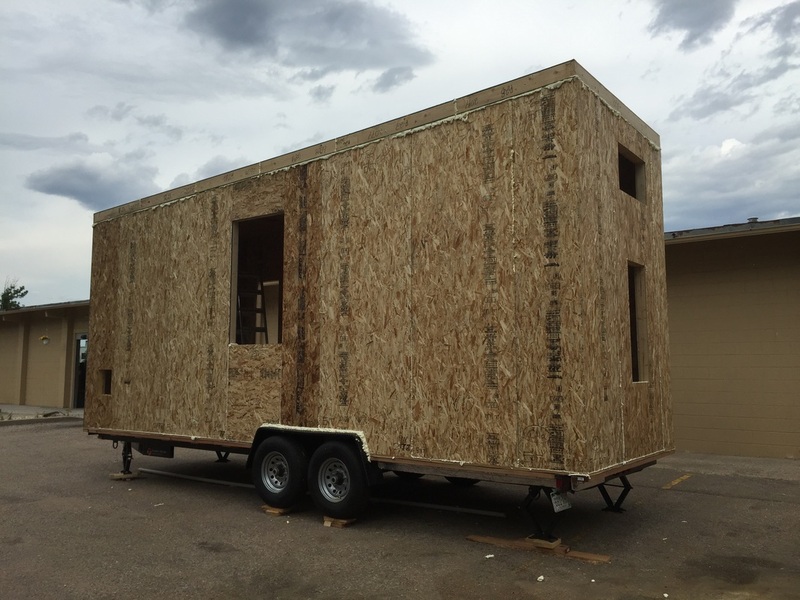 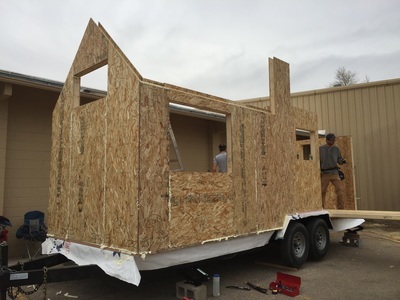 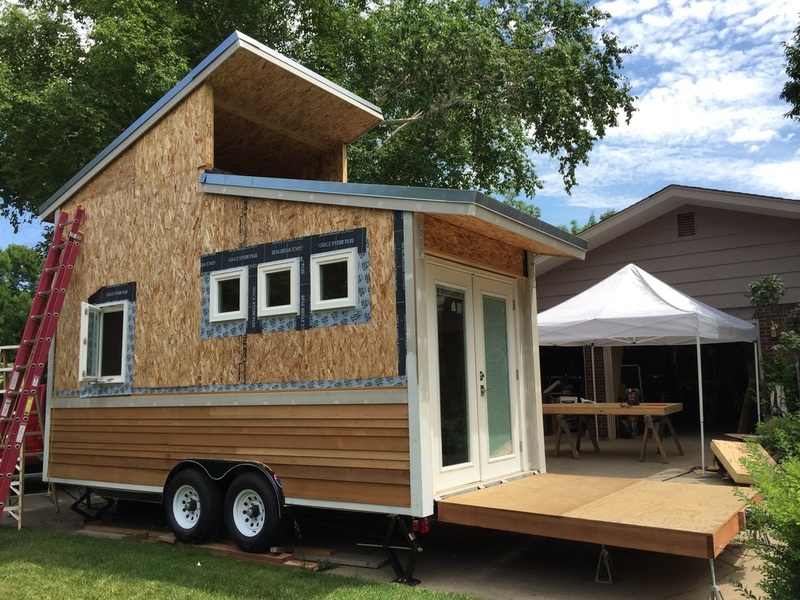 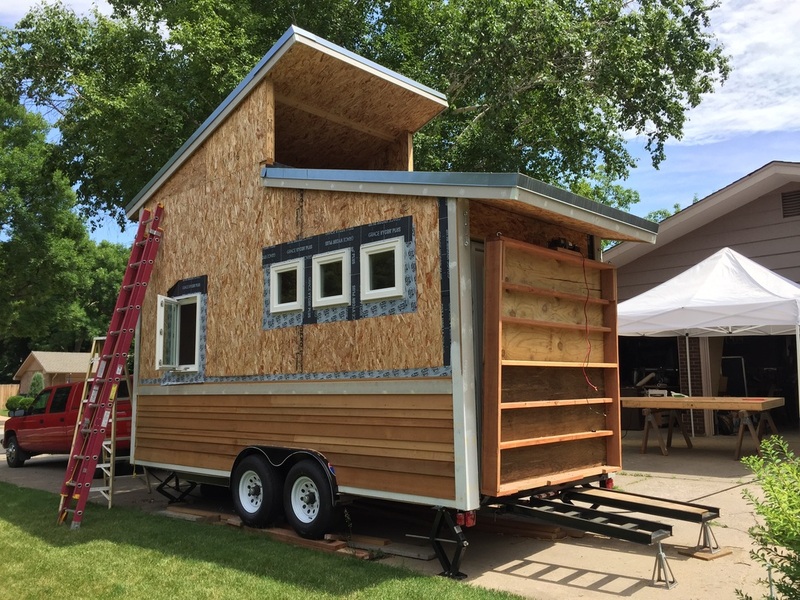 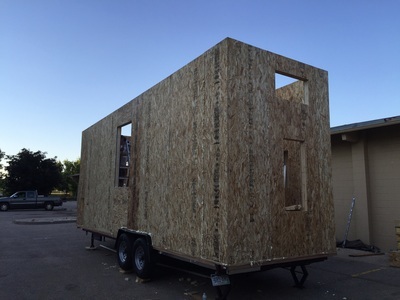 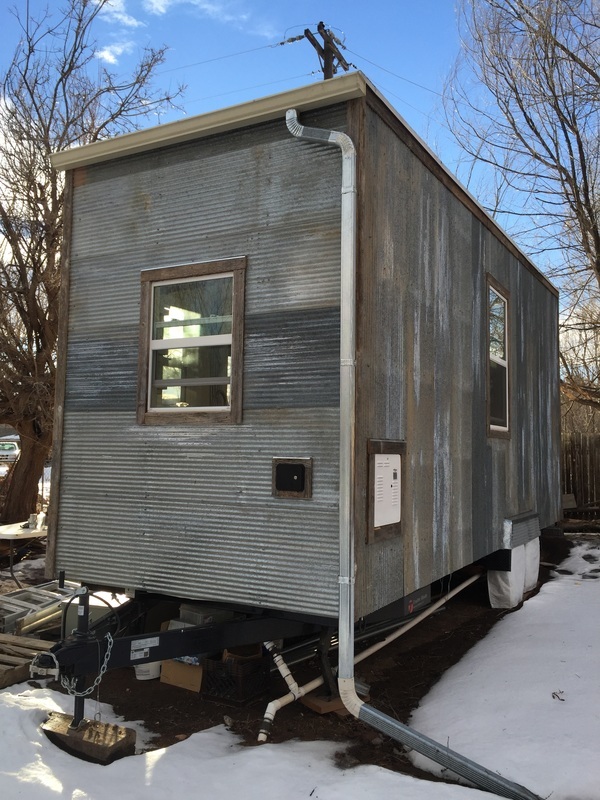 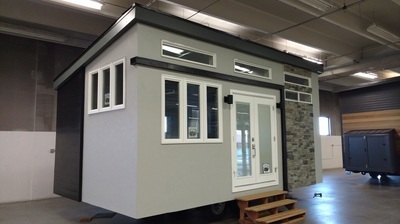 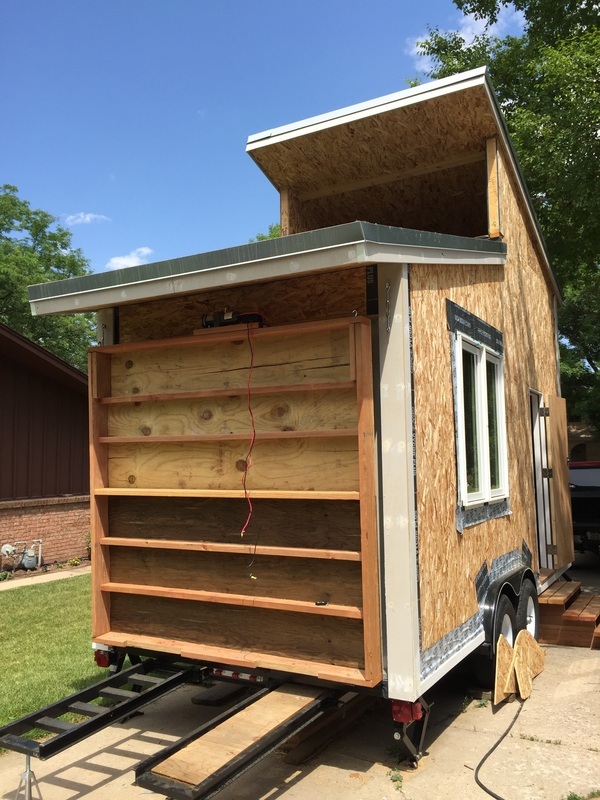 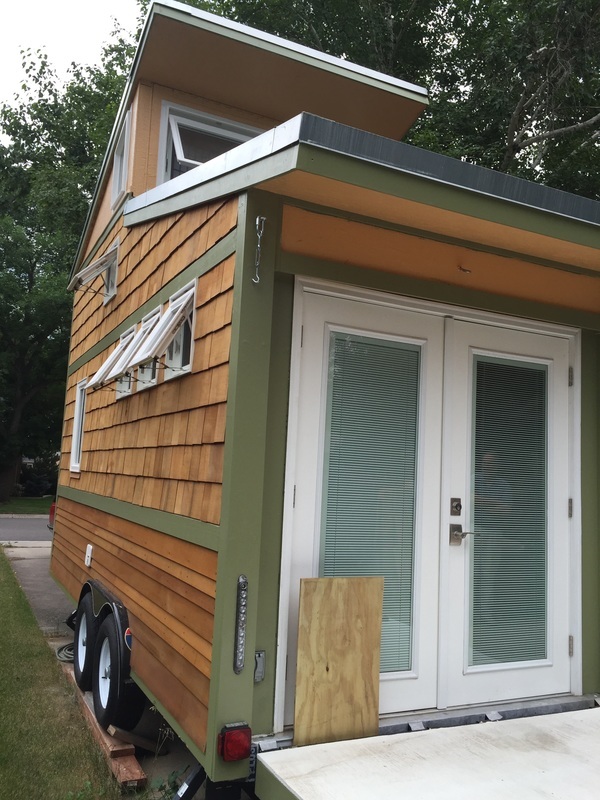 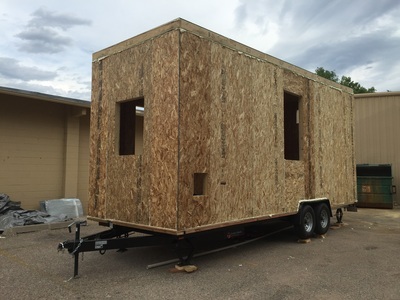 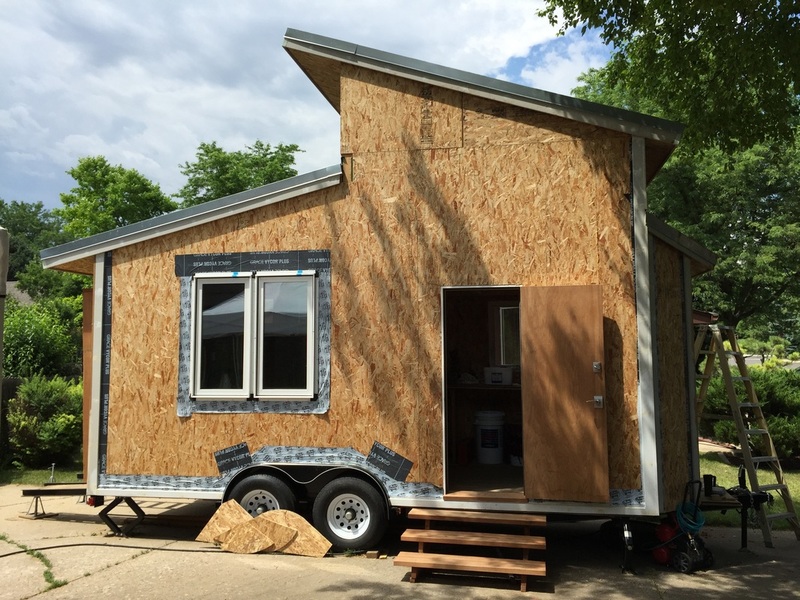 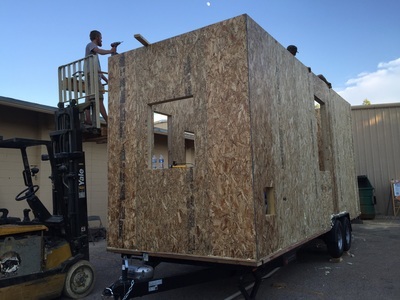 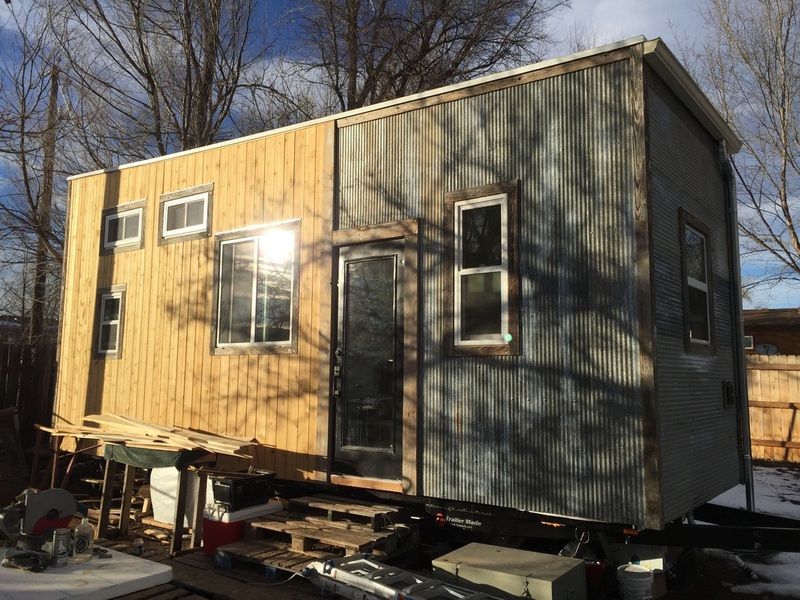 This unit will be on display at the 2nd annual "Tiny House Jamboree" at the Air Force Academy in Colorado Springs, Colorado on August 5th, 6th, and 7th, 2016. See Aaron's website at ​www.OmAhHomes.com. 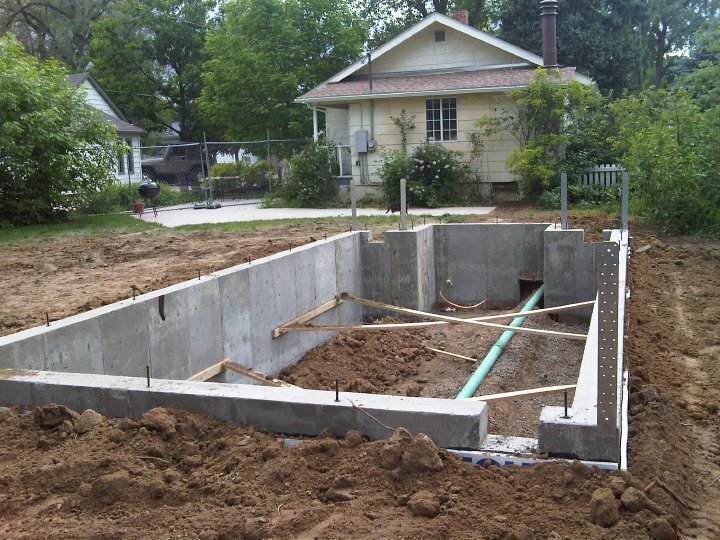 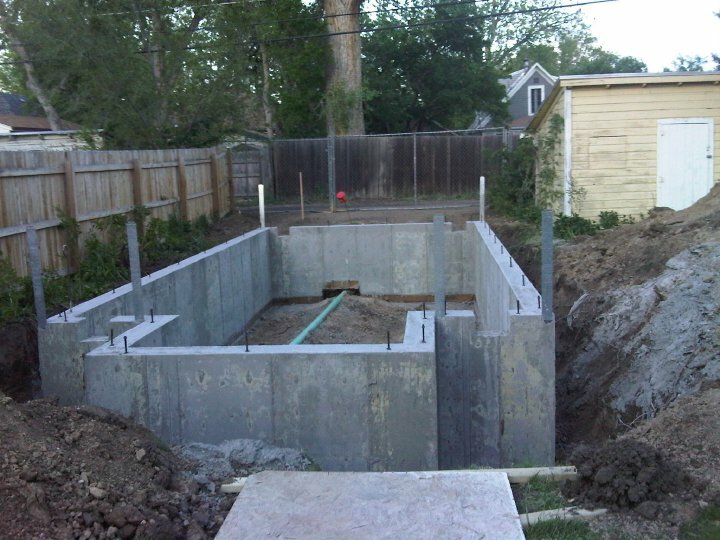 Shelley wanted an "additional dwelling unit" or "ADU" in her backyard. 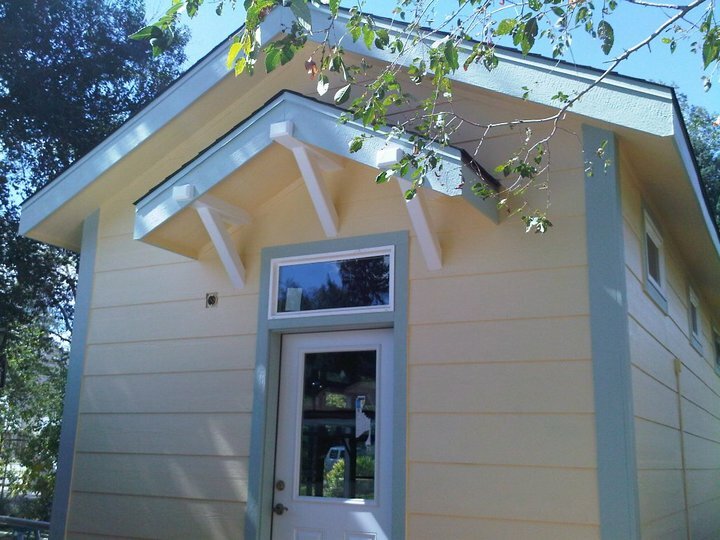 She designed this beautiful and efficient "Carriage House." 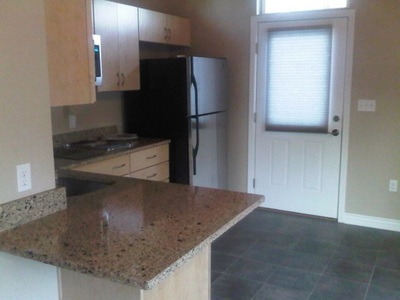 It is a great rental income unit, as she lives in "the big house" on the front of her urban lot. 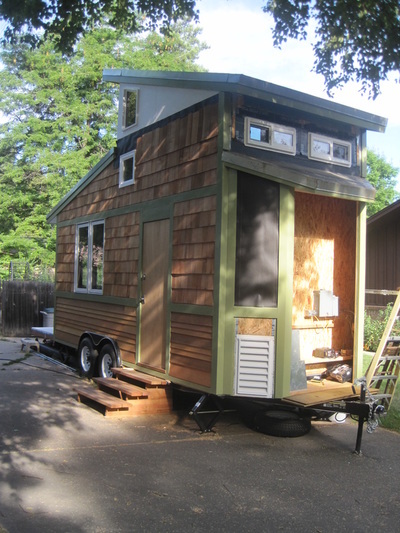 Eventually, when she retires, she will move into the ADU and rent out the big house for additional income. 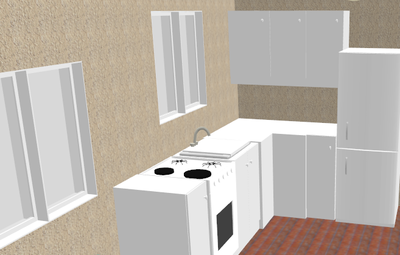 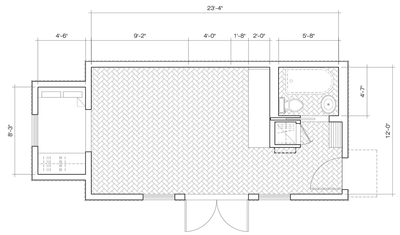 The main level has 318 square feet of interior floor space. 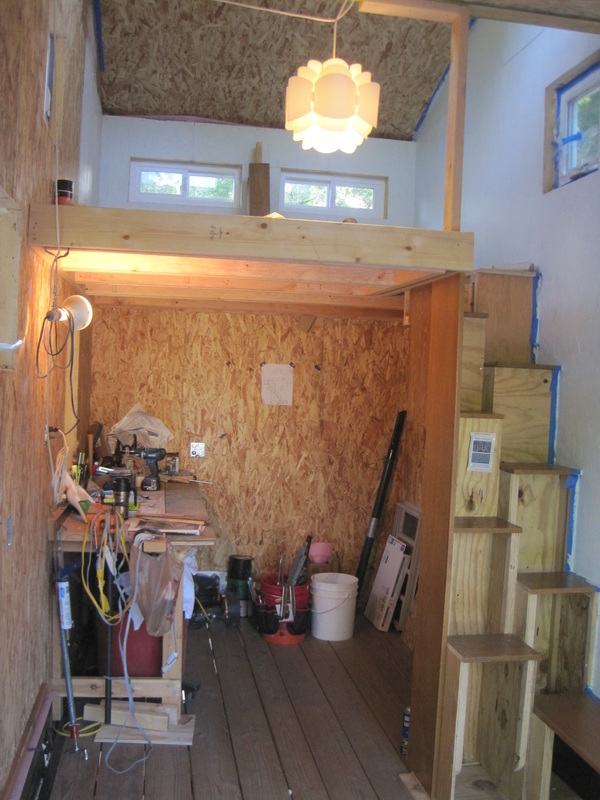 There is a loft with 37 square feet. 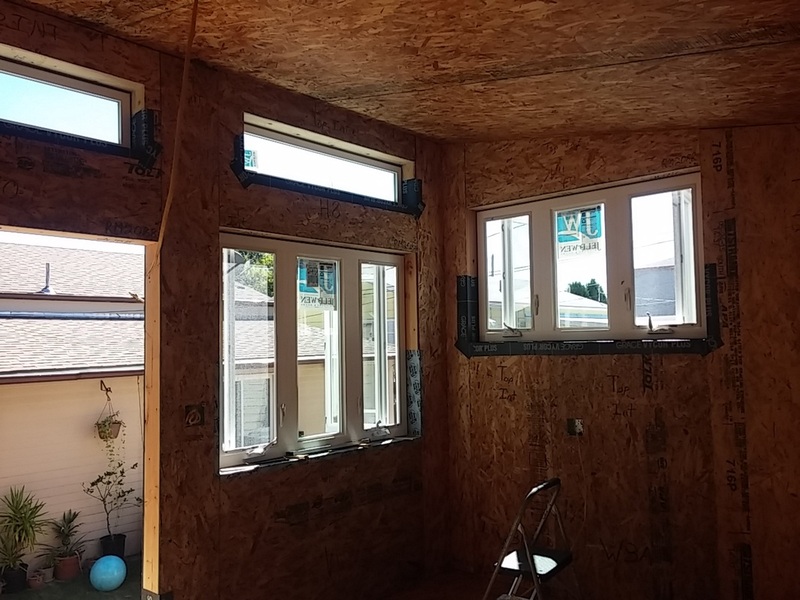 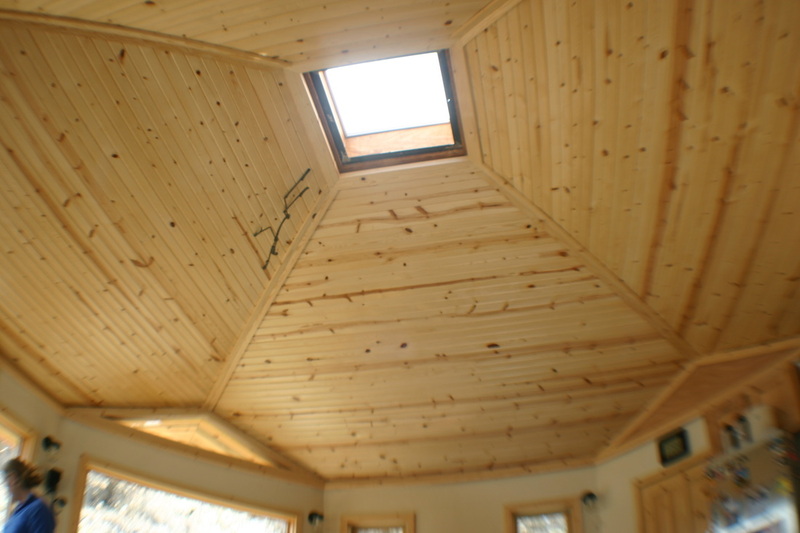 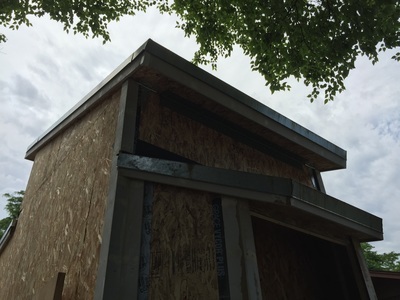 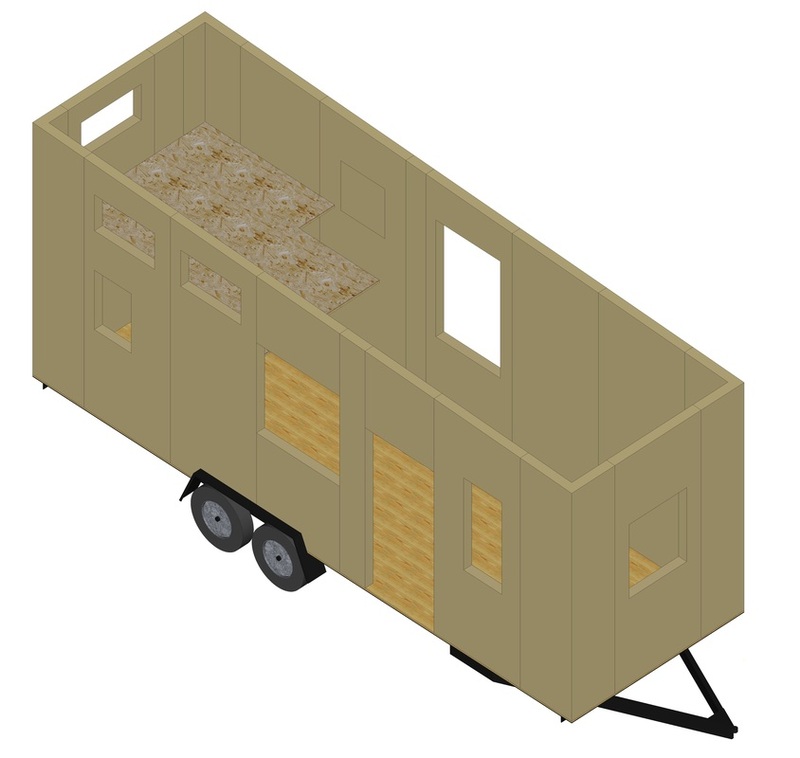 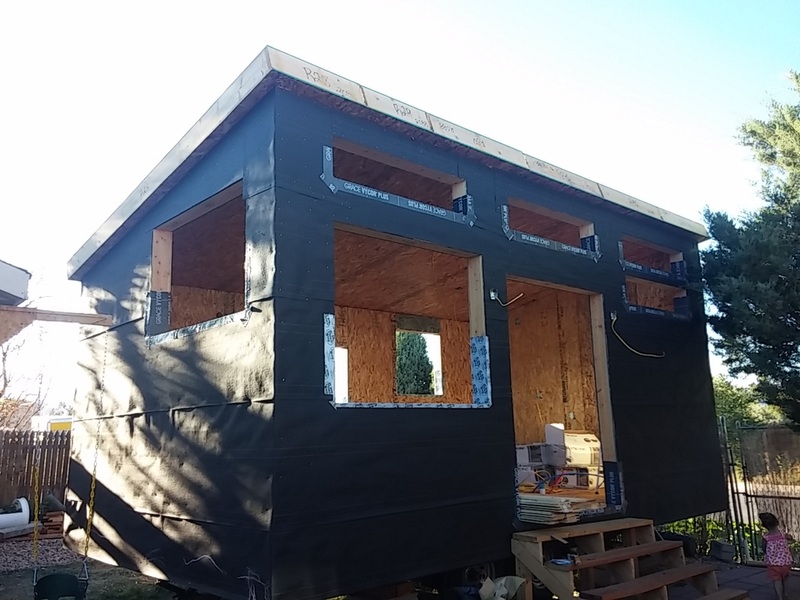 The ADU is built with R-42 (6.5"-thick) ICS SIPs walls and roof and passive-solar concepts, making it extremely energy-efficient. 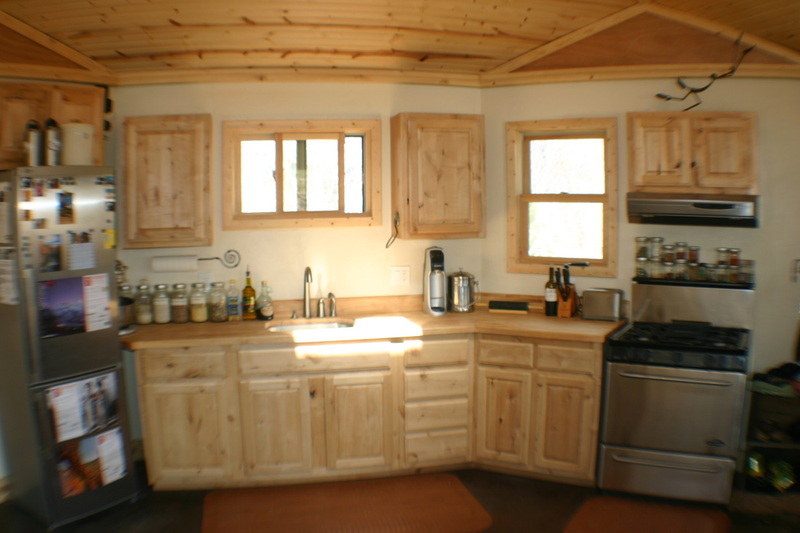 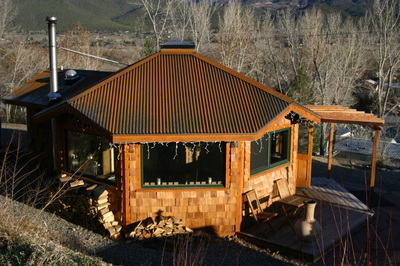 Kale and his wife Laura selected a cabin kit from ICS SIPs. 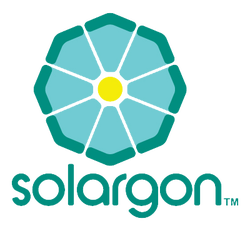 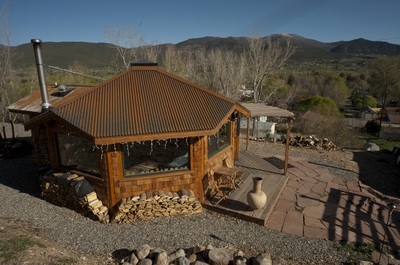 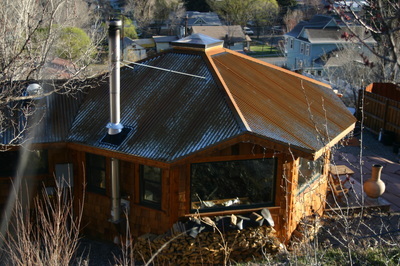 This 311 square-foot "Solargon" (passive solar octagon) is 20 feet in diameter. 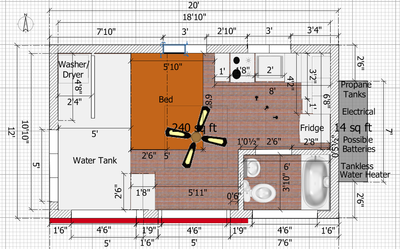 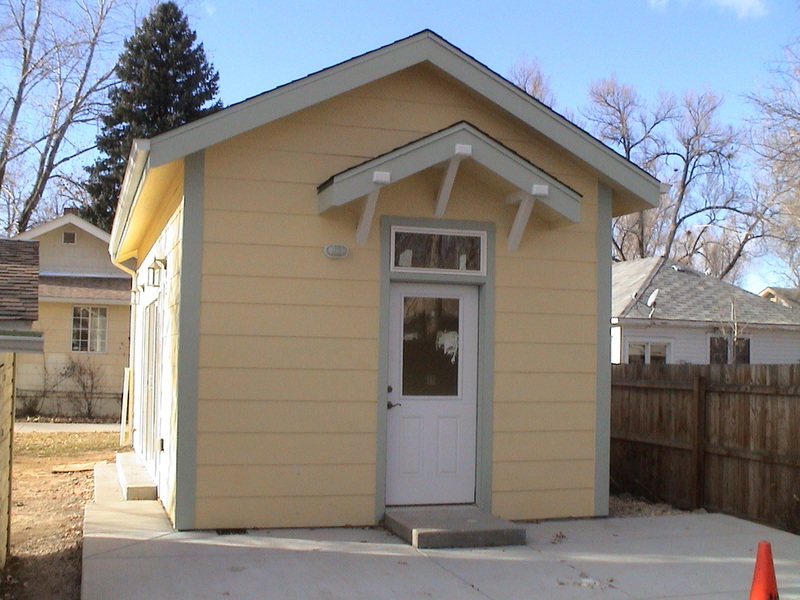 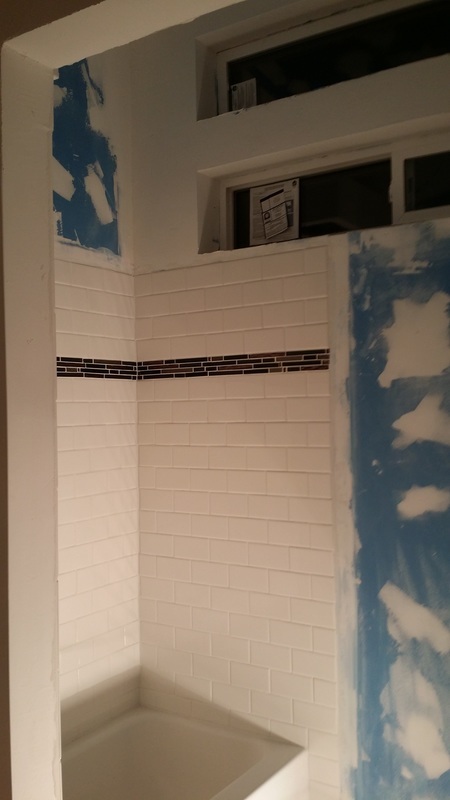 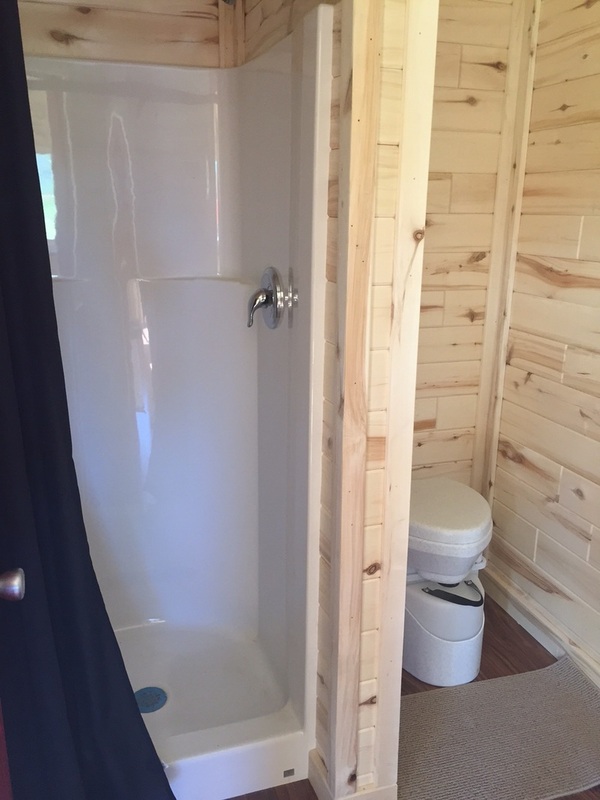 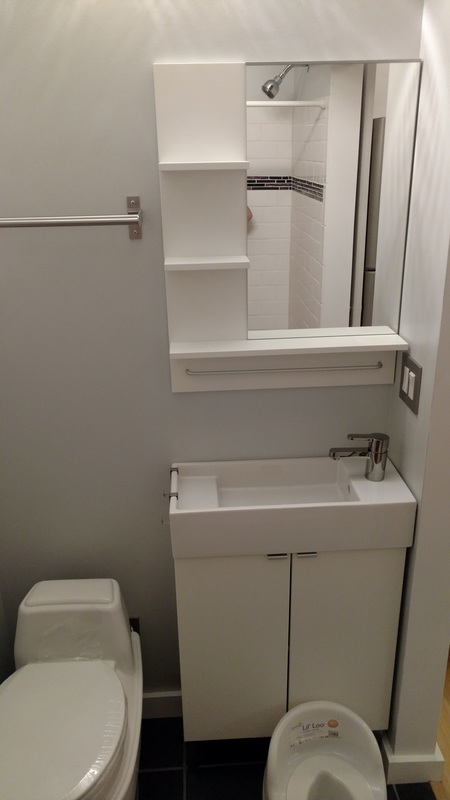 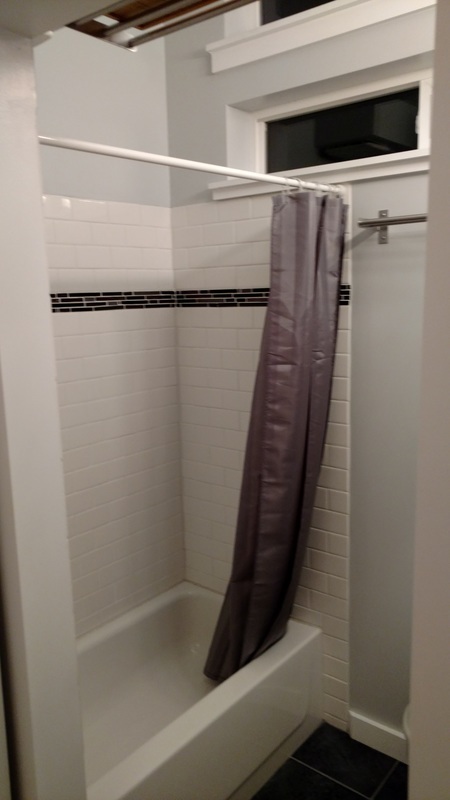 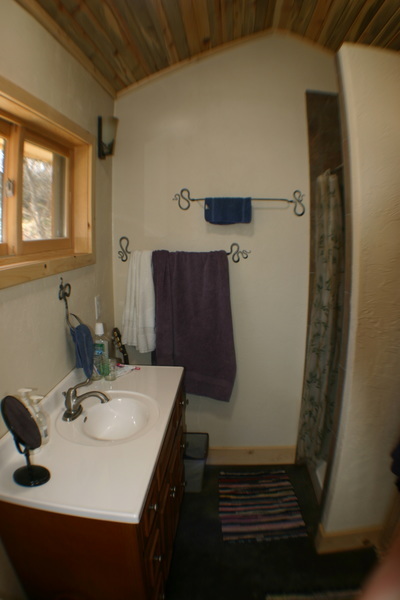 They added a 64 square-foot bathroom addition. 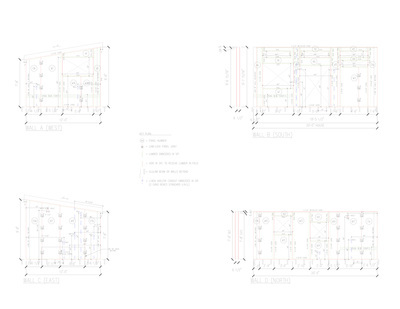 The walls are R-28 (4.5"-thick) ICS SIPs and the roof is R-42 (6.5"-thick) ICS SIPs. 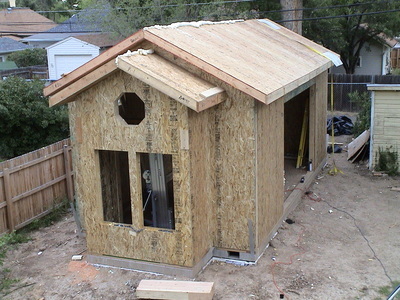 The SIPs shell was erected in one day. 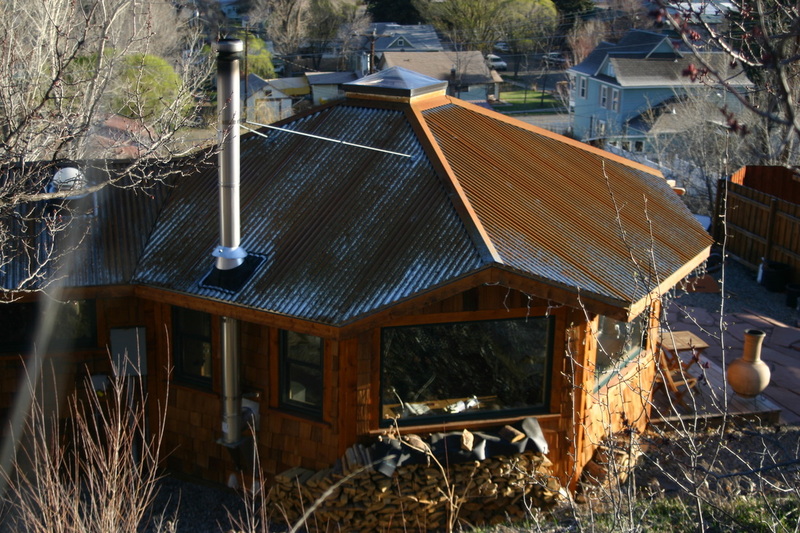 They finished the exterior and interior beautifully and their home was featured in Bridgette Meinhold's book Urgent Architecture: 40 Sustainable Housing Solutions for a Changing World.